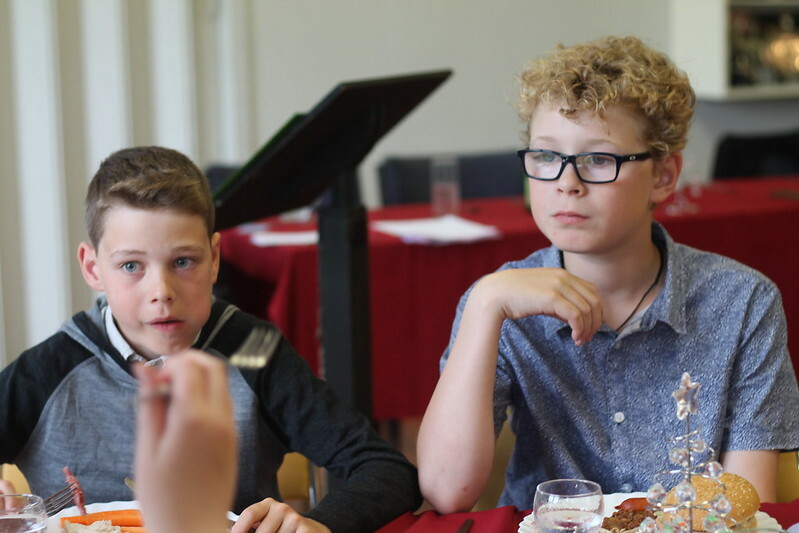 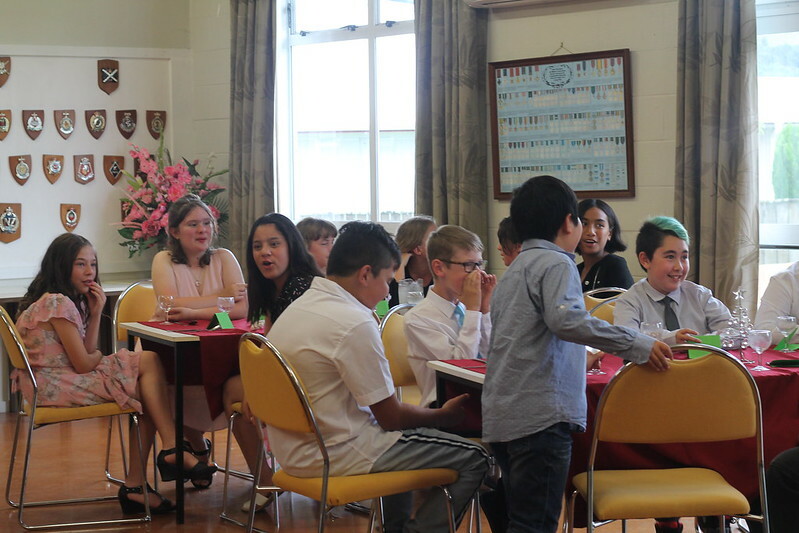 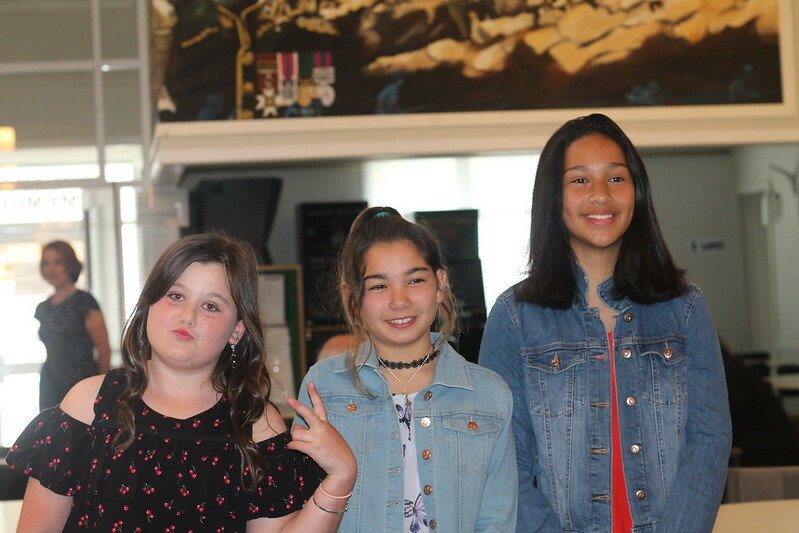 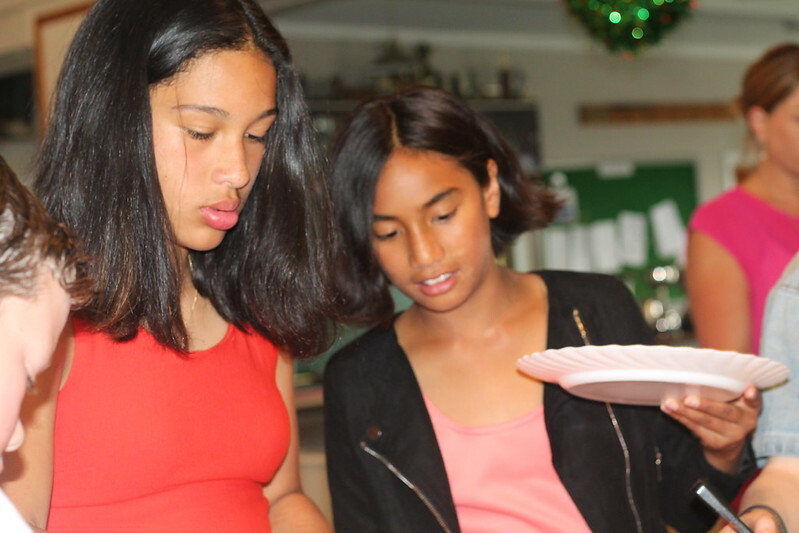 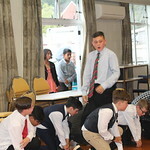 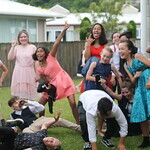 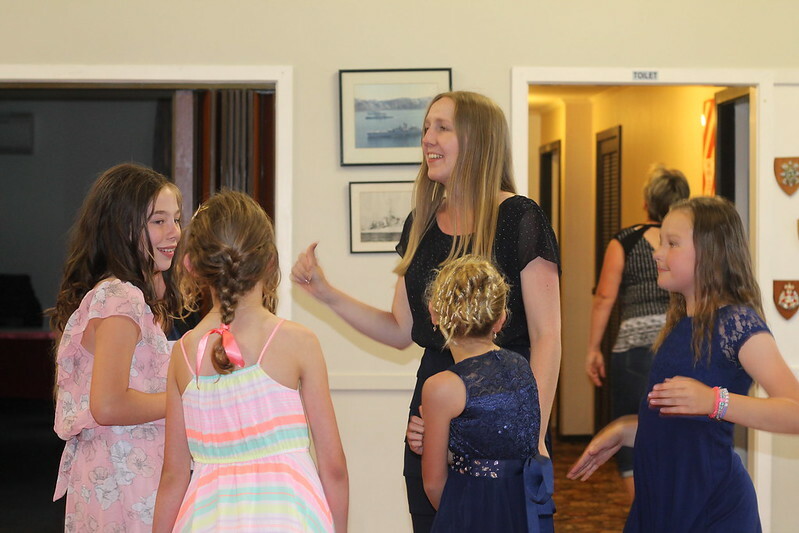 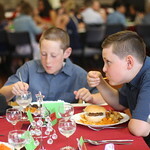 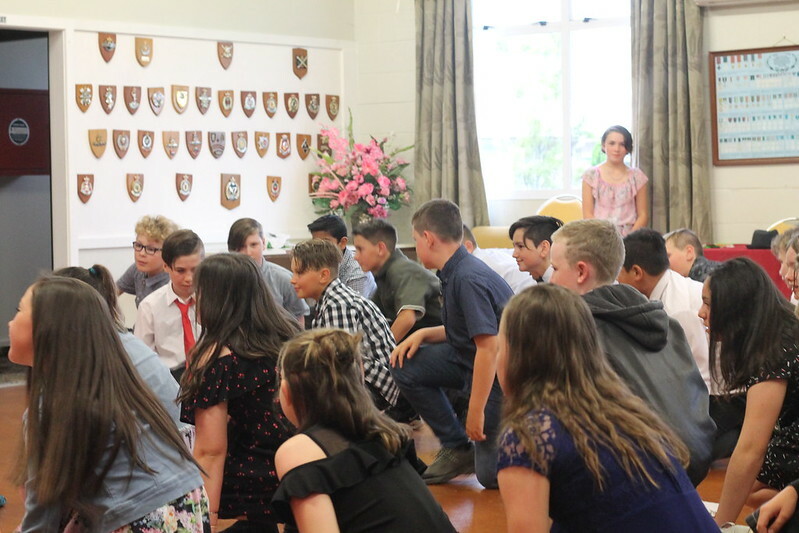 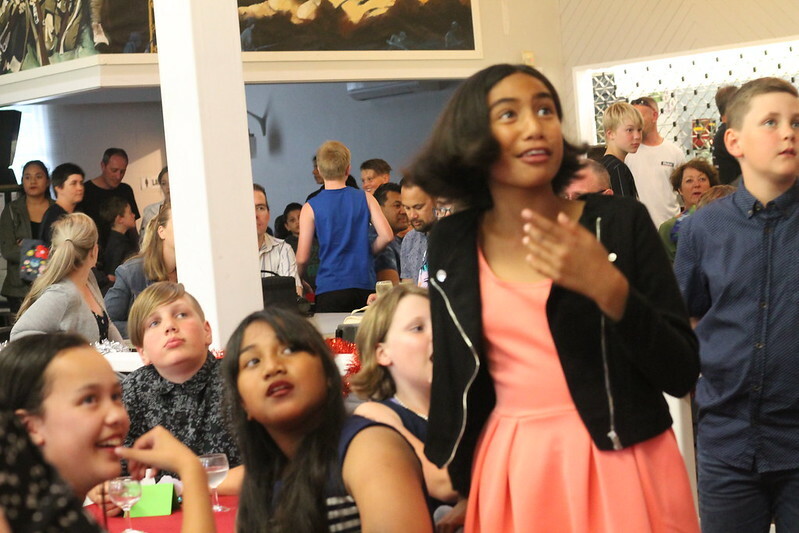 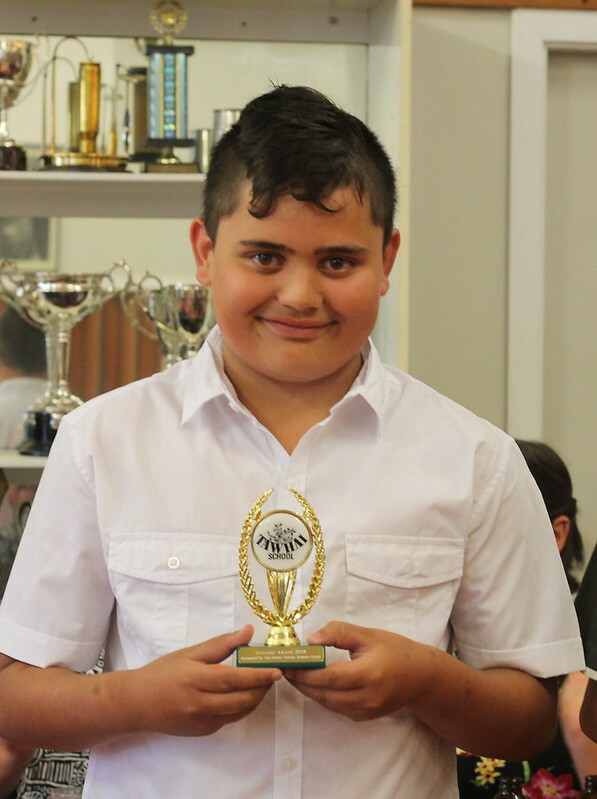 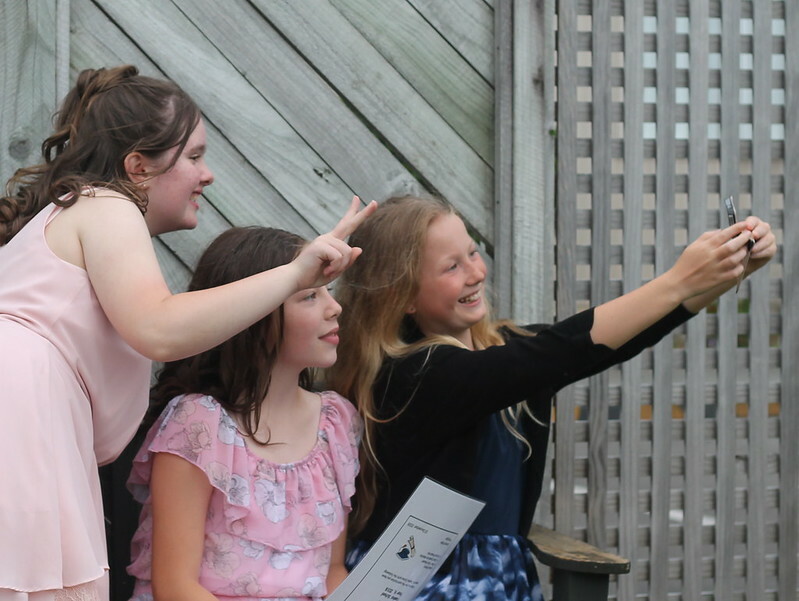 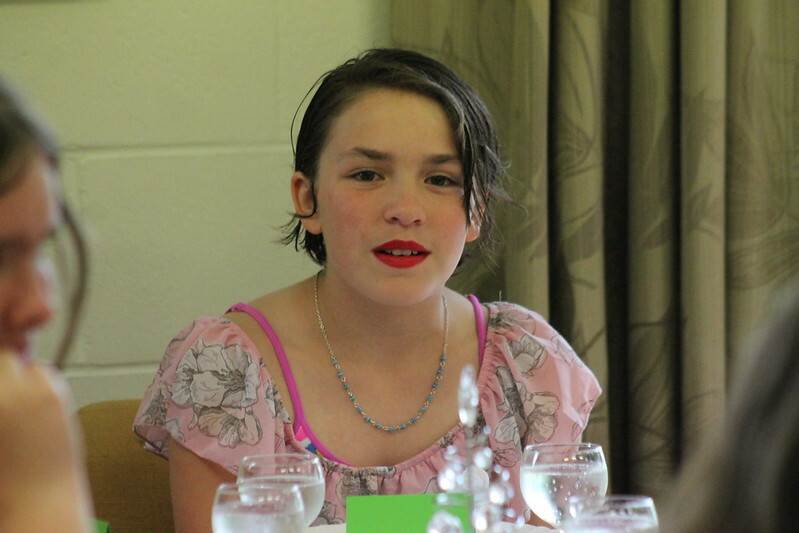 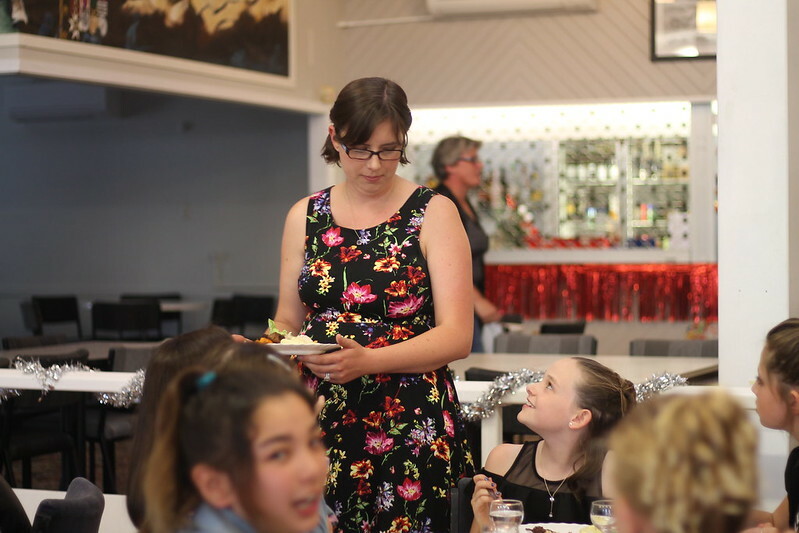 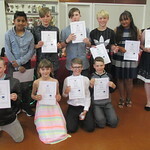 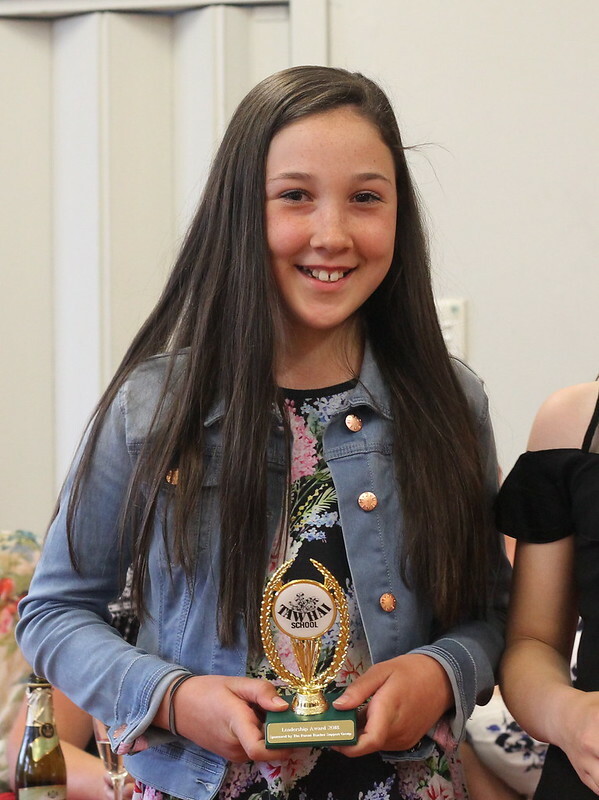 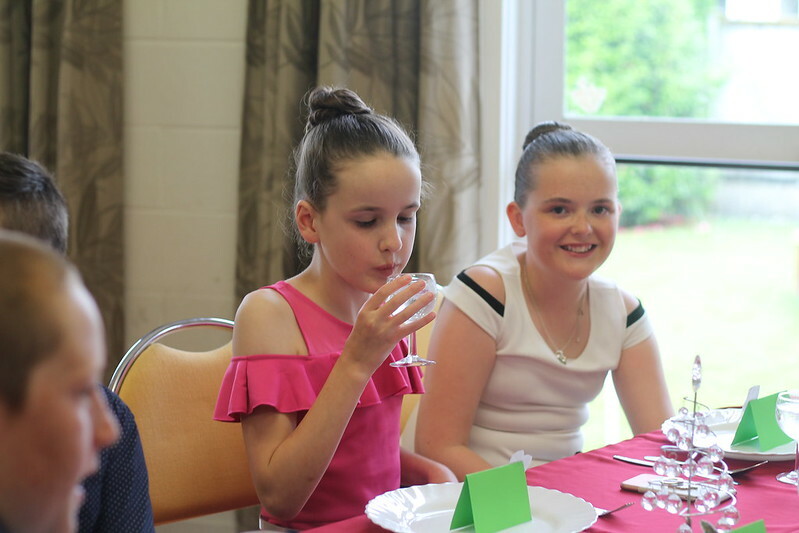 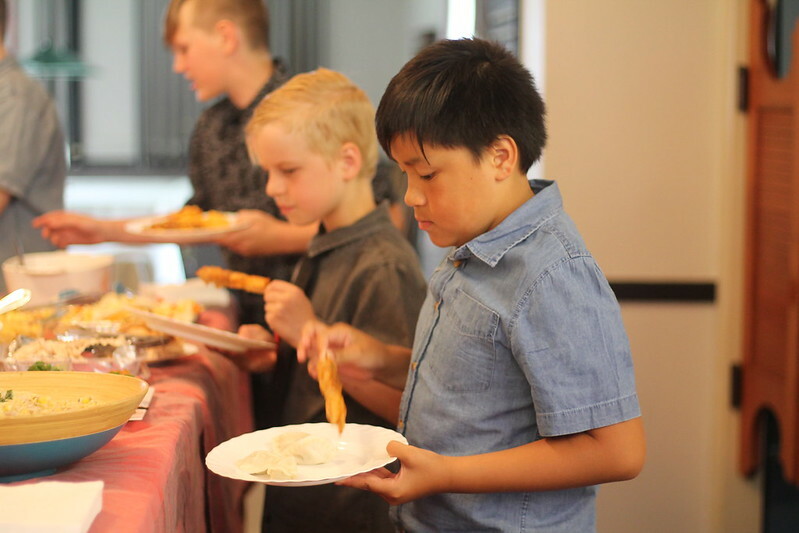 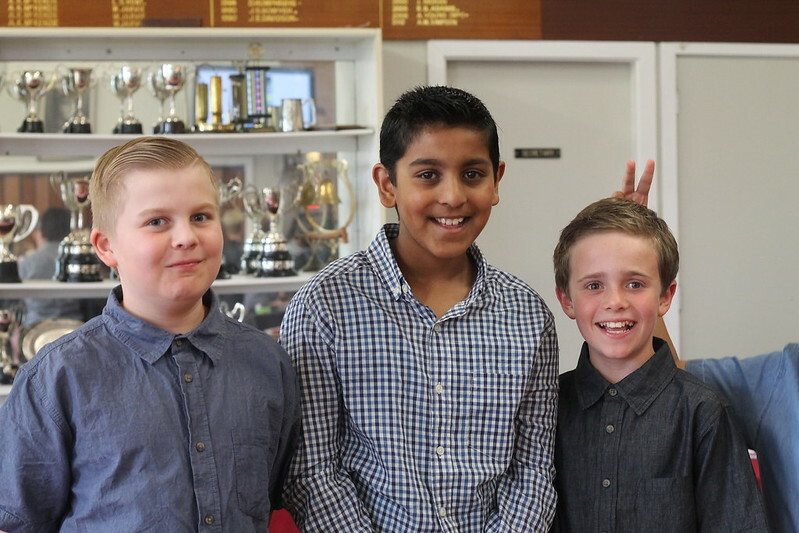 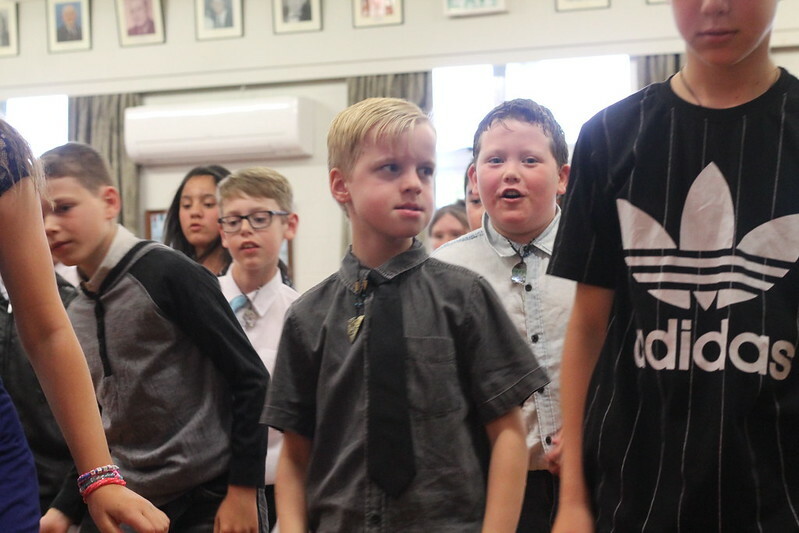 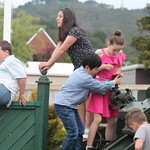 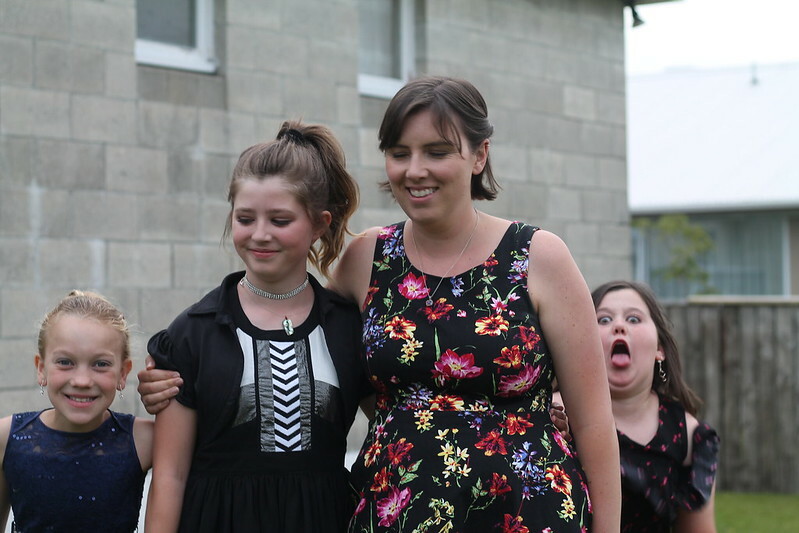 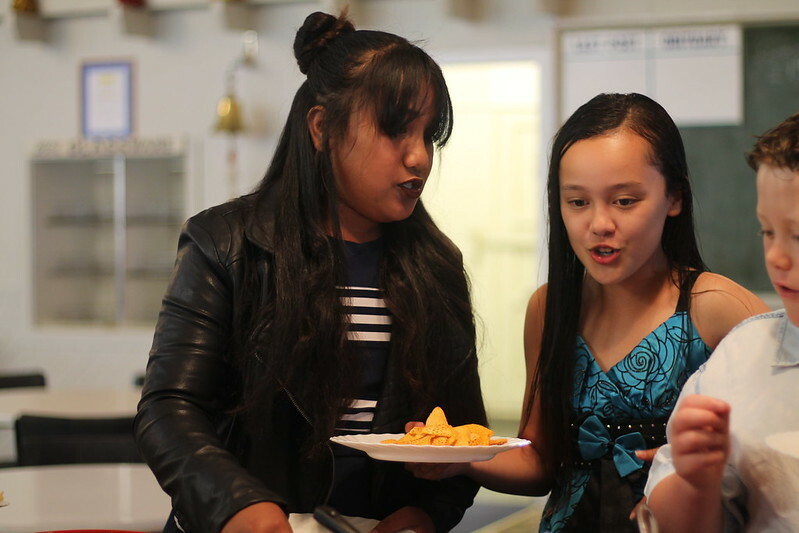 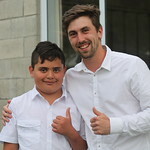 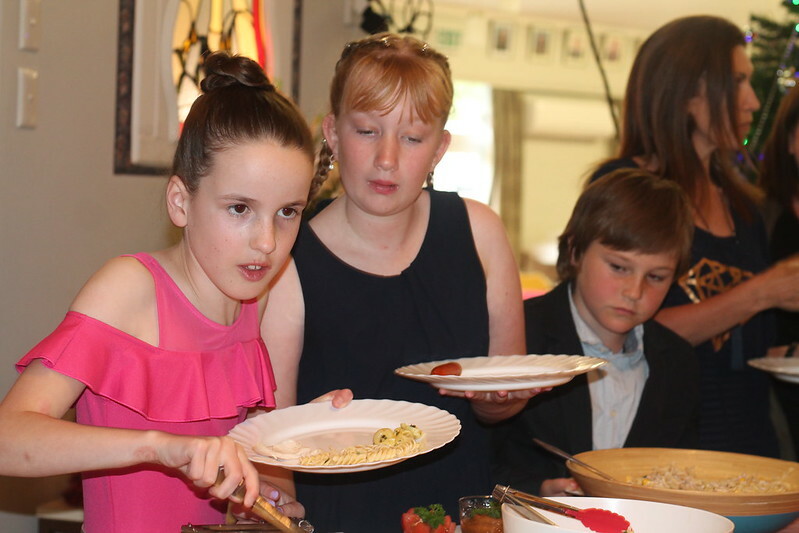 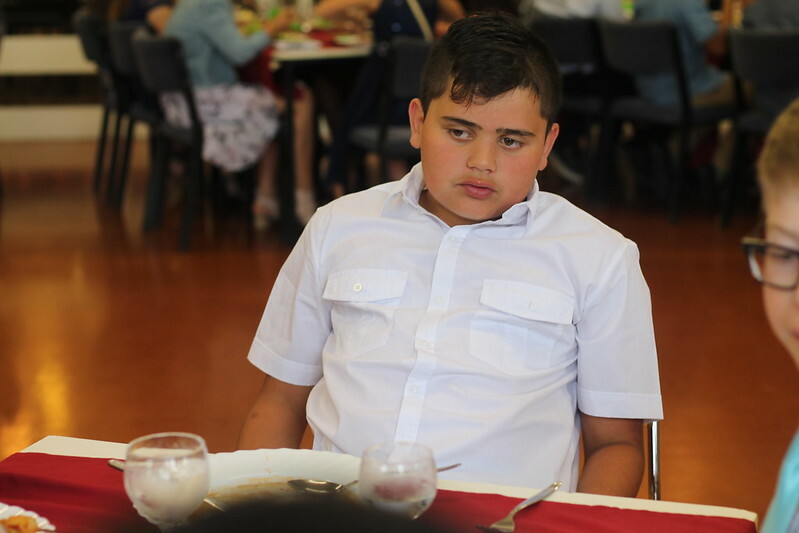 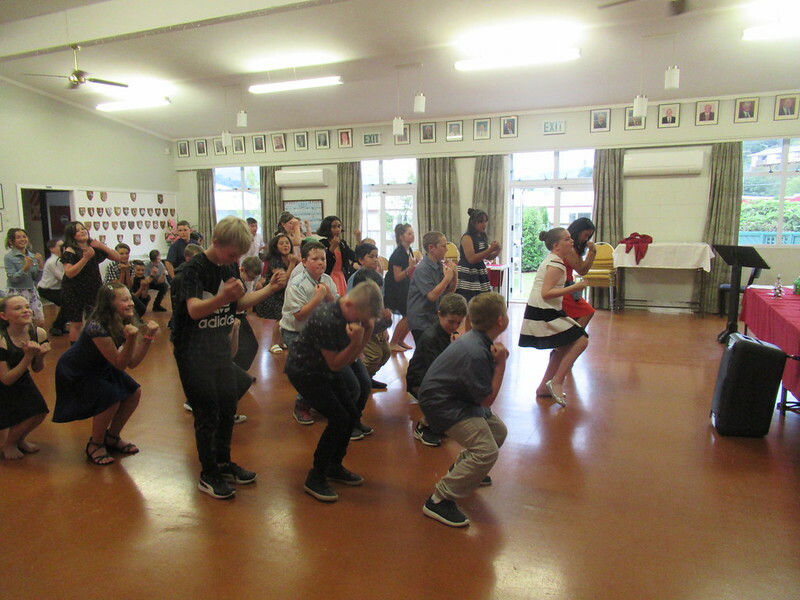 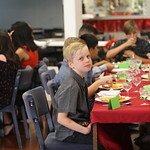 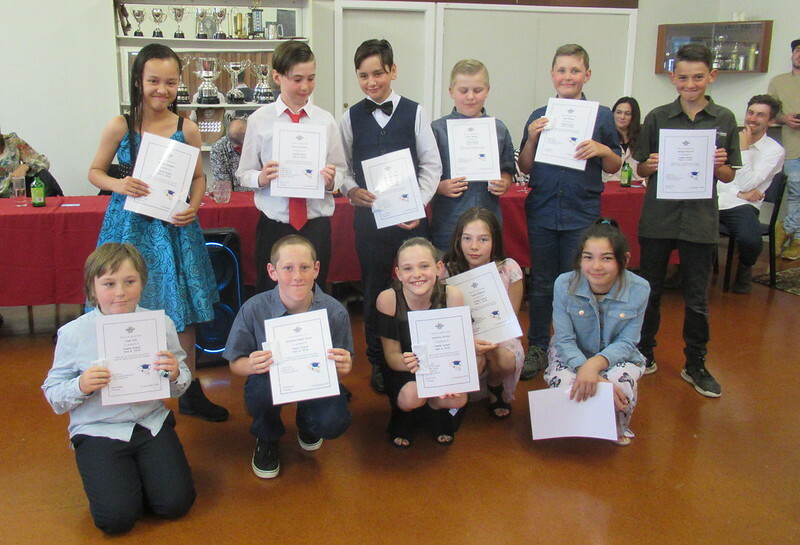 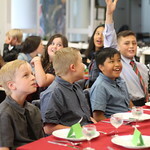 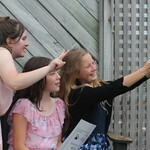 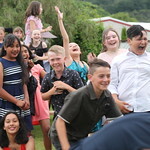 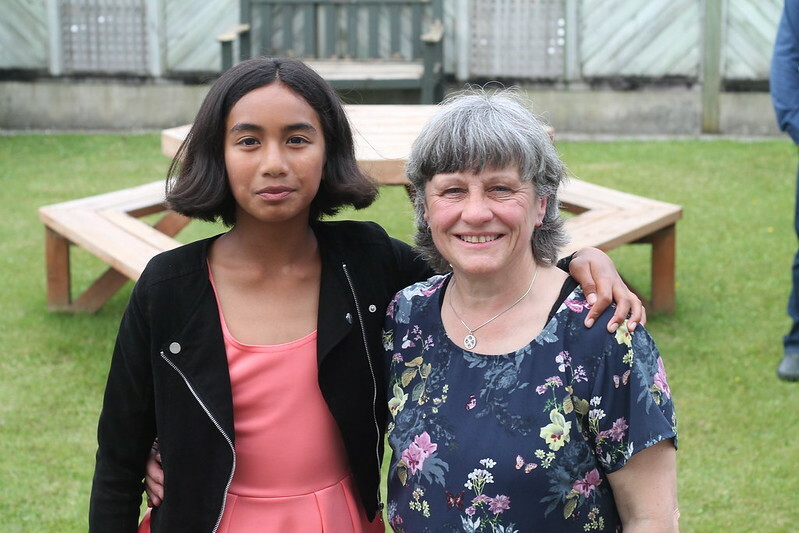 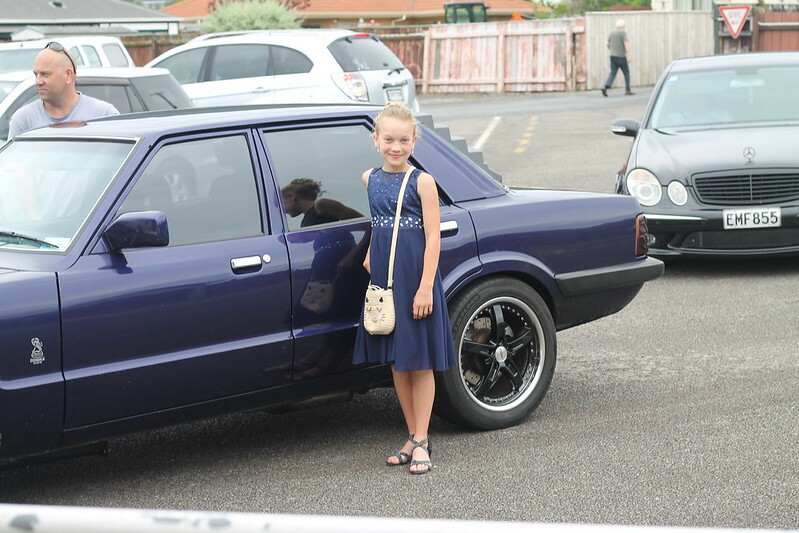 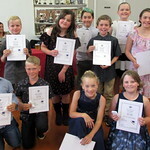 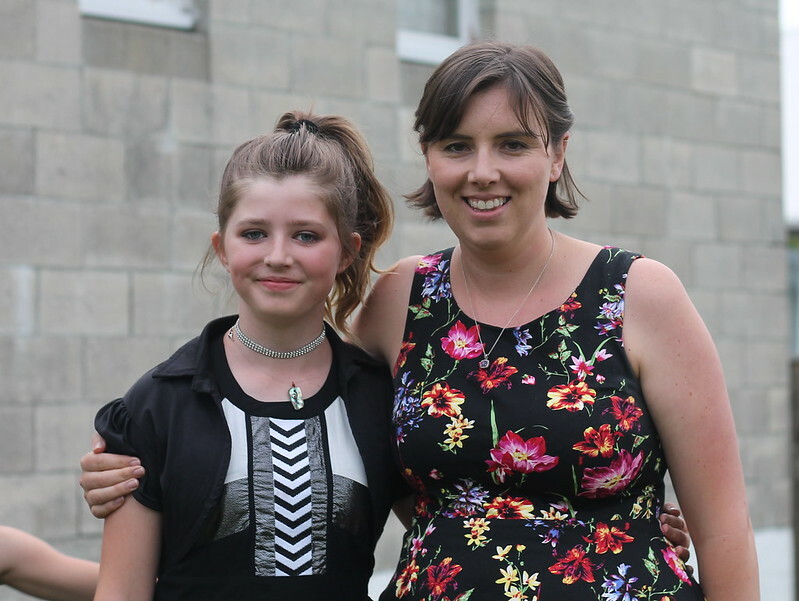 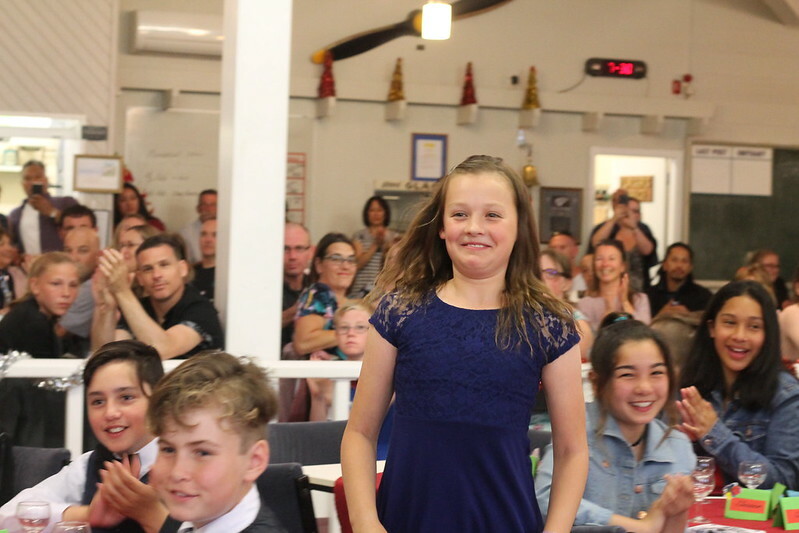 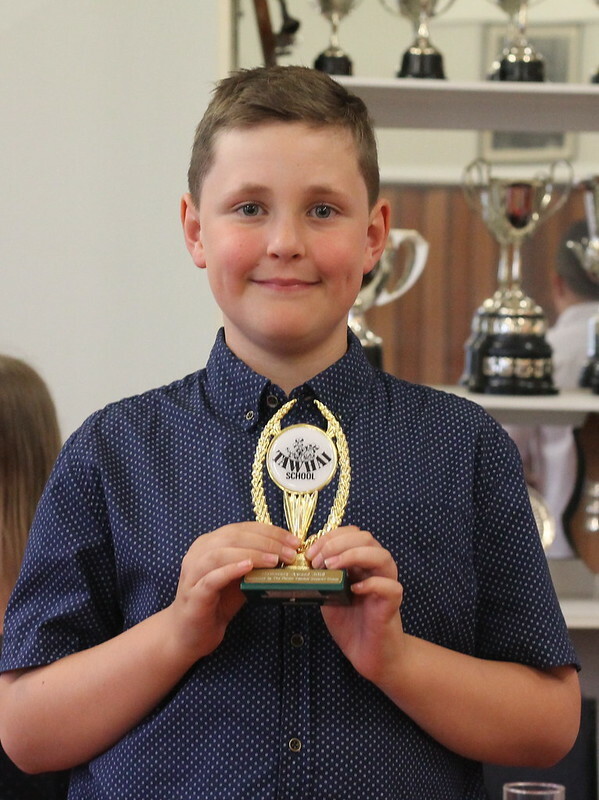 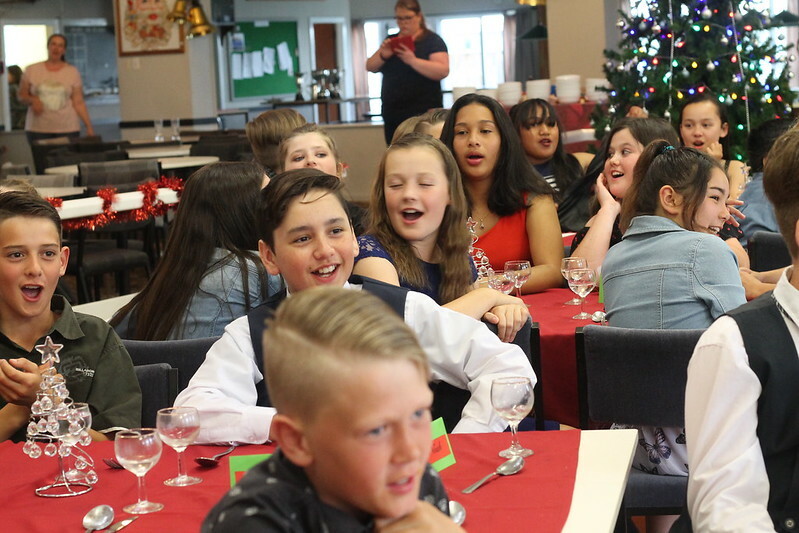 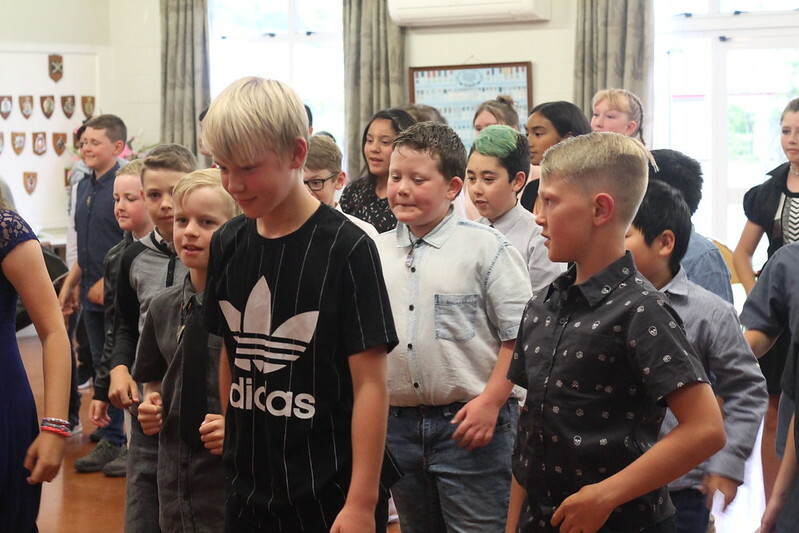 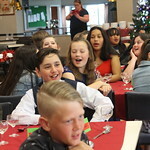 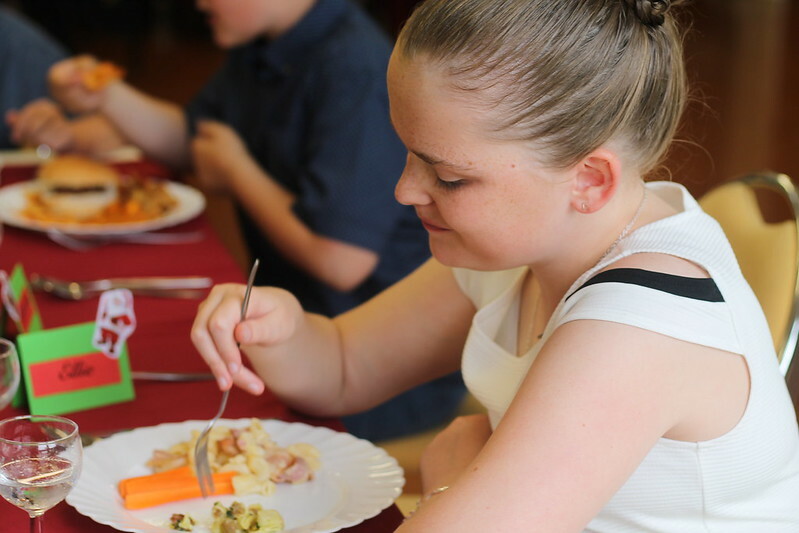 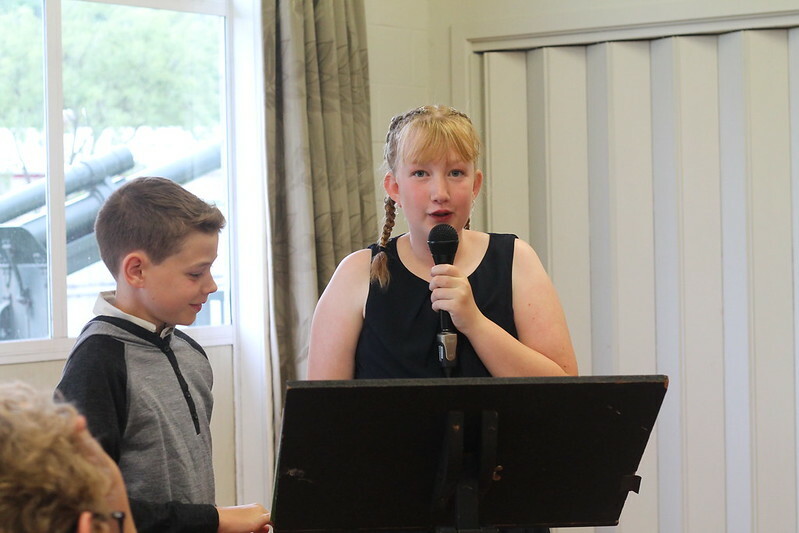 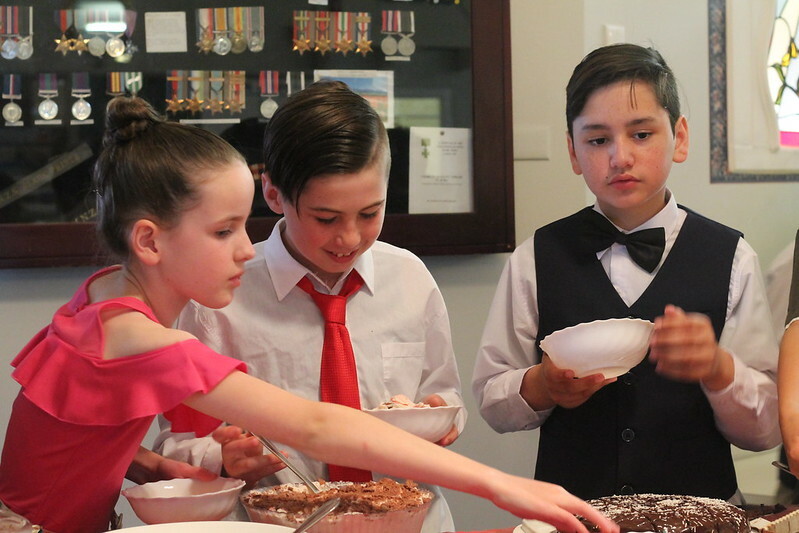 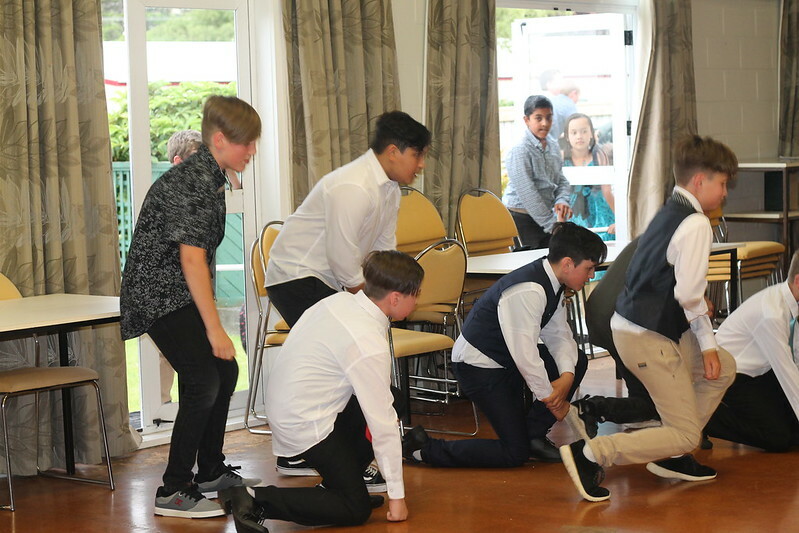 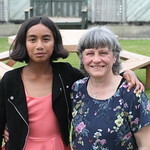 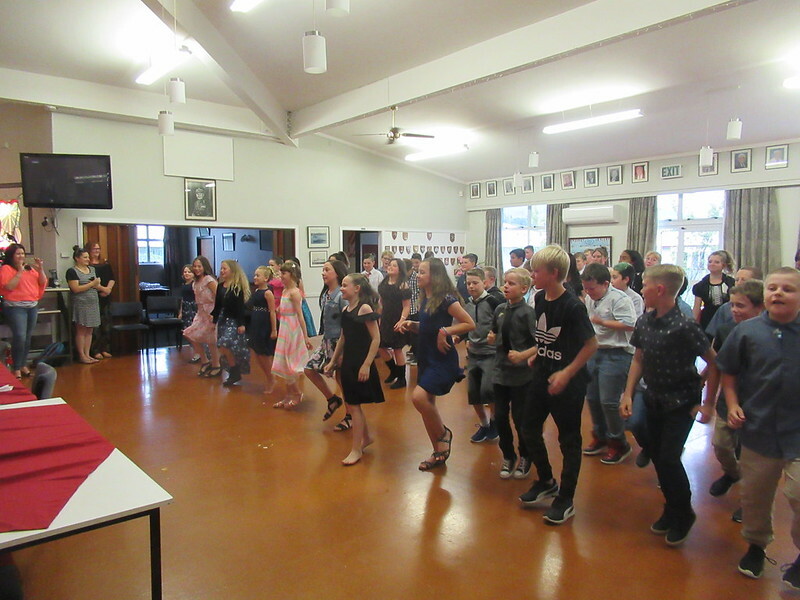 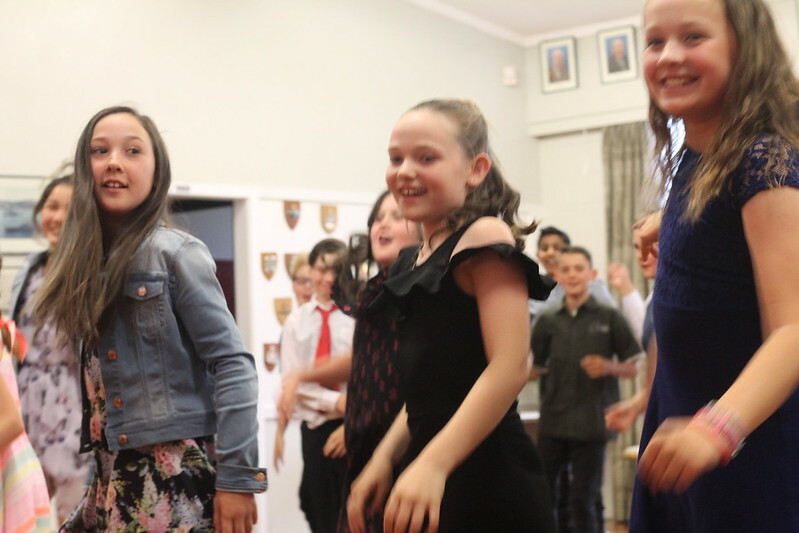 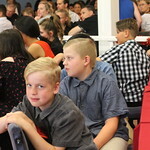 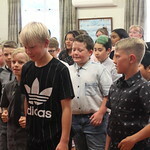 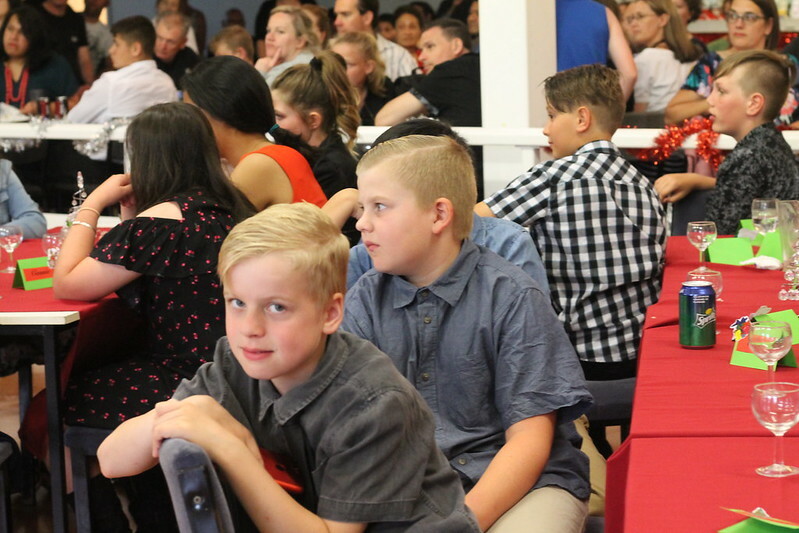 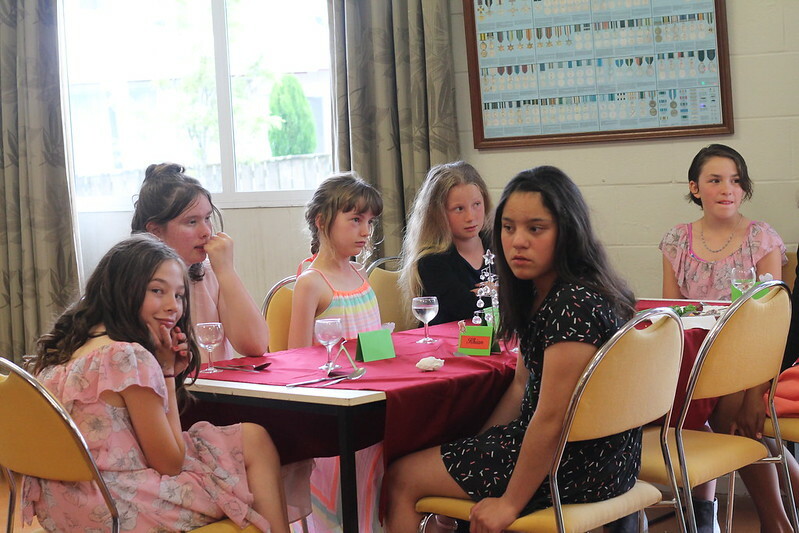 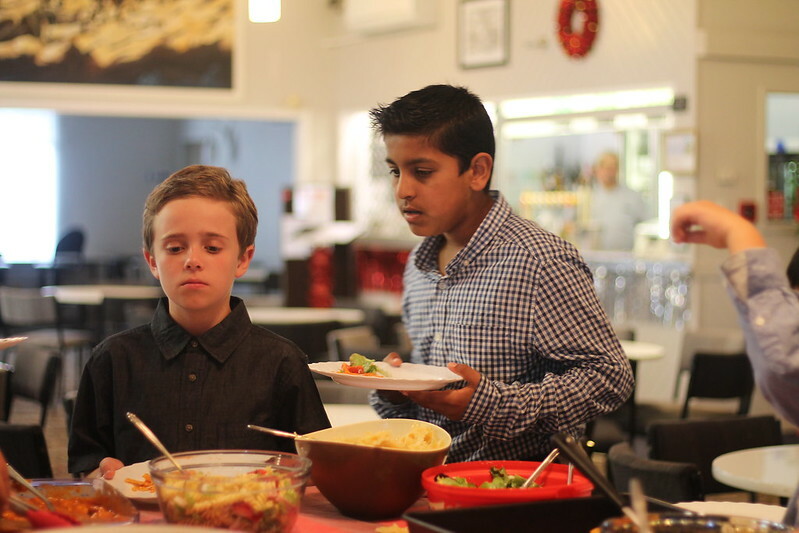 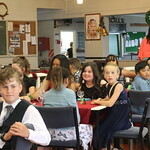 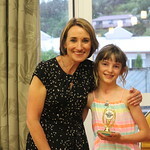 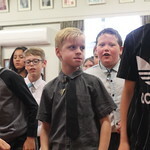 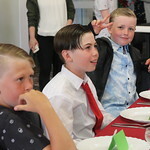 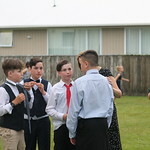 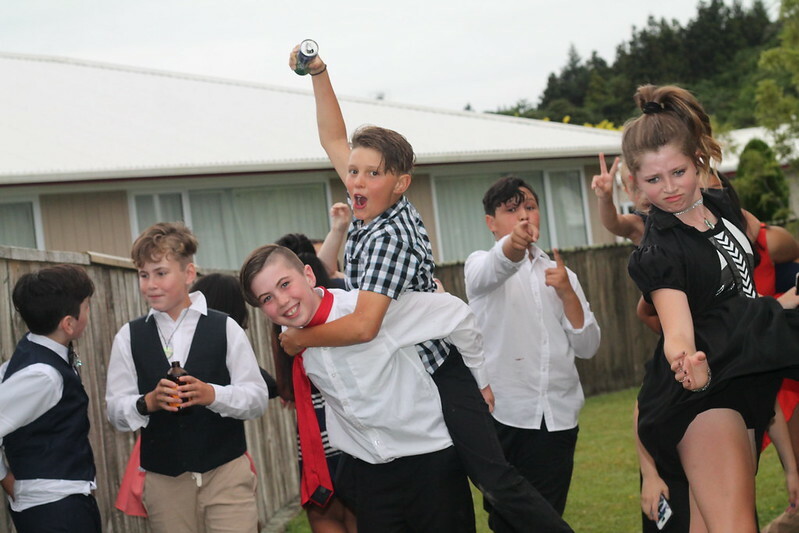 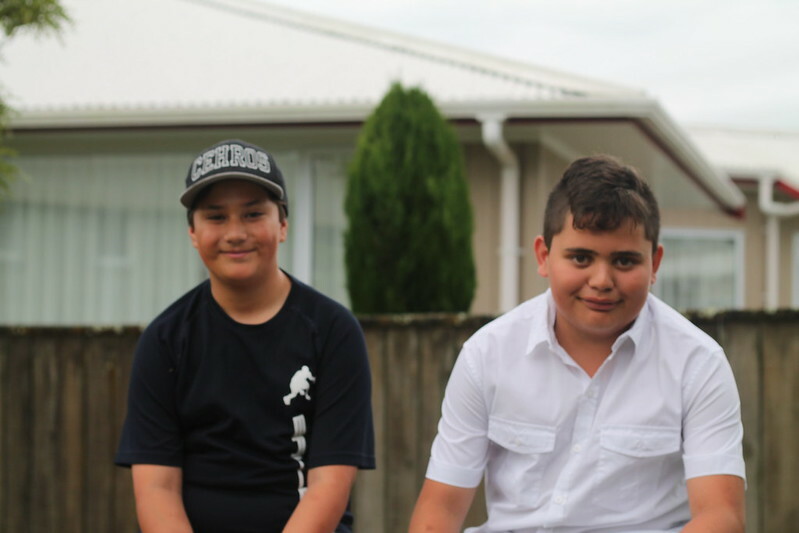 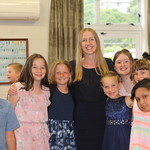 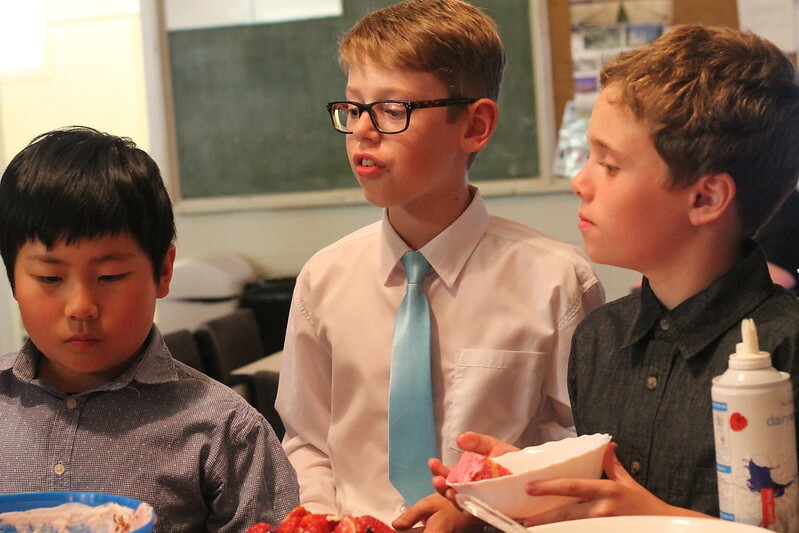 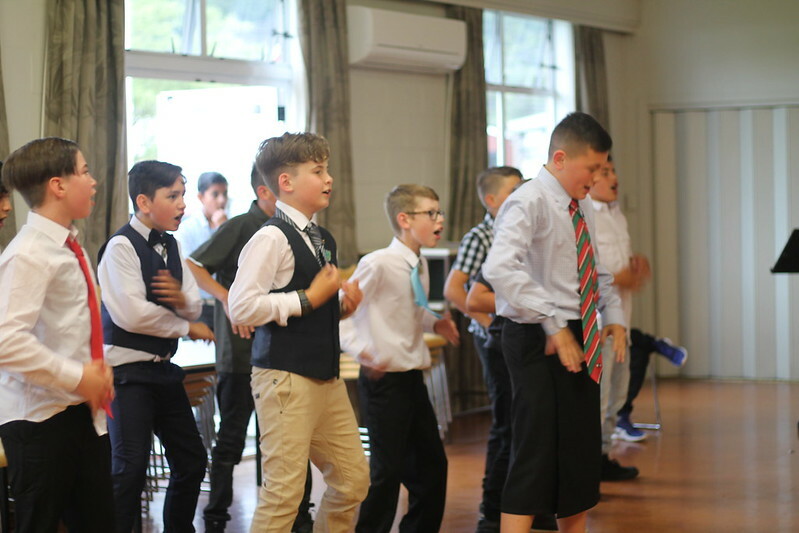 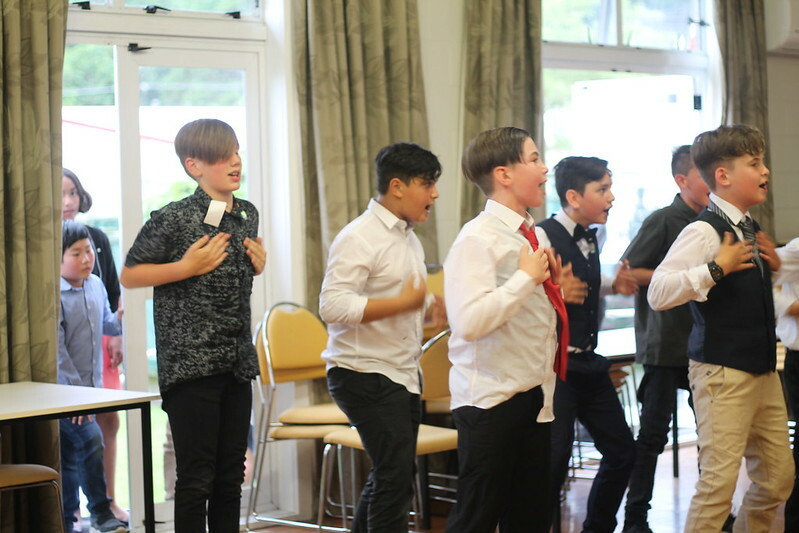 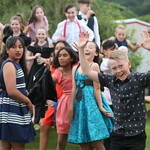 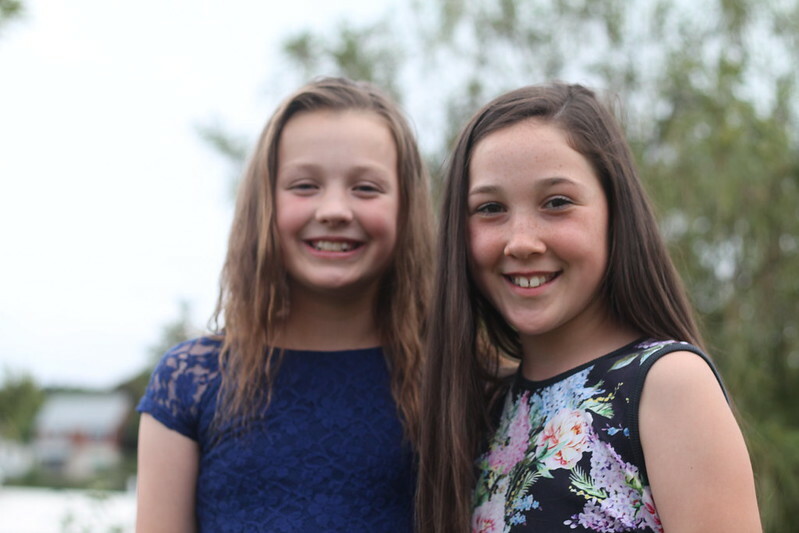 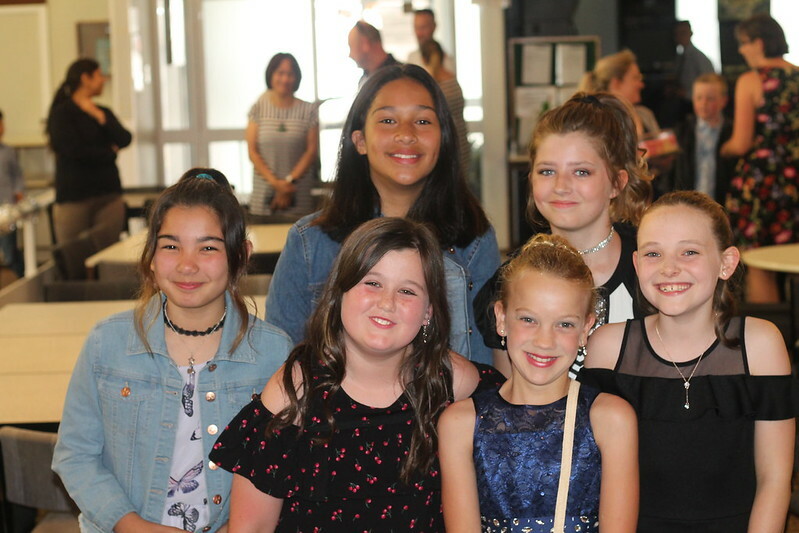 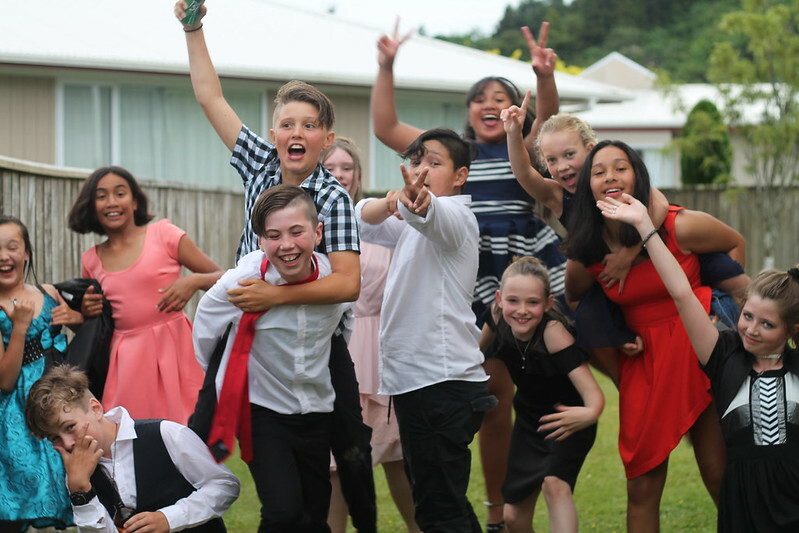 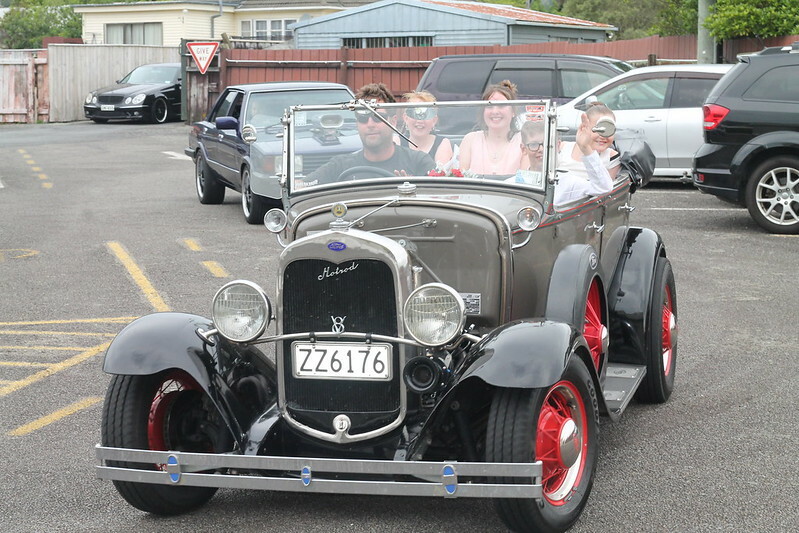 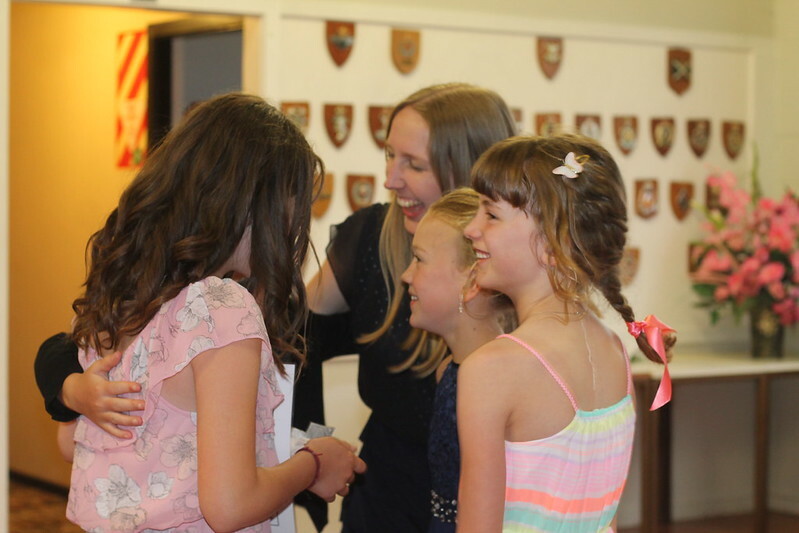 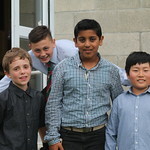 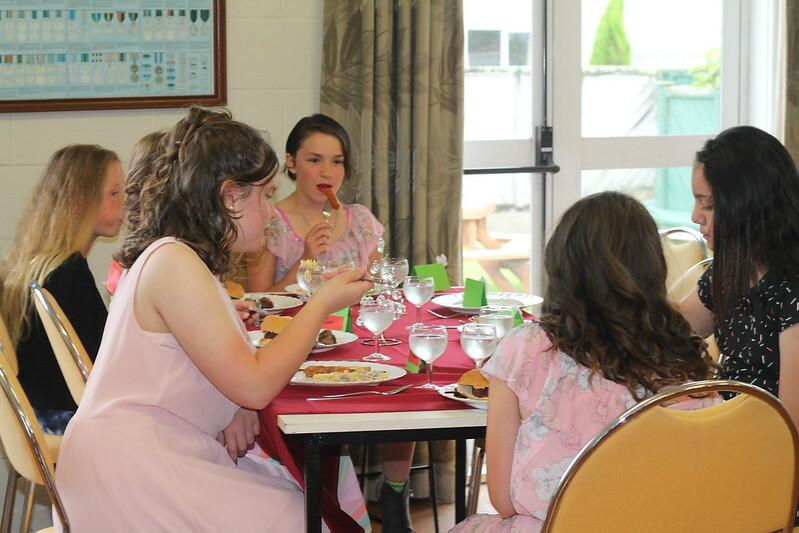 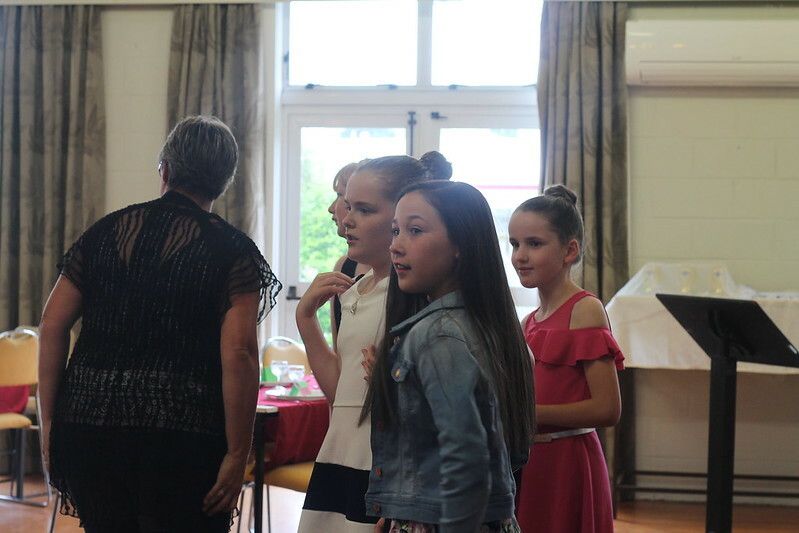 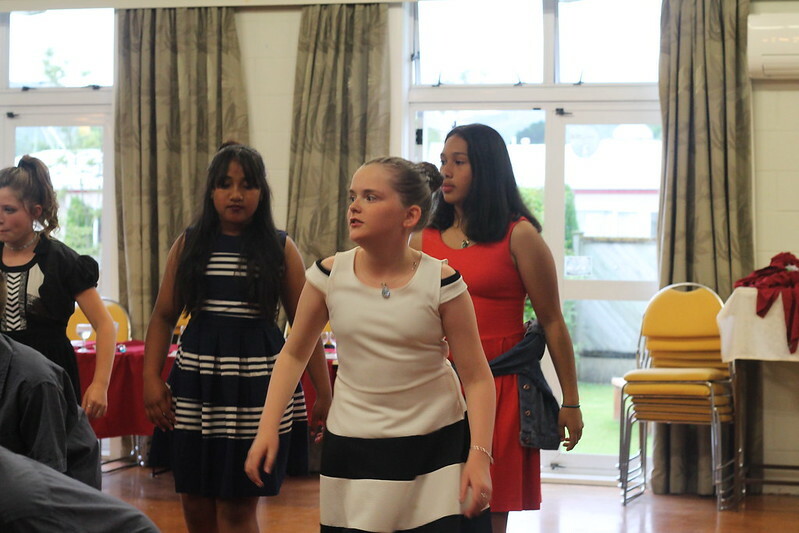 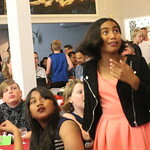 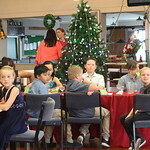 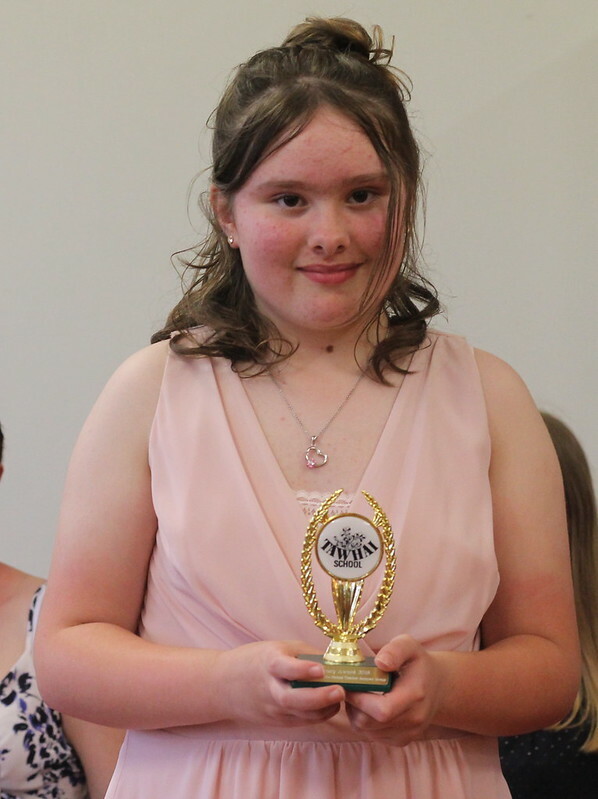 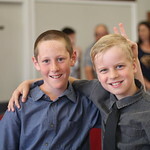 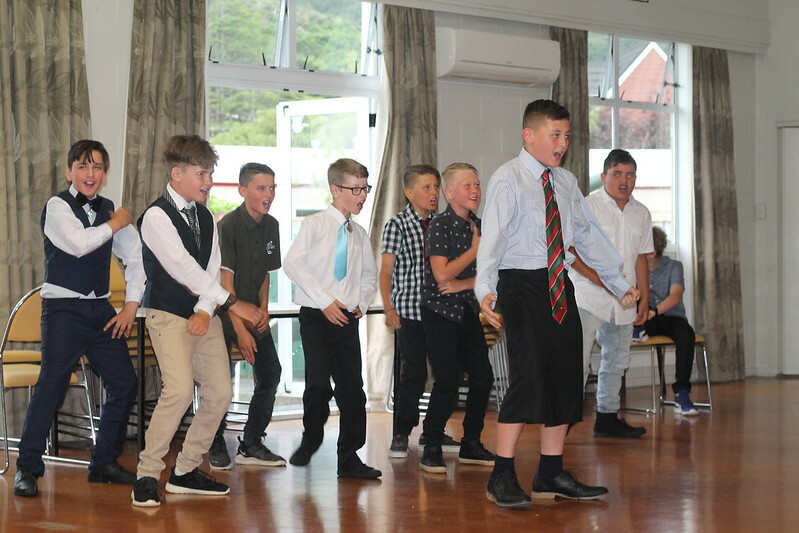 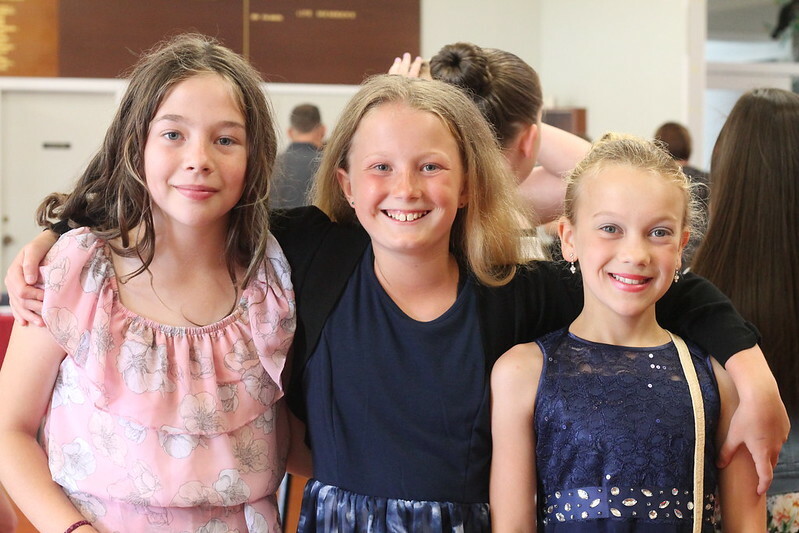 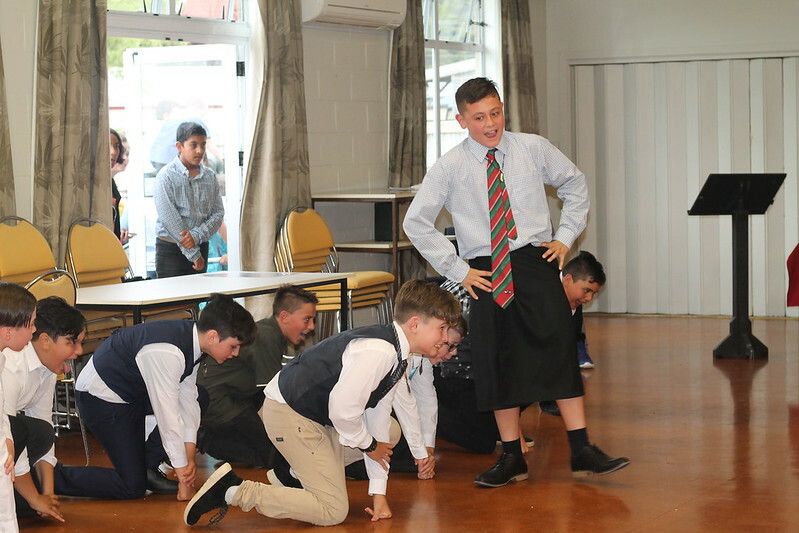 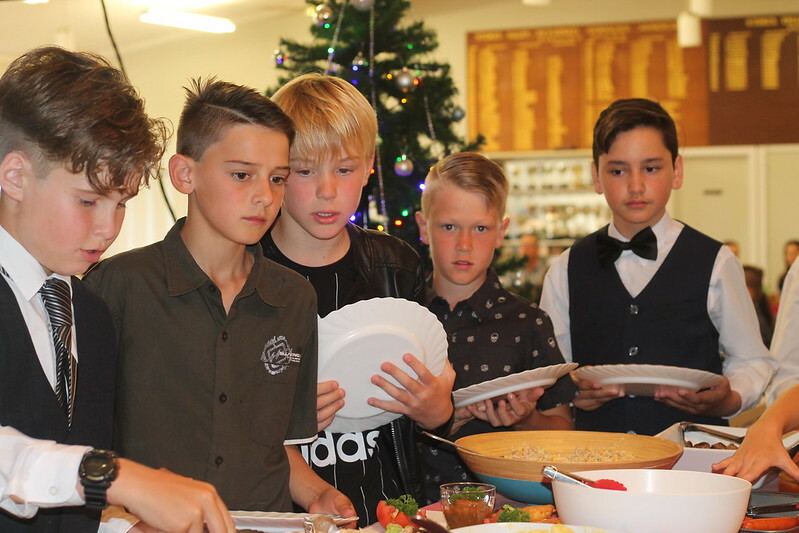 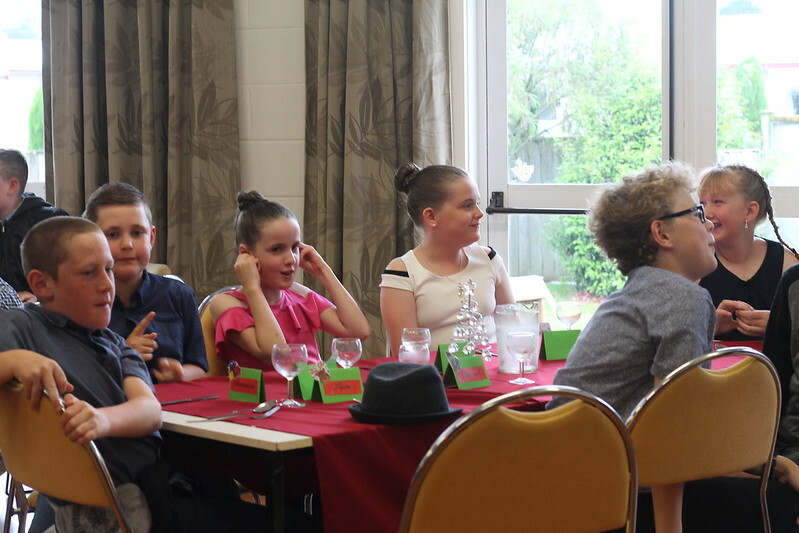 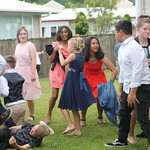 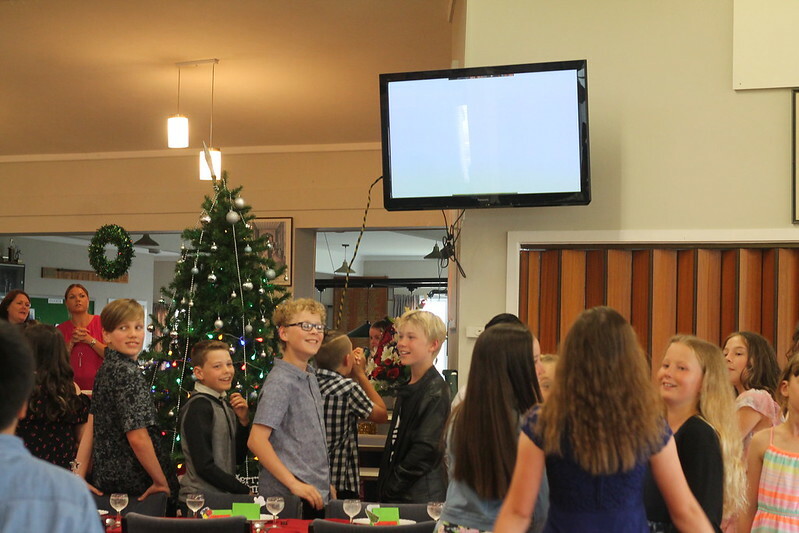 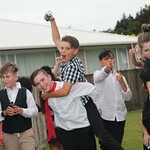 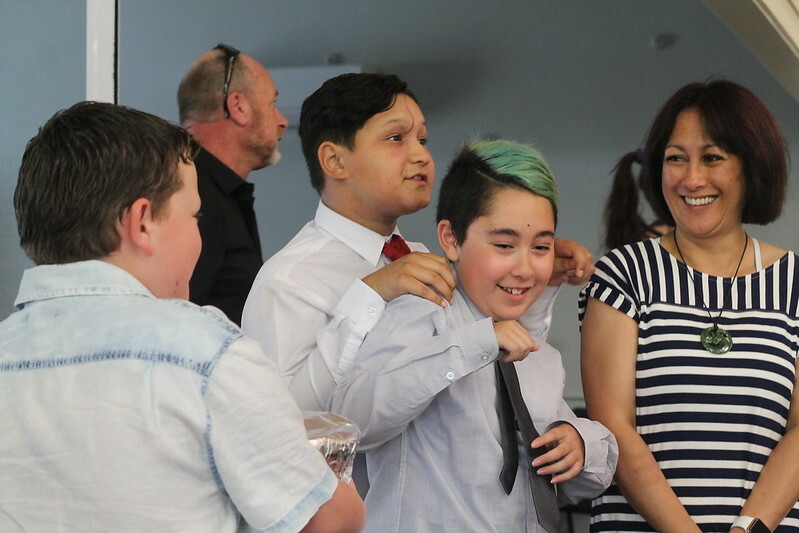 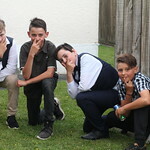 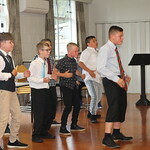 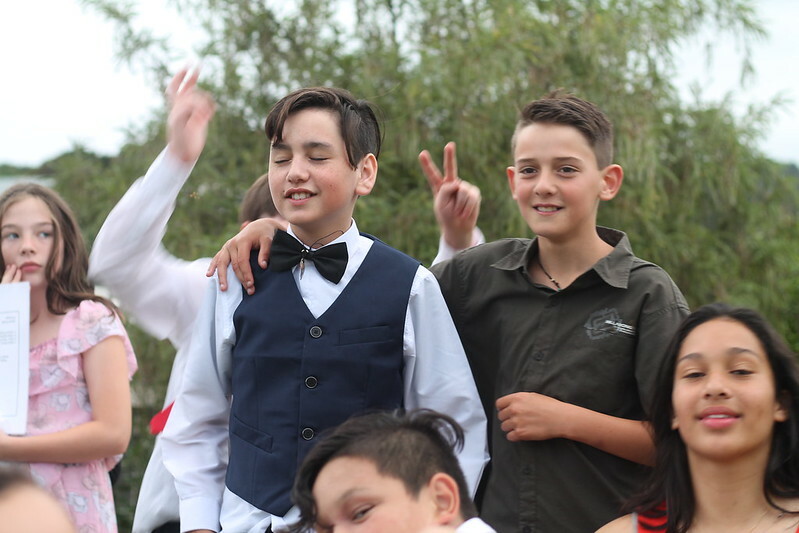 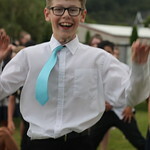 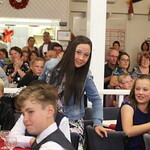 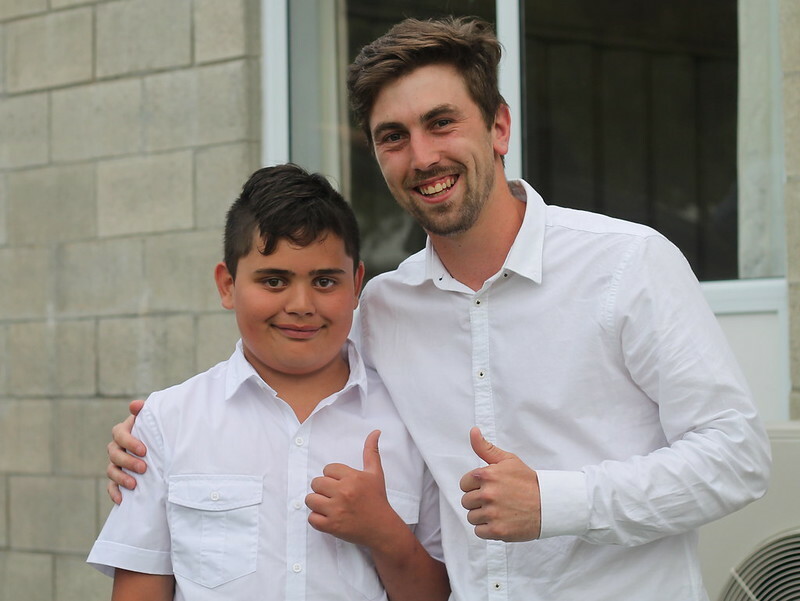 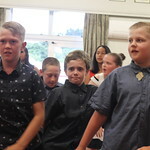 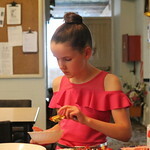 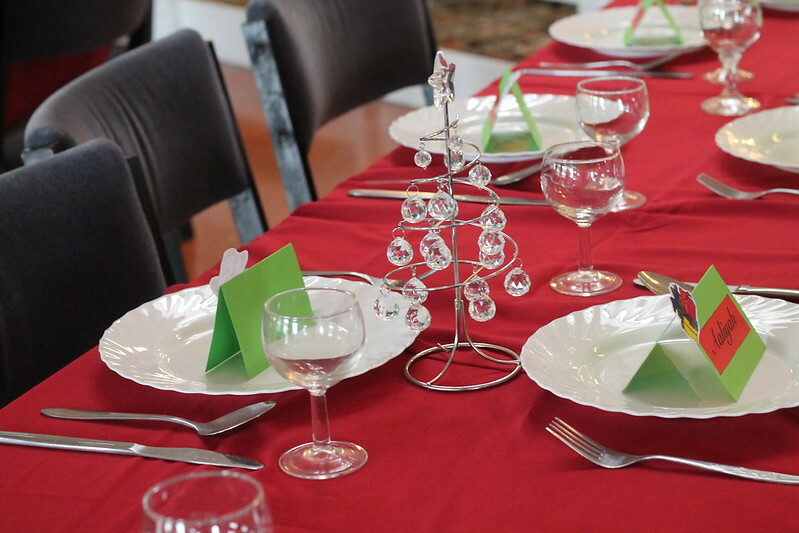 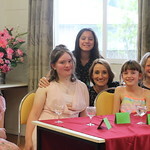 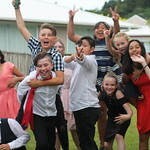 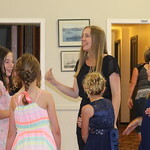 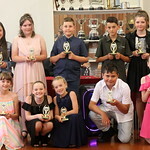 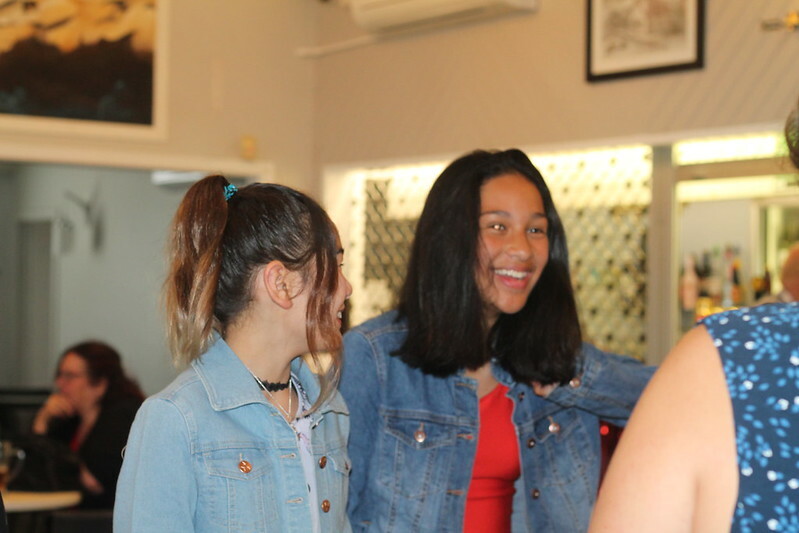 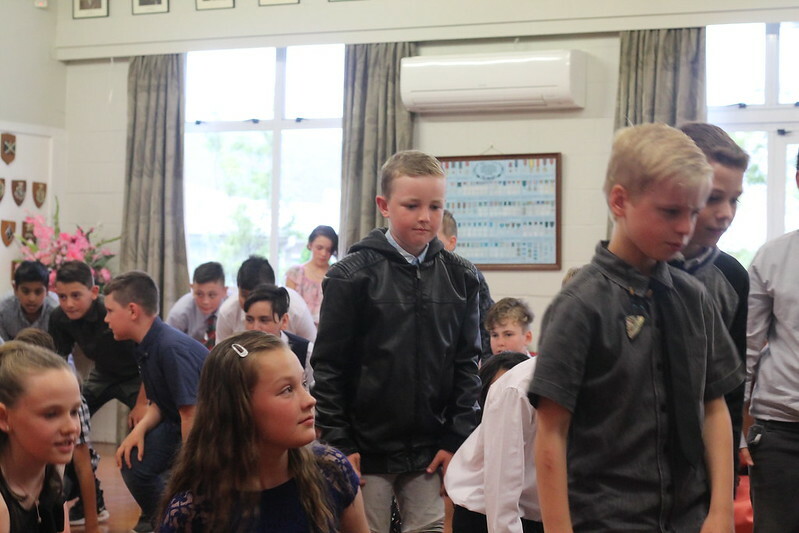 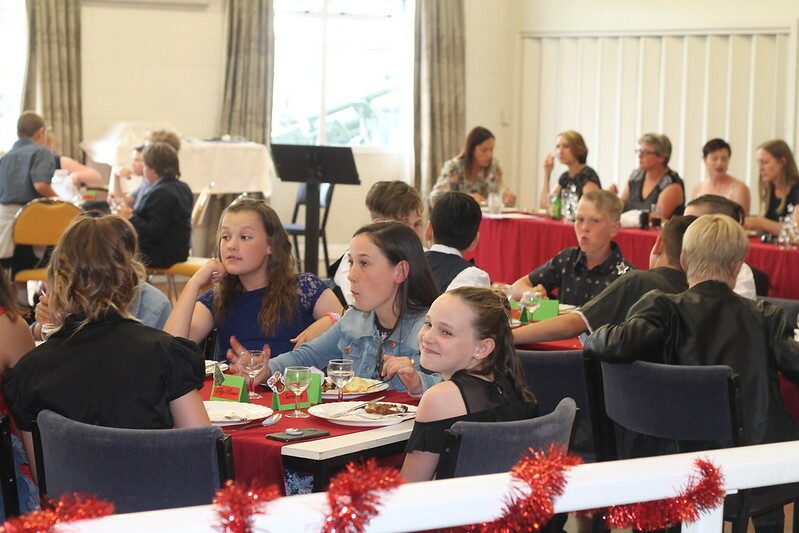 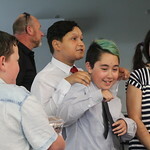 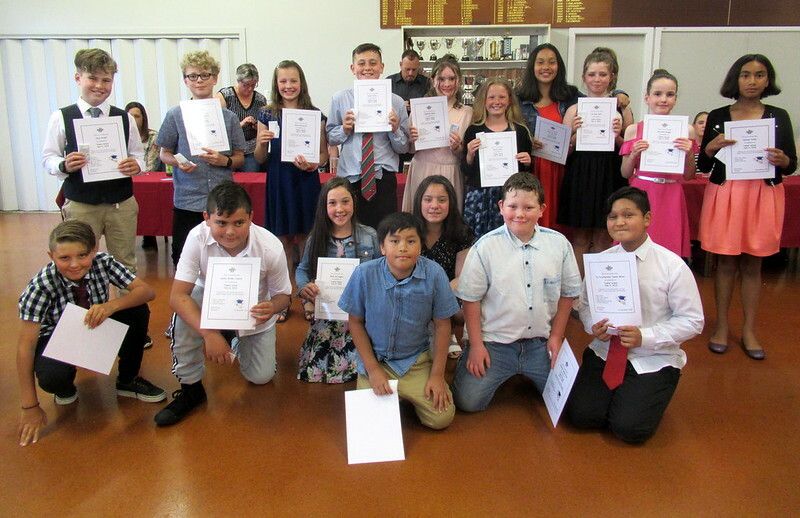 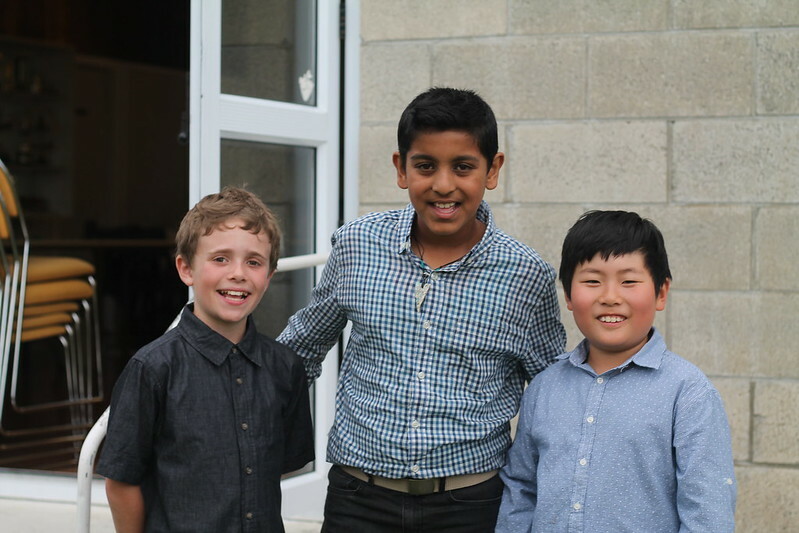 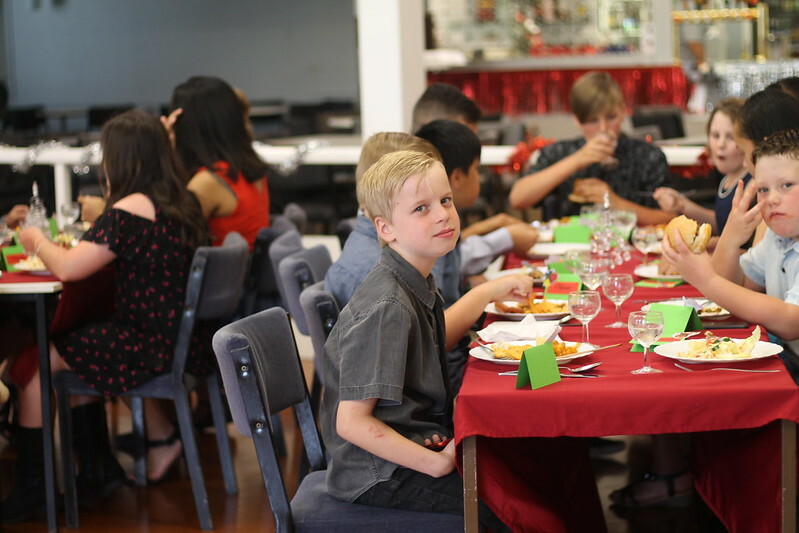 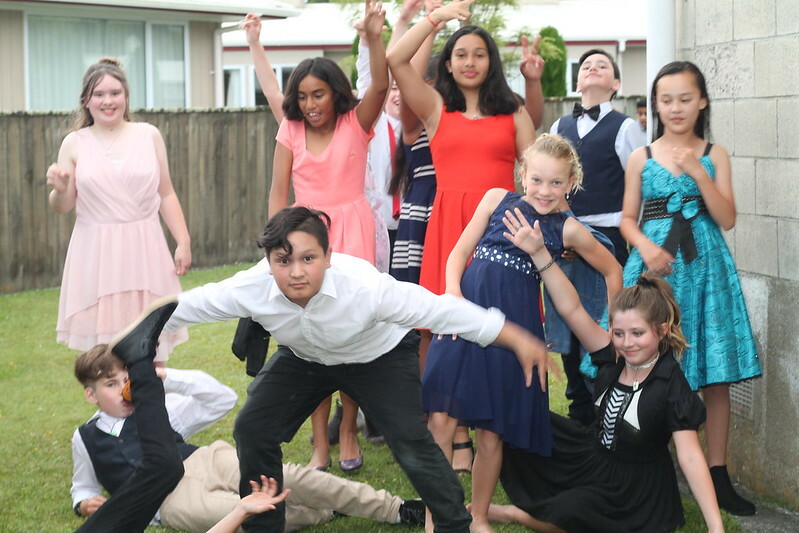 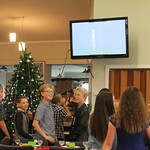 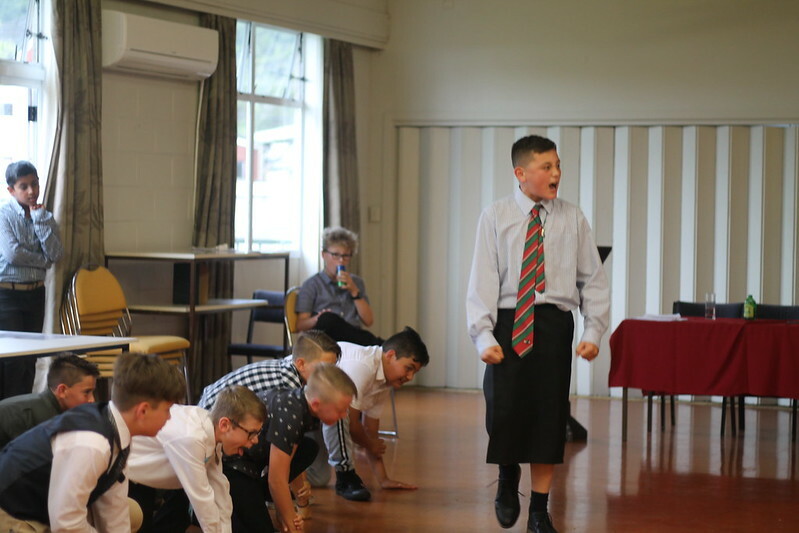 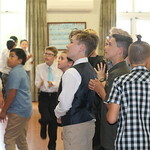 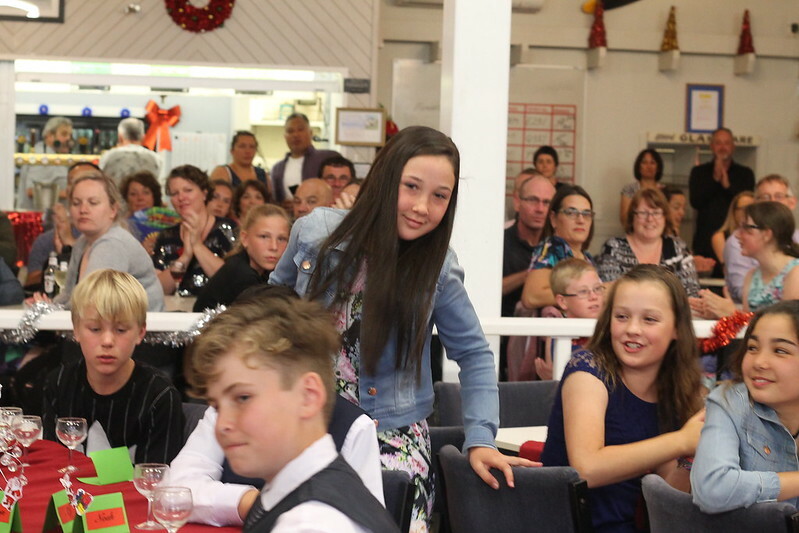 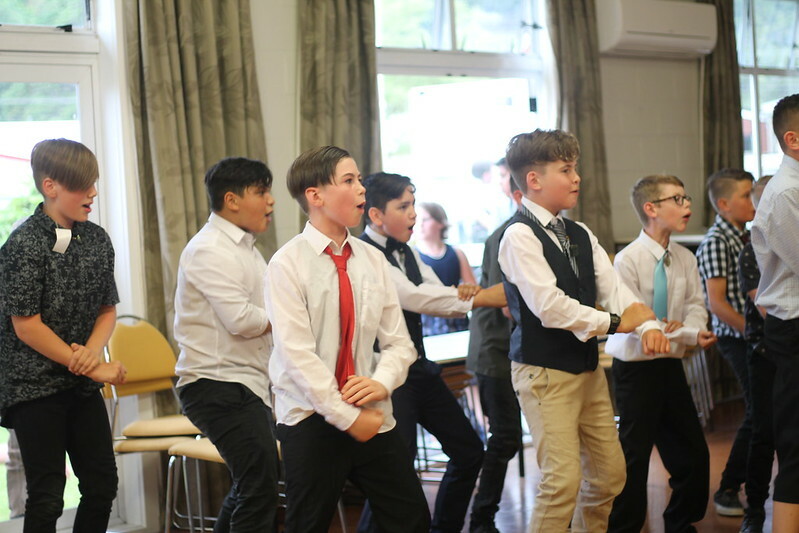 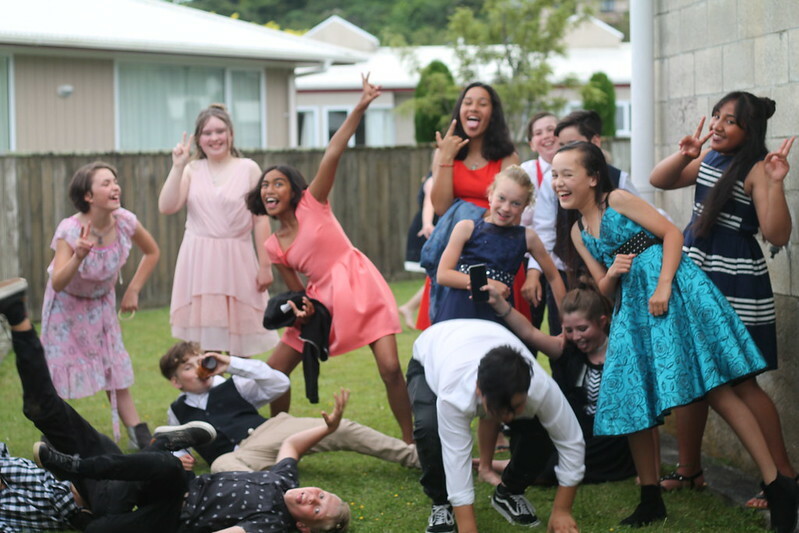 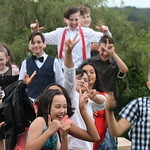 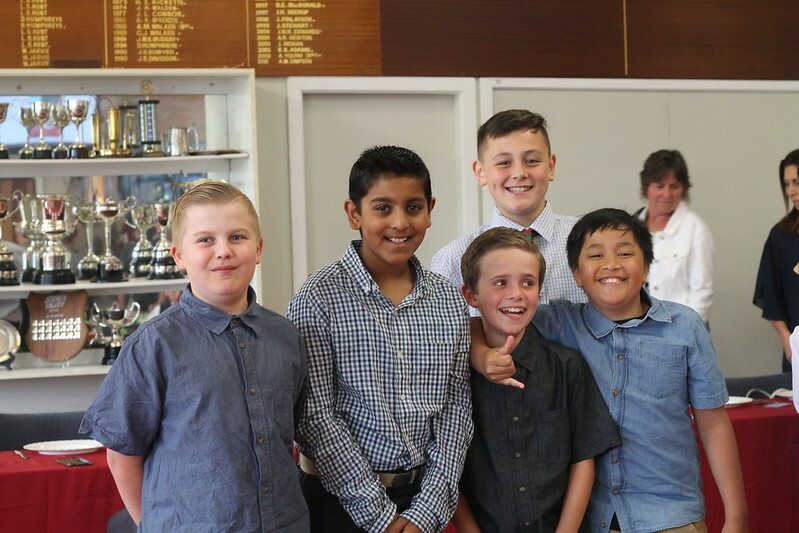 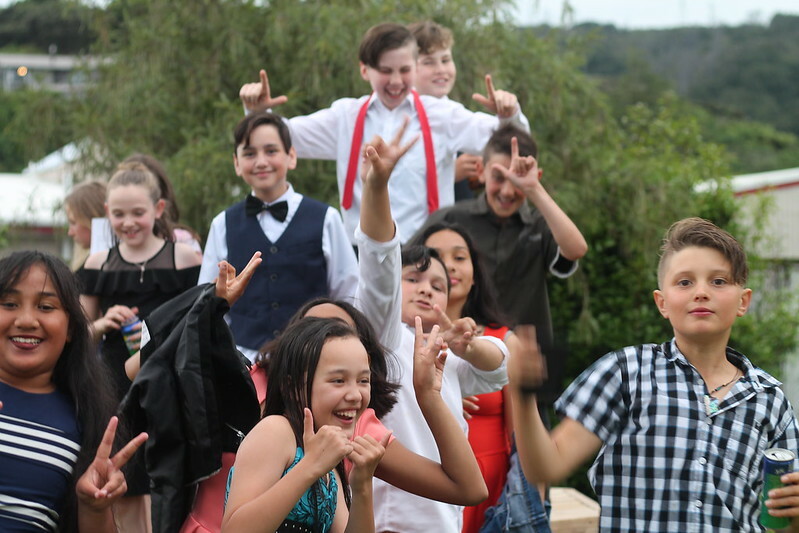 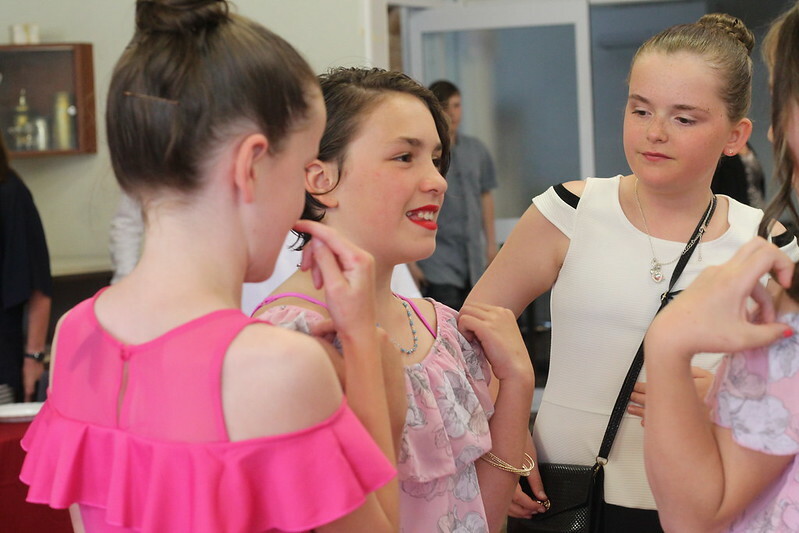 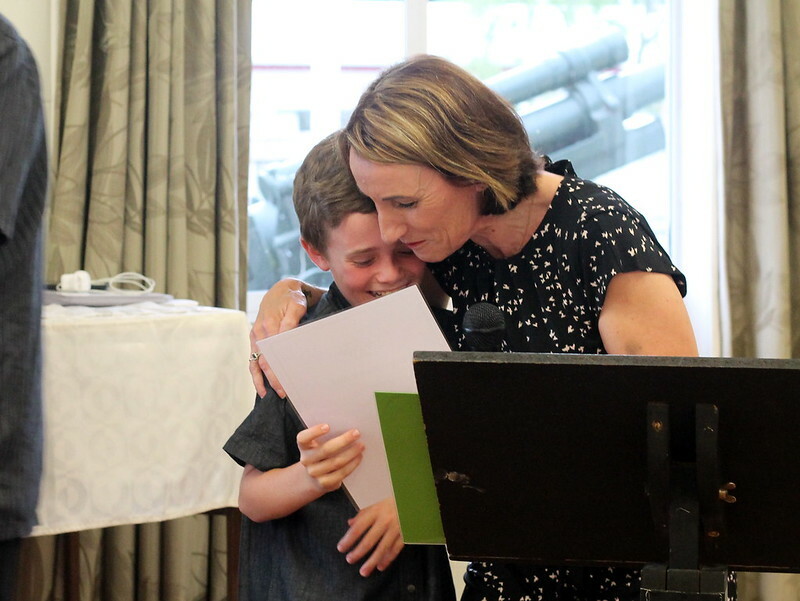 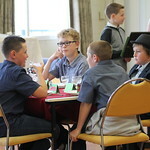 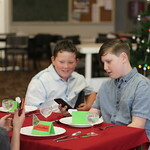 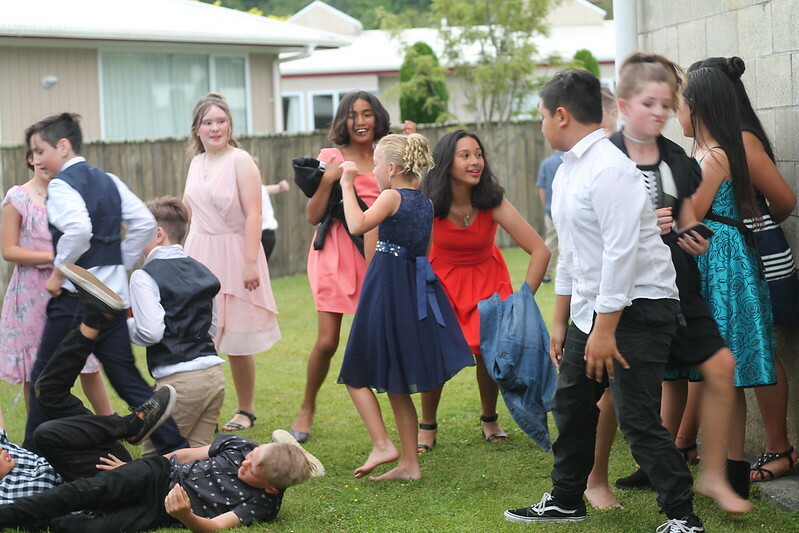 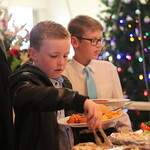 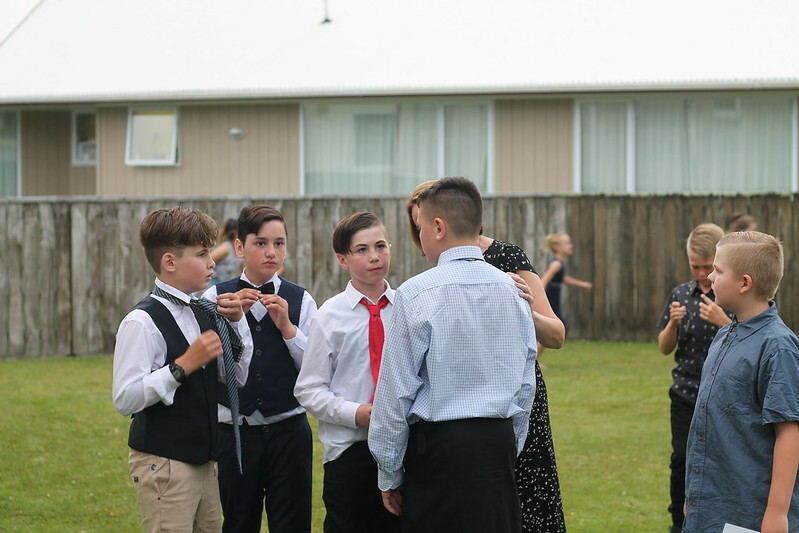 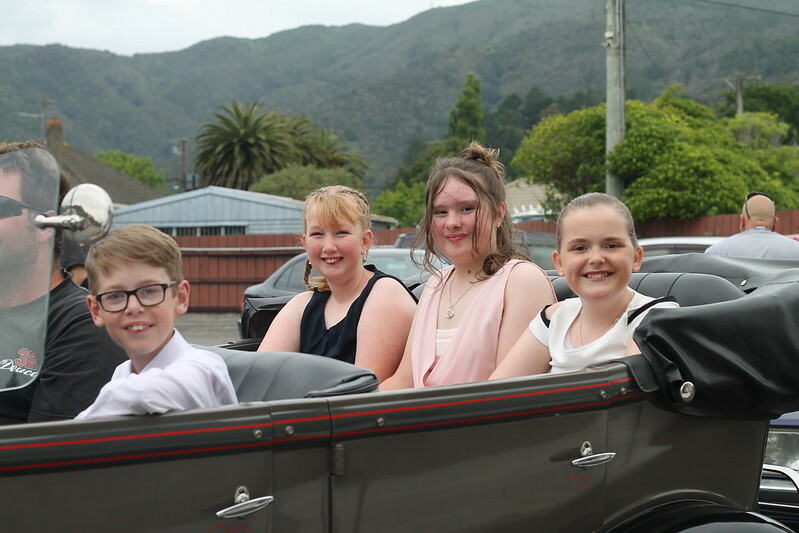 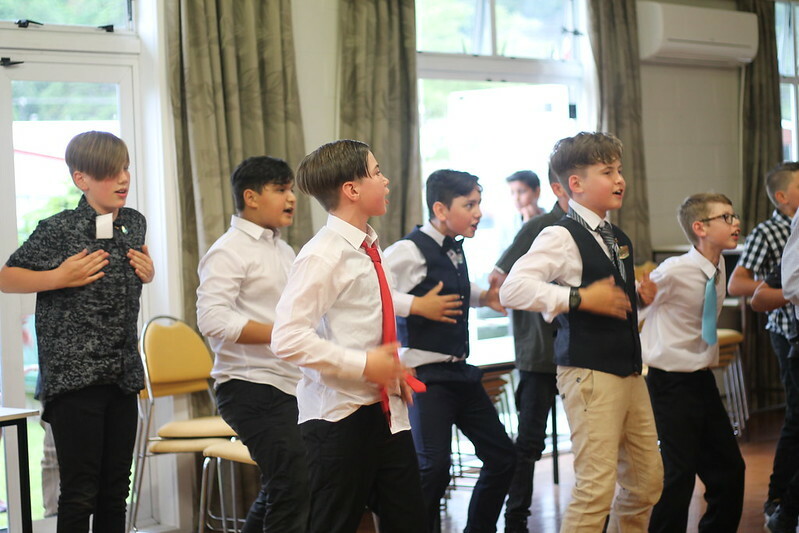 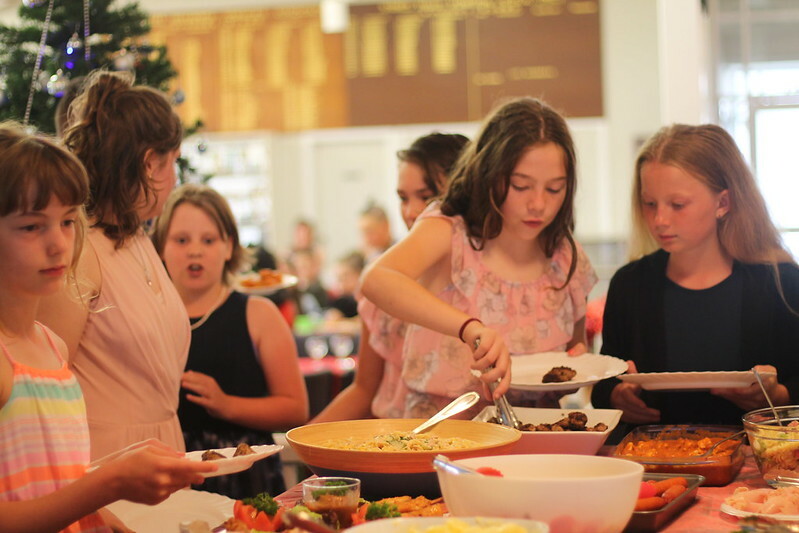 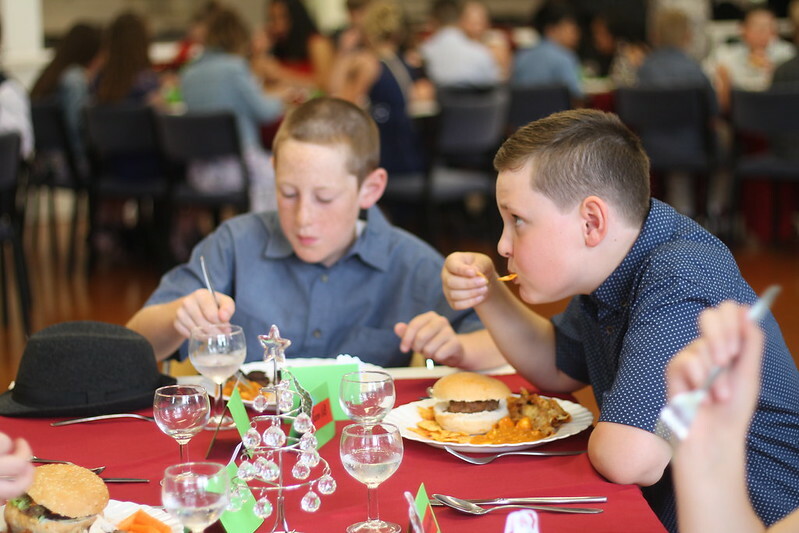 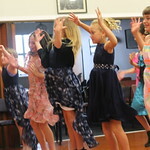 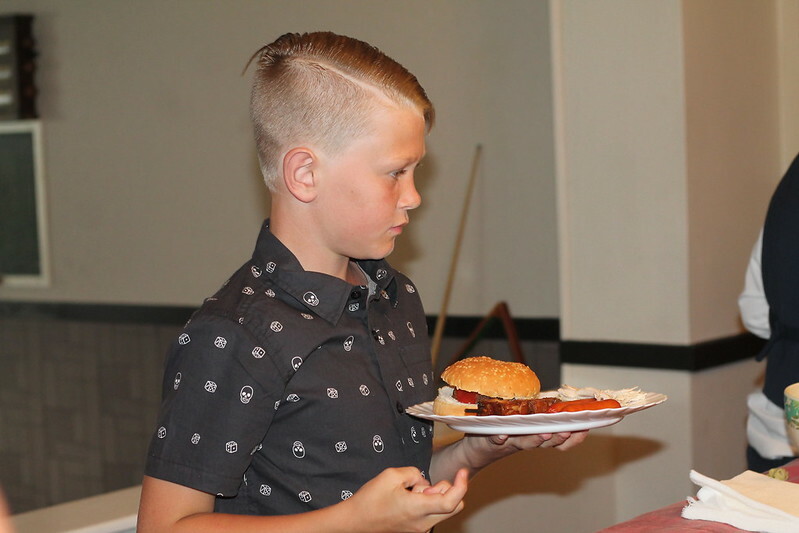 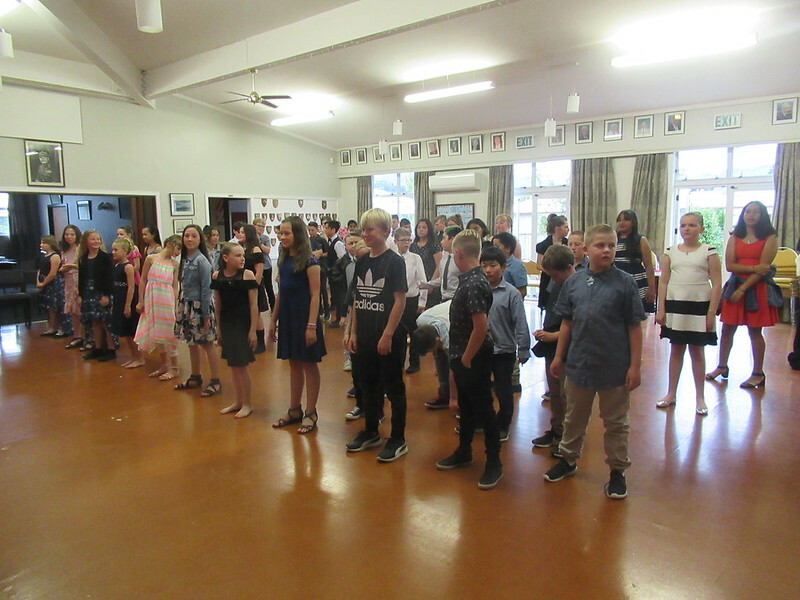 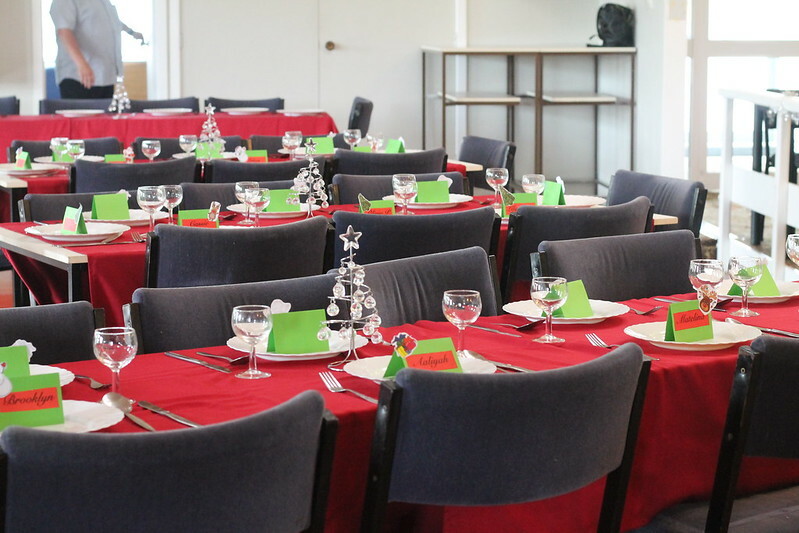 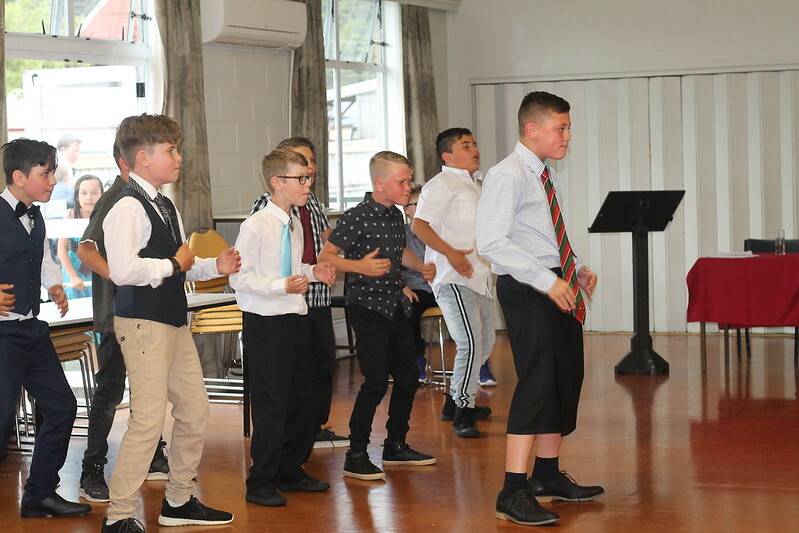 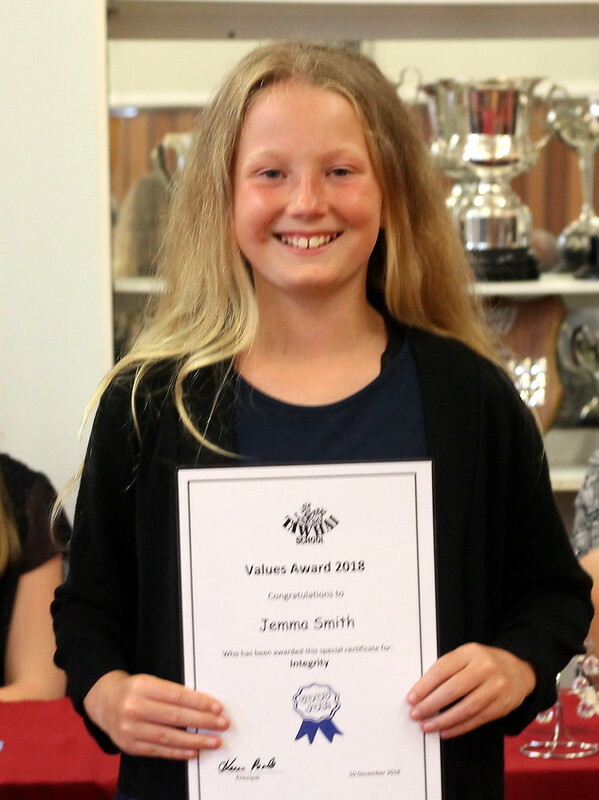 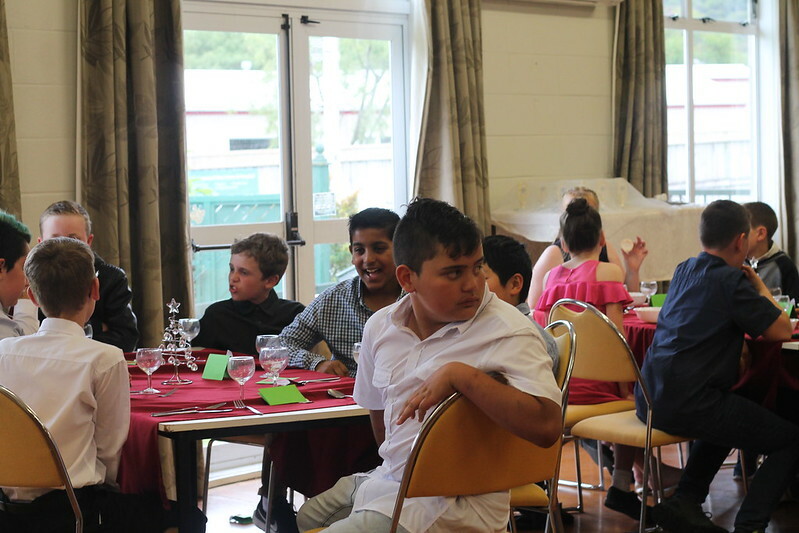 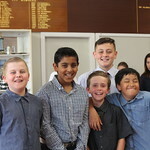 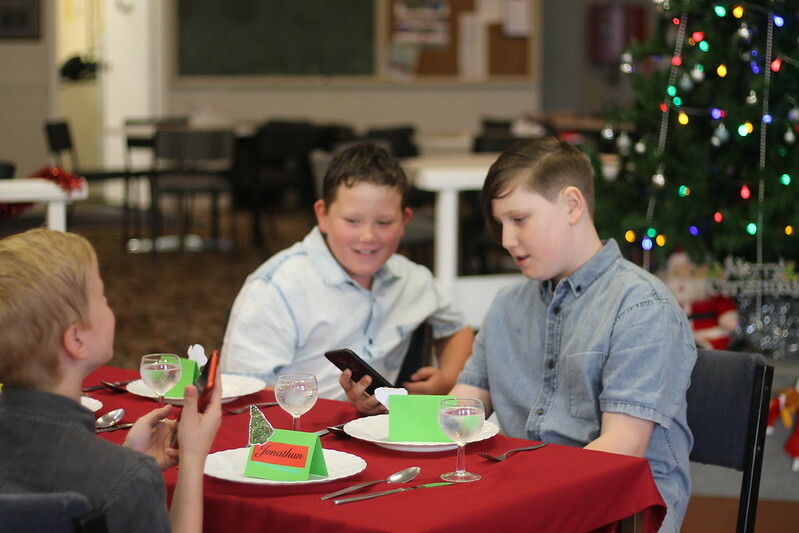 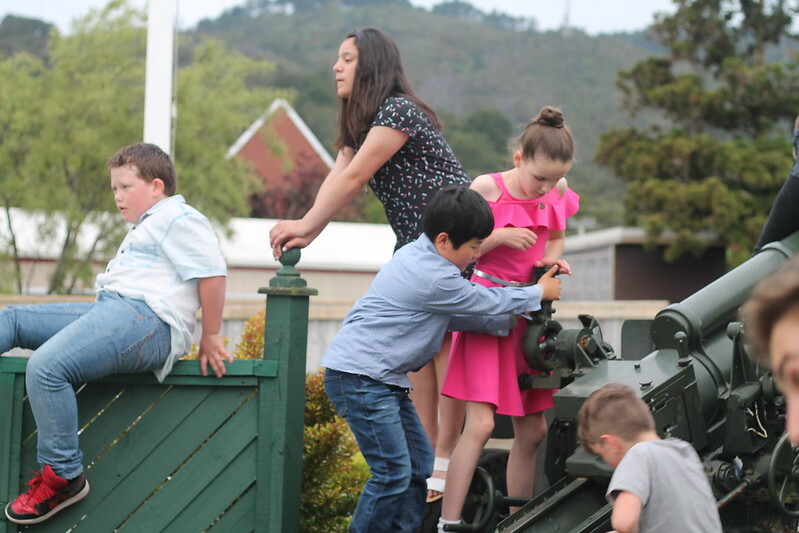 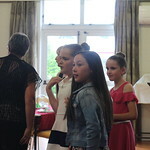 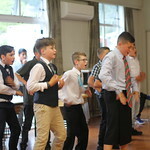 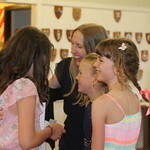 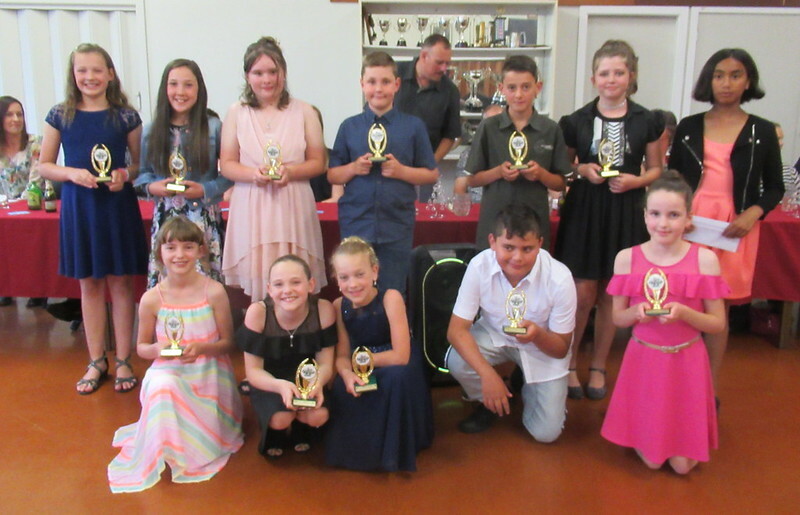 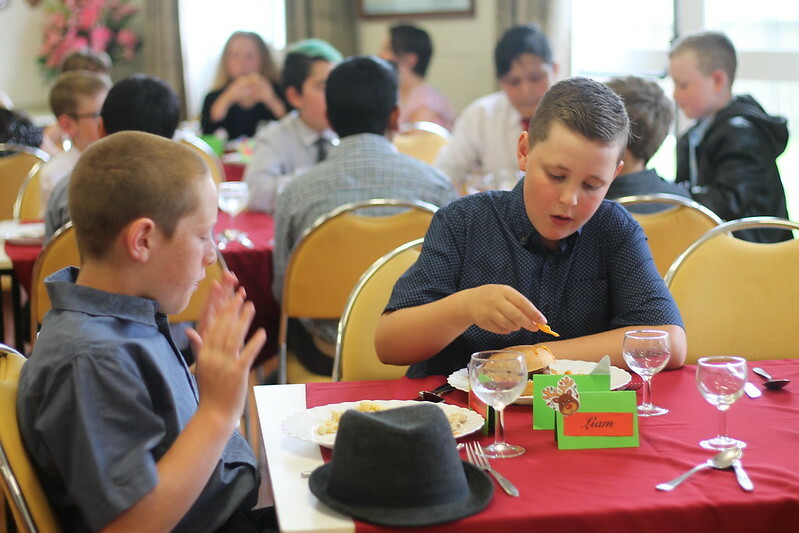 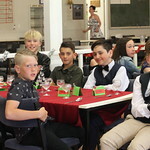 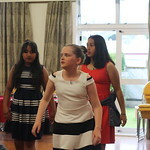 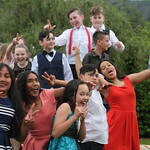 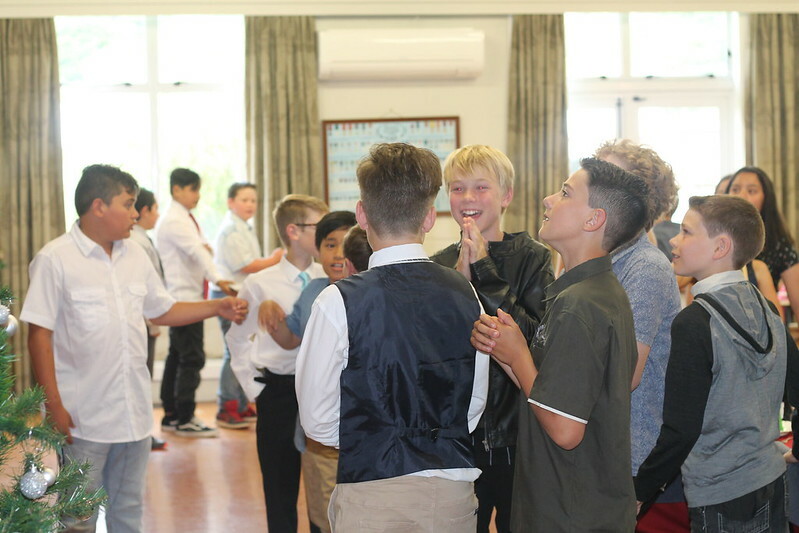 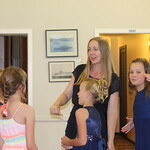 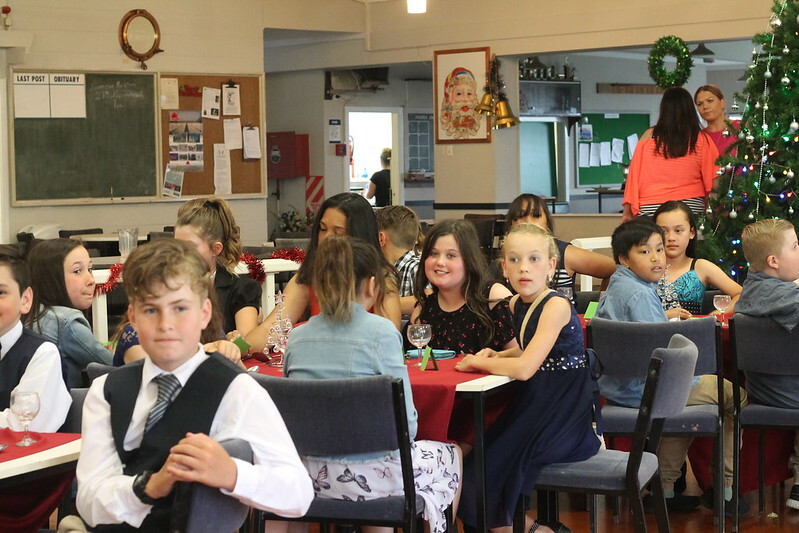 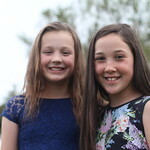 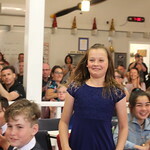 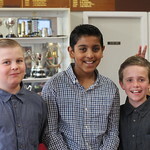 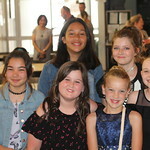 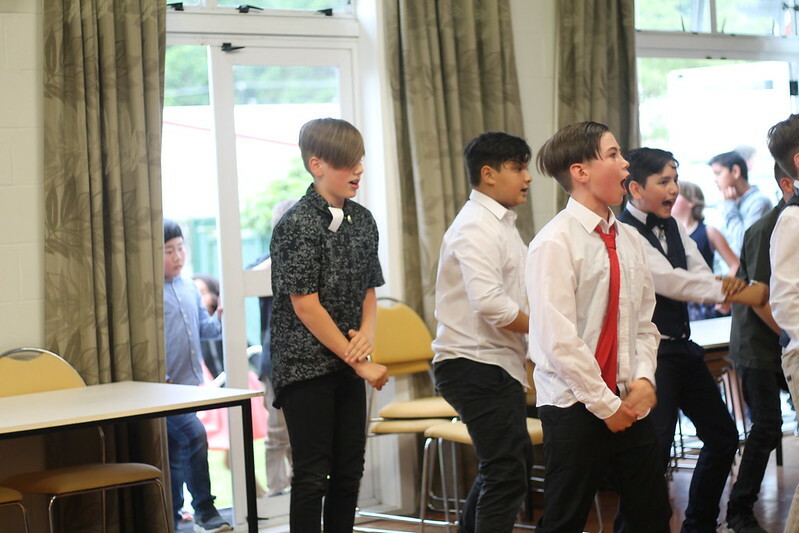 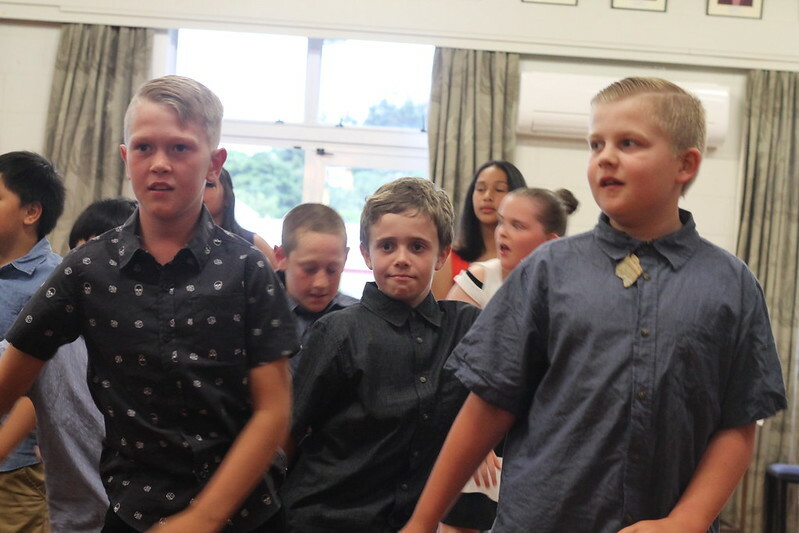 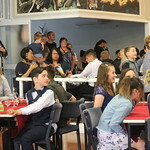 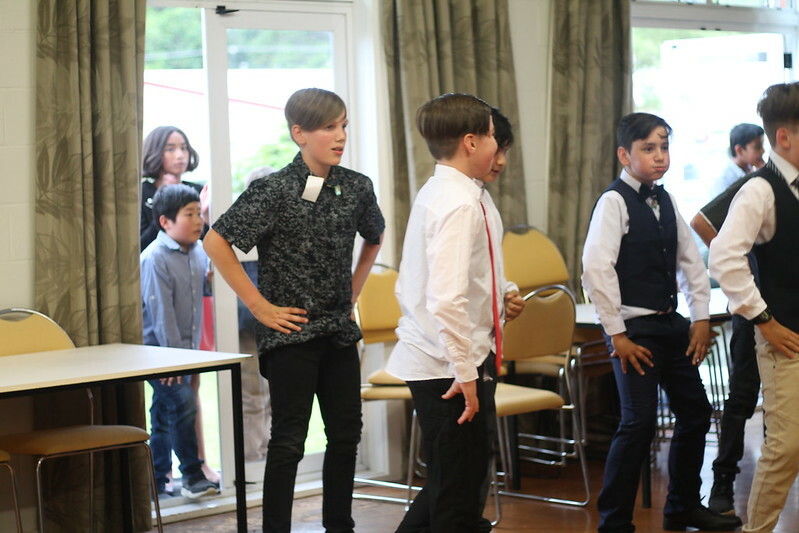 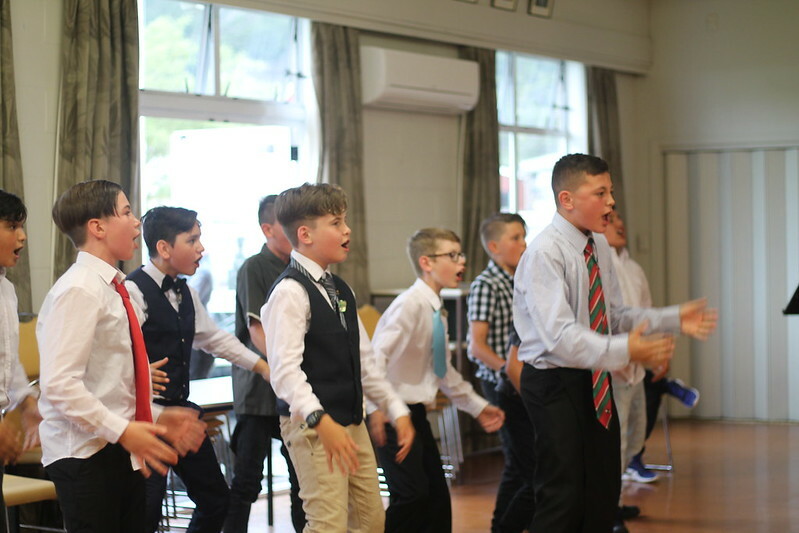 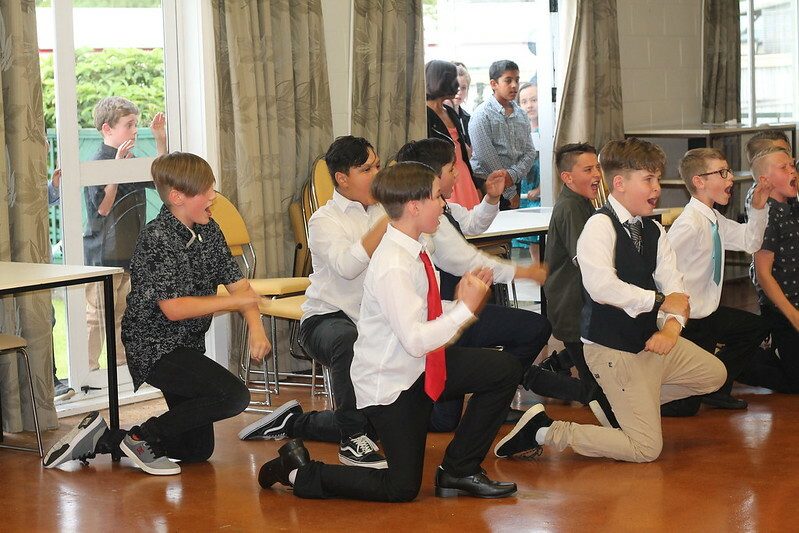 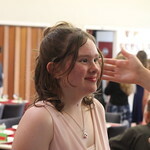 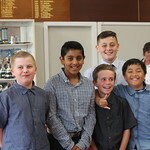 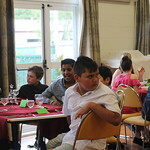 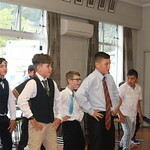 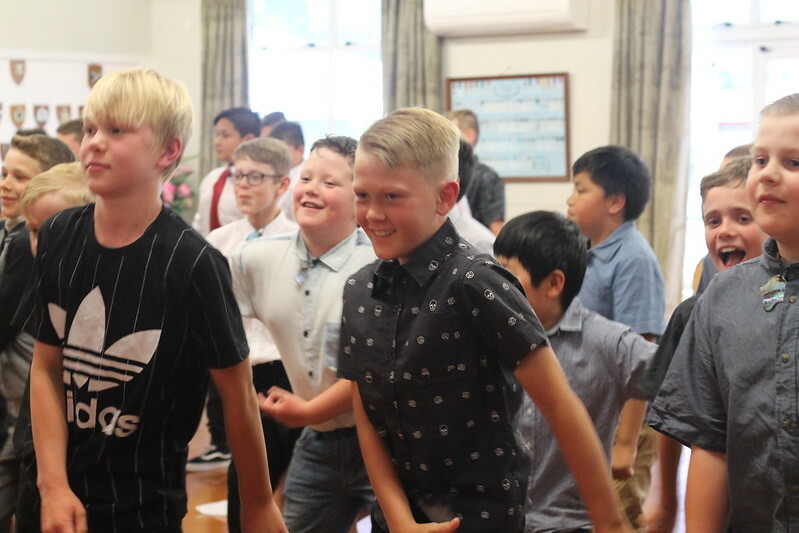 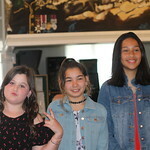 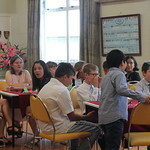 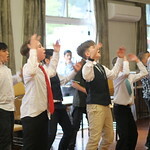 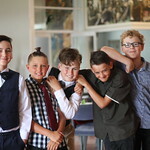 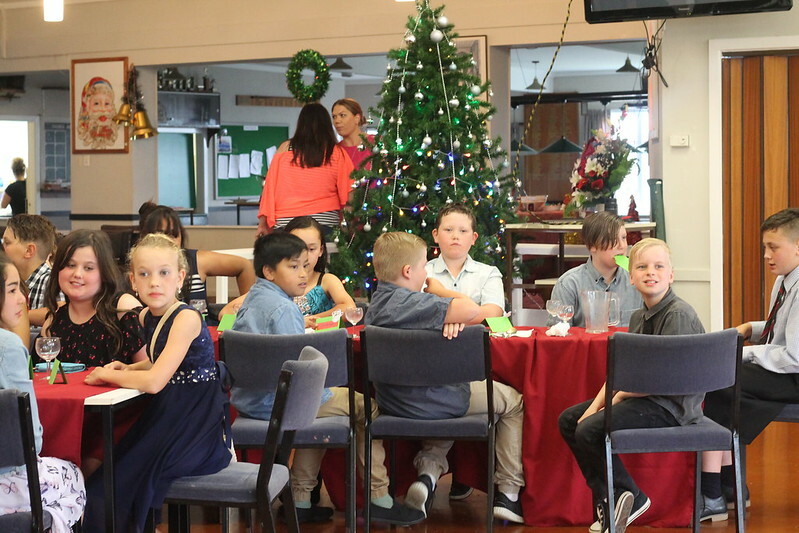 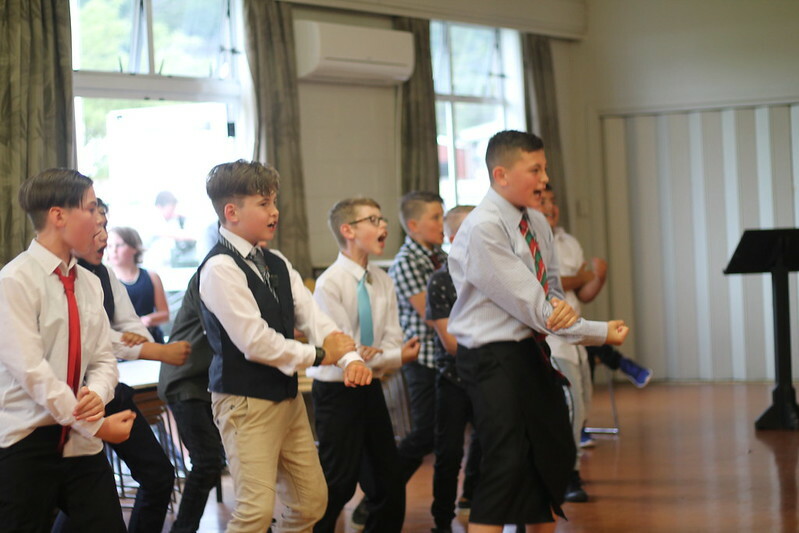 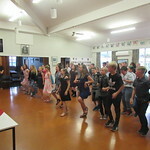 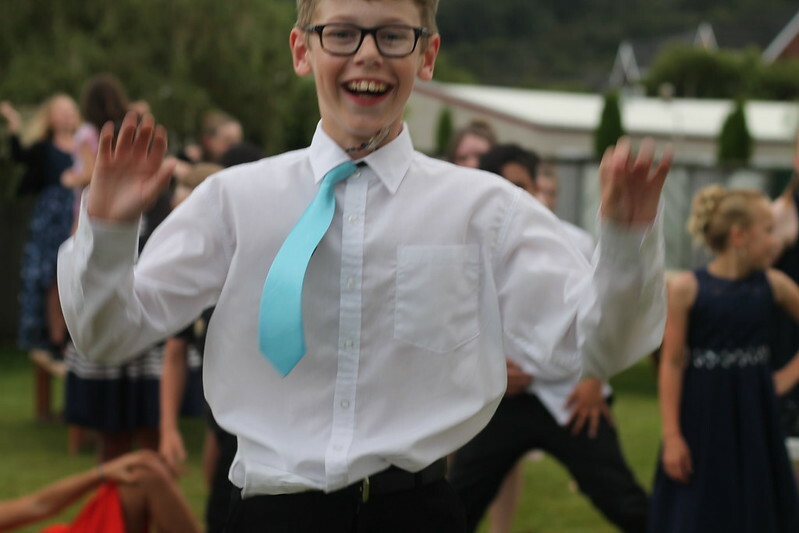 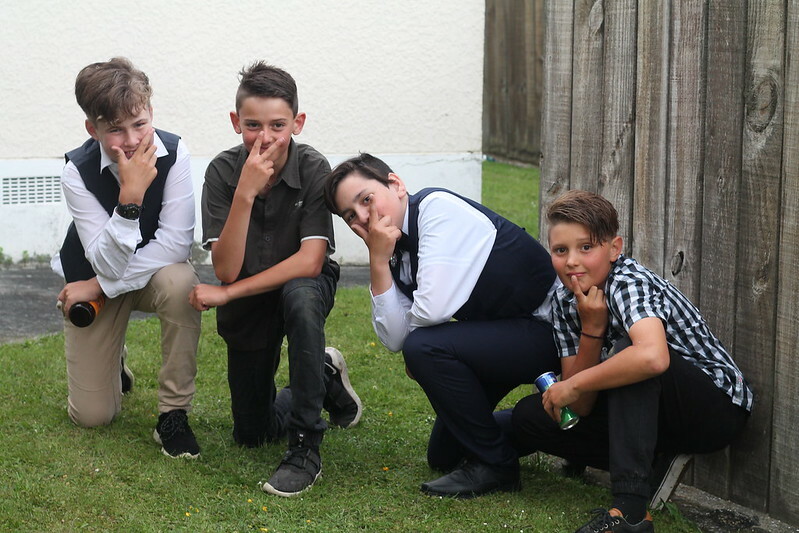 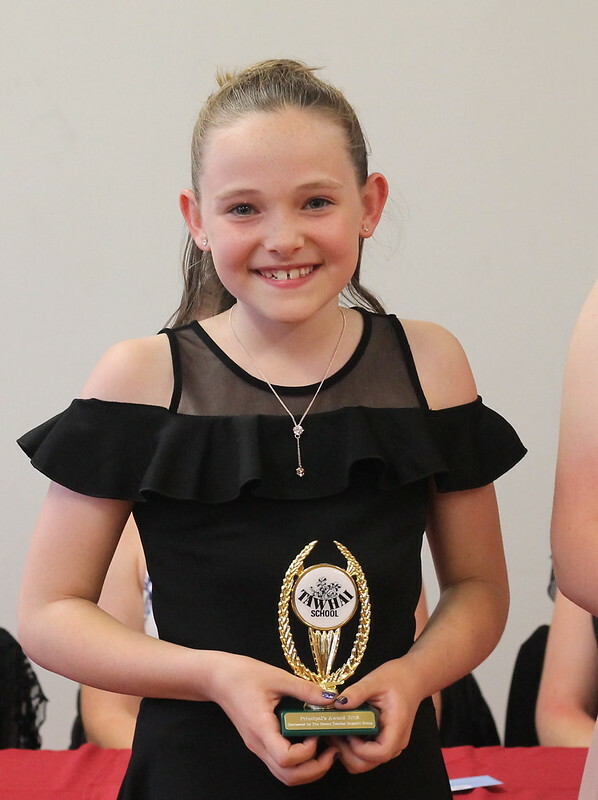 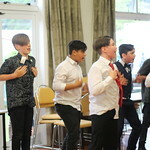 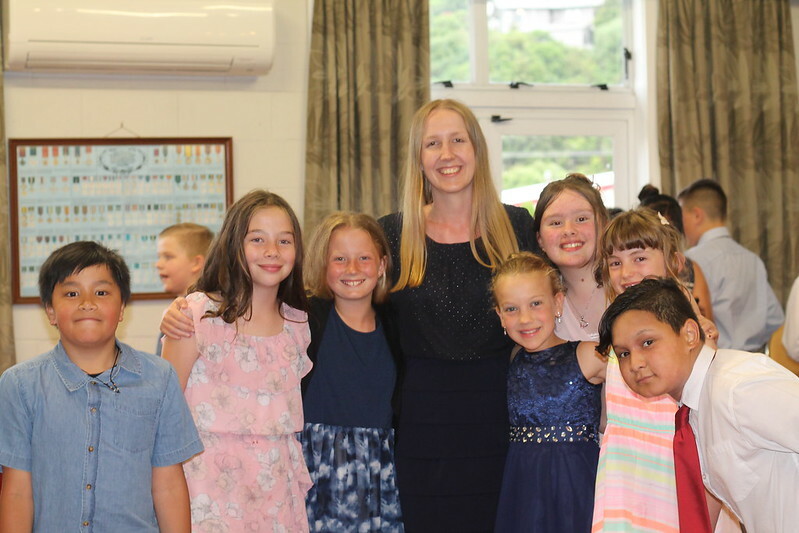 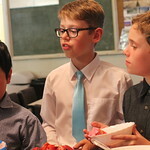 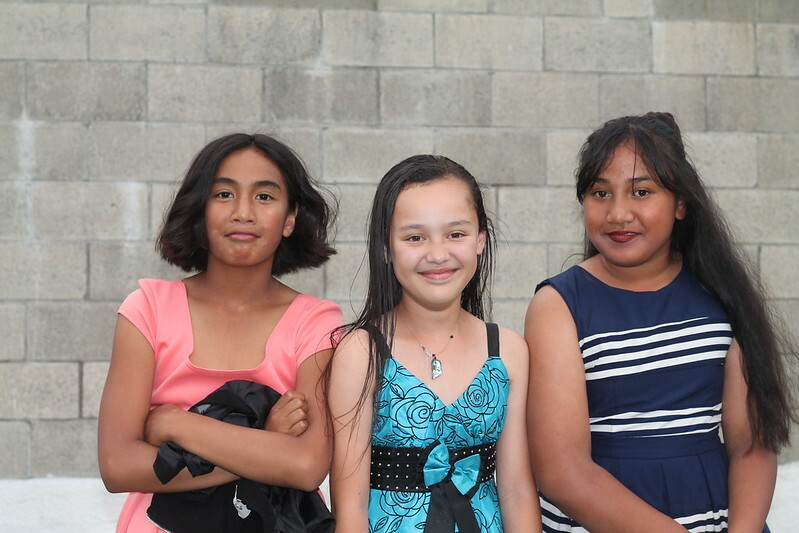 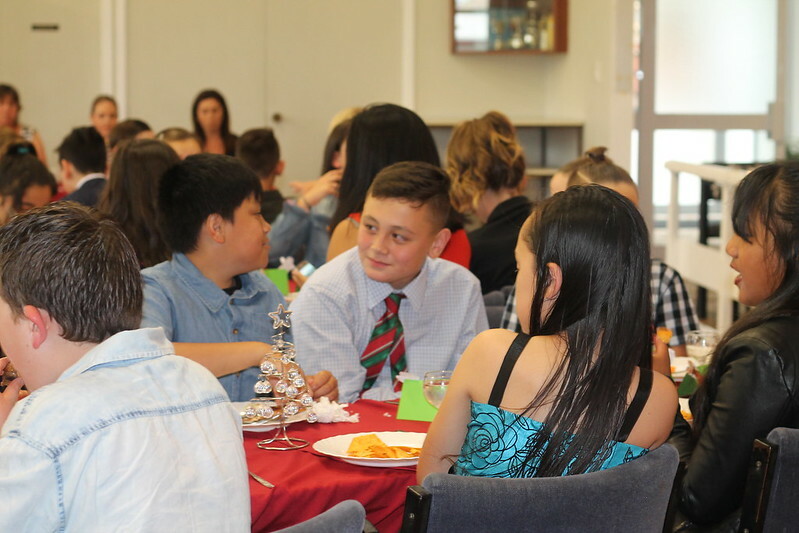 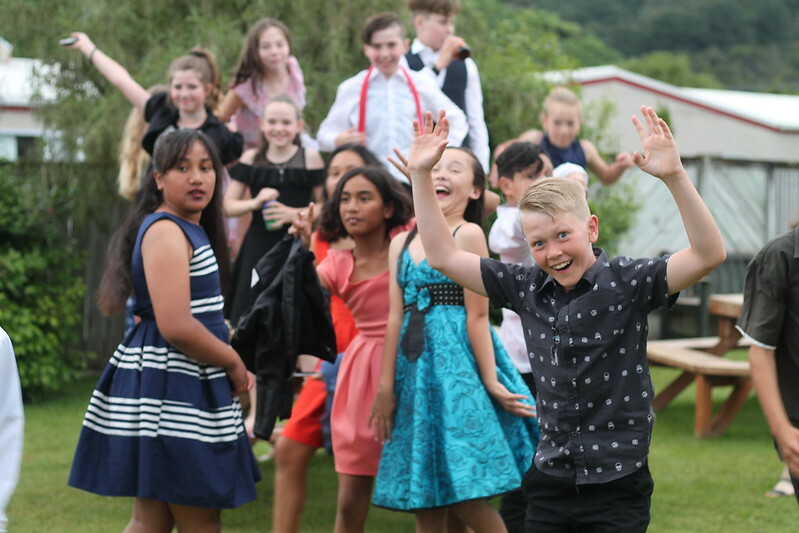 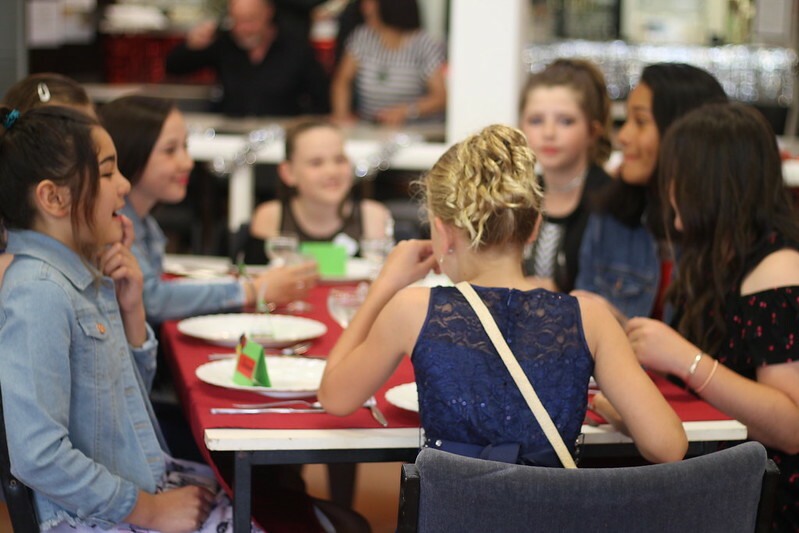 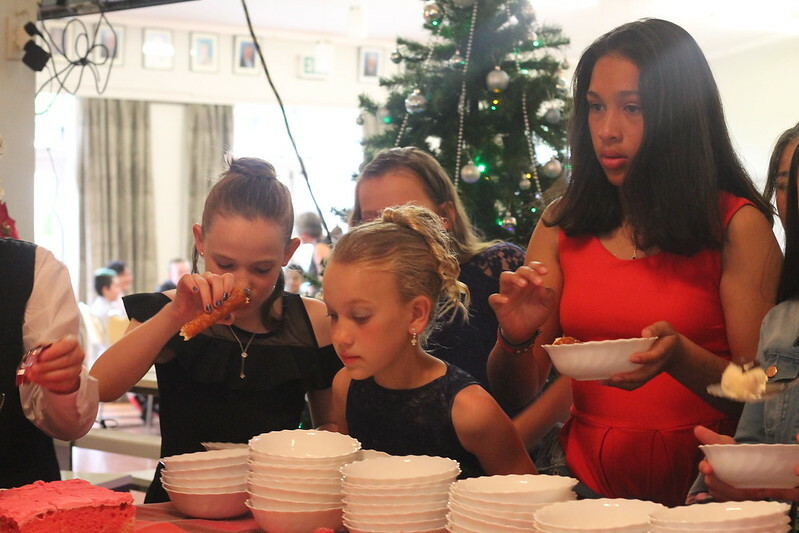 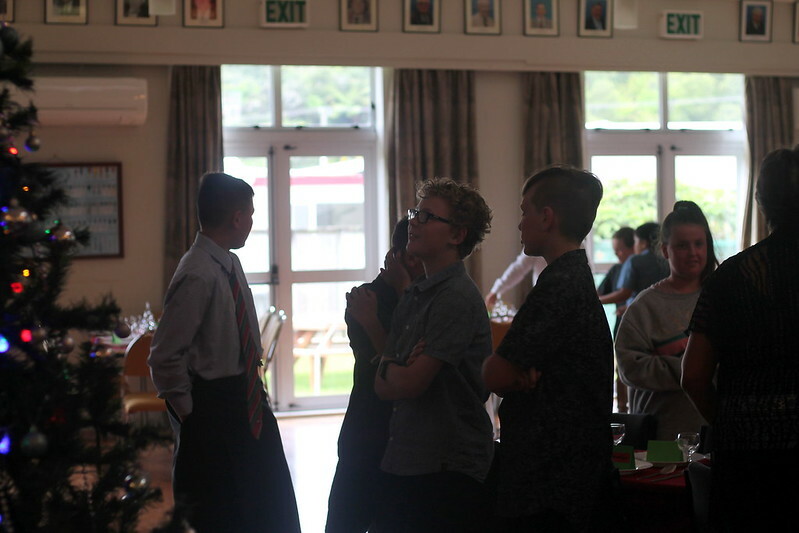 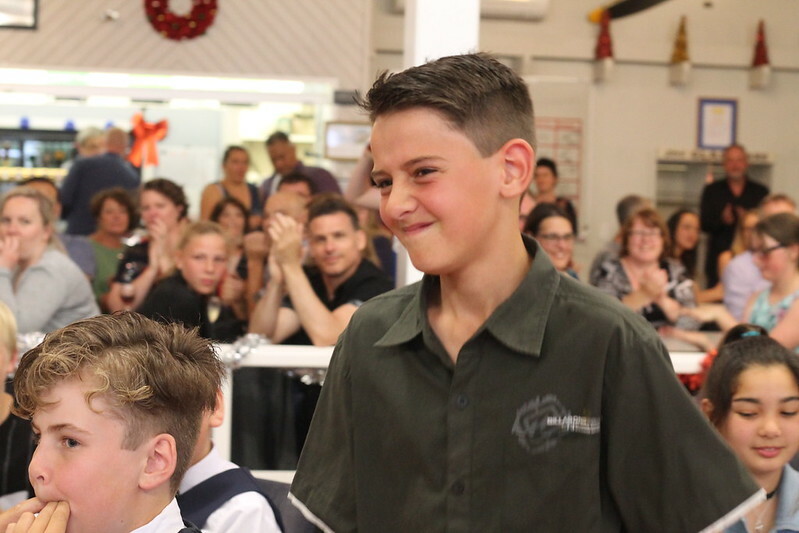 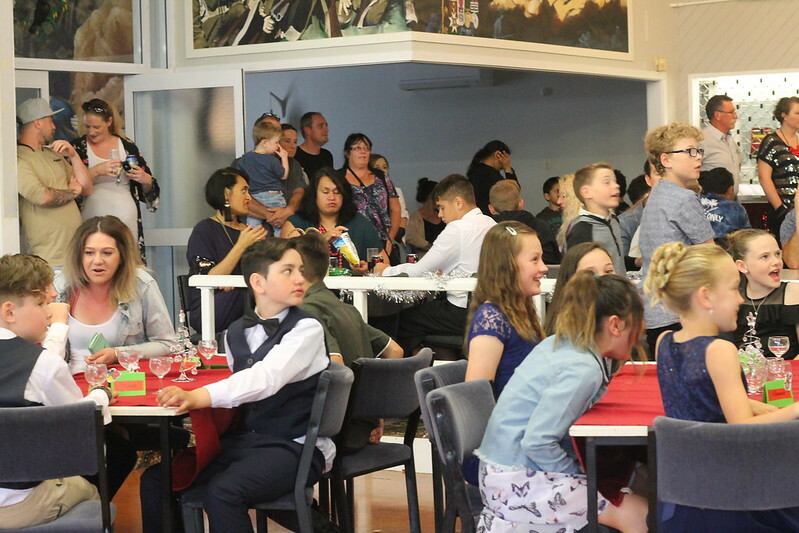 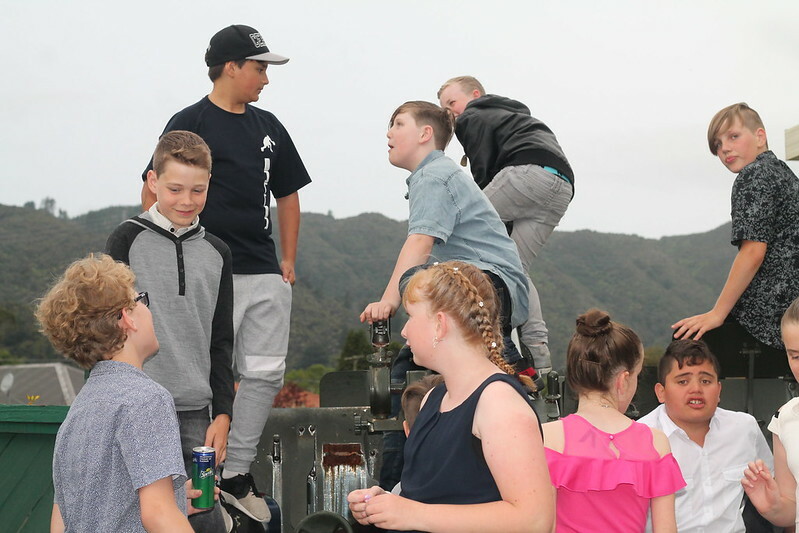 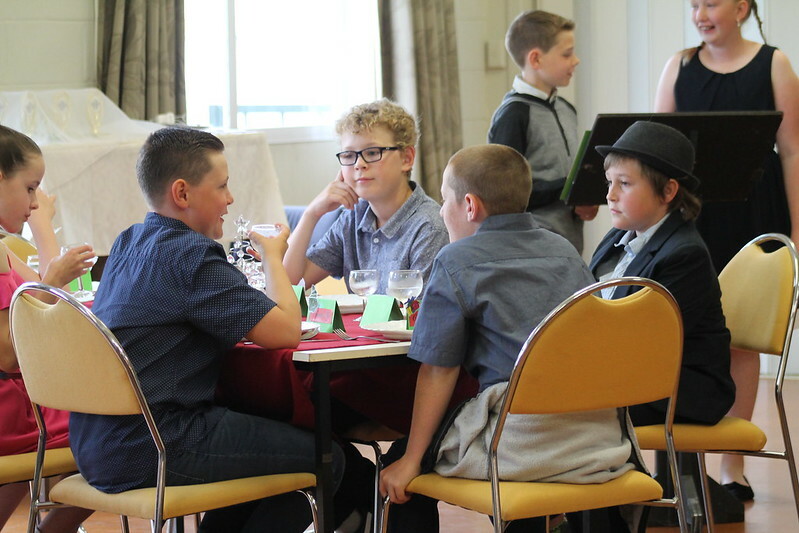 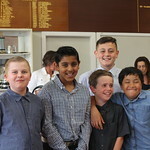 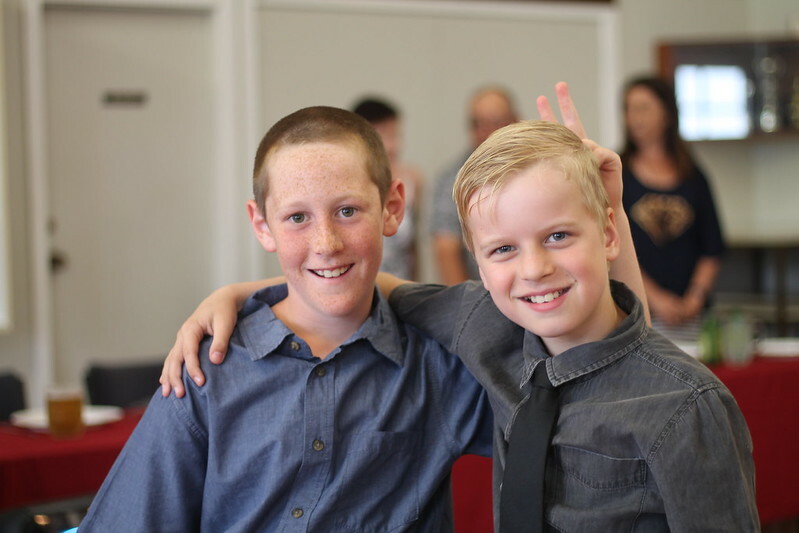 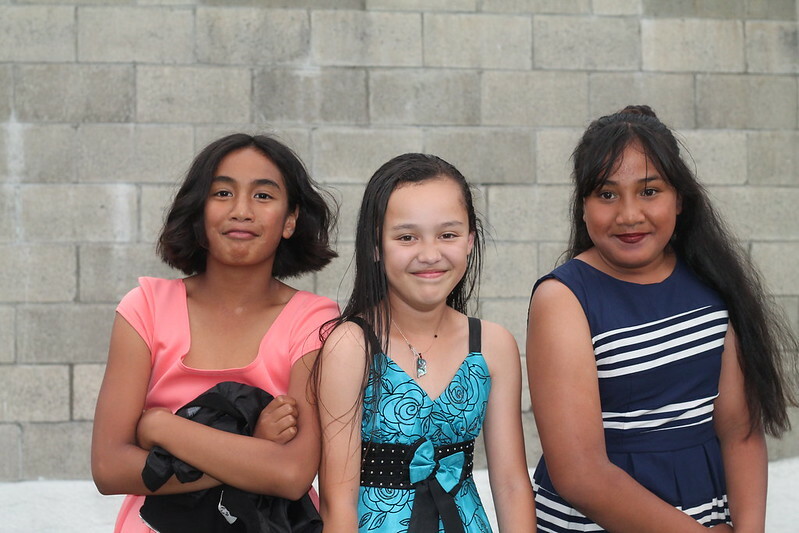 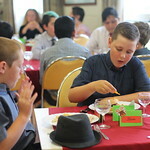 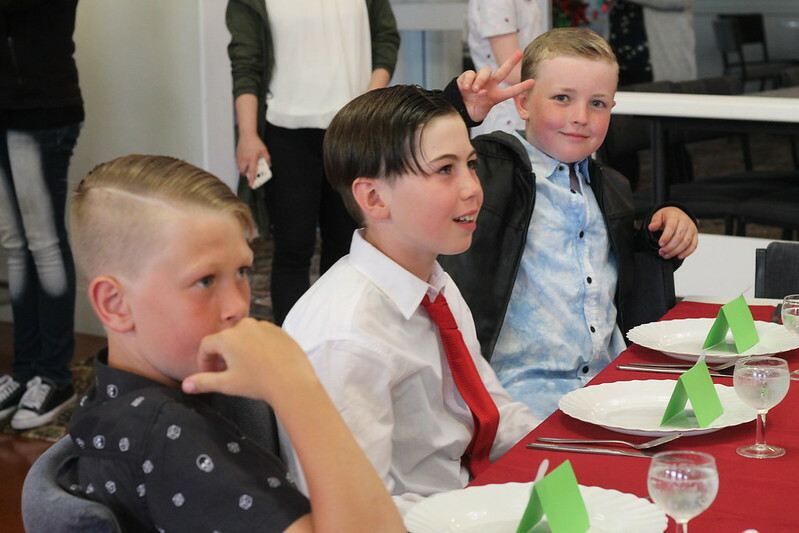 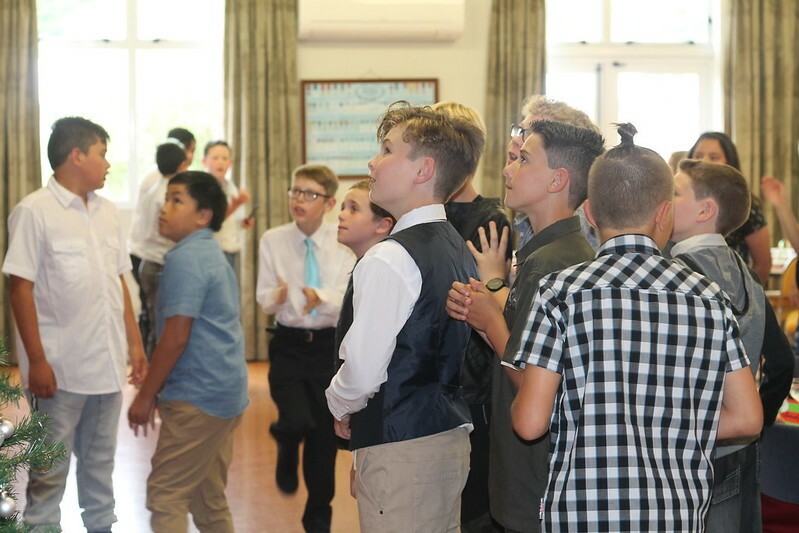 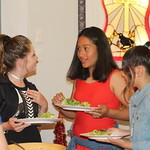 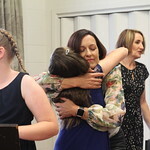 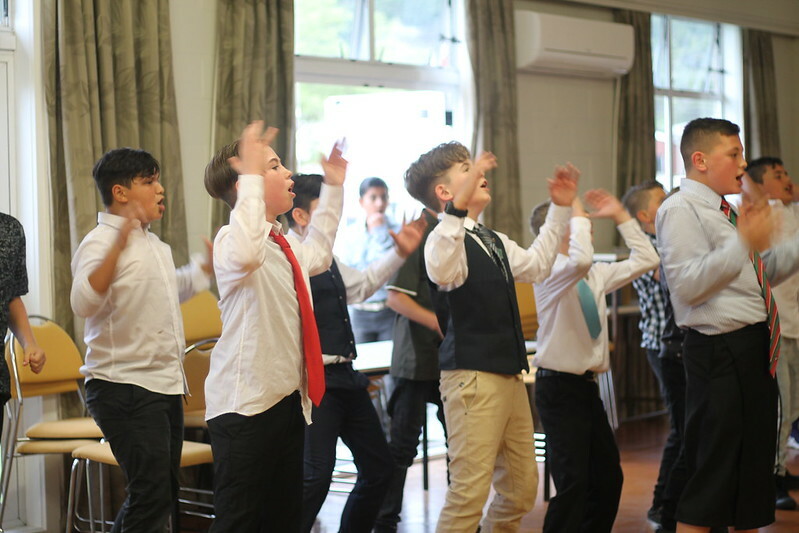 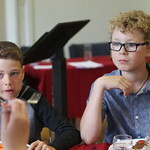 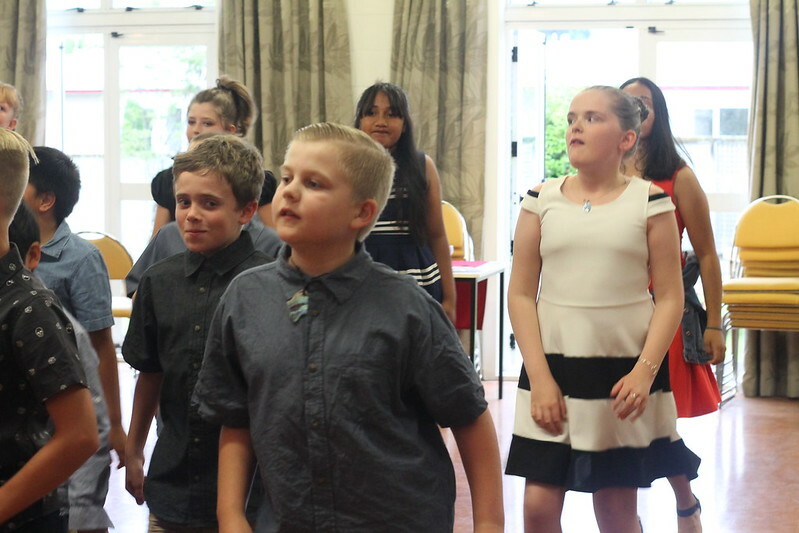 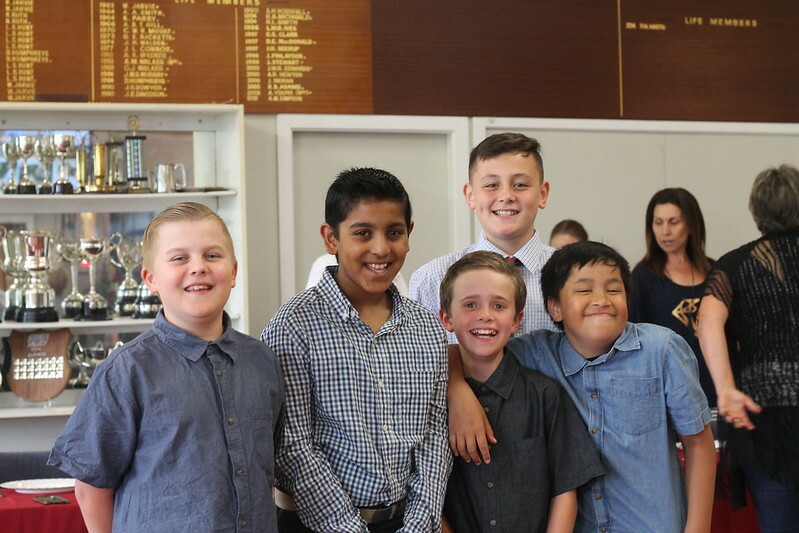 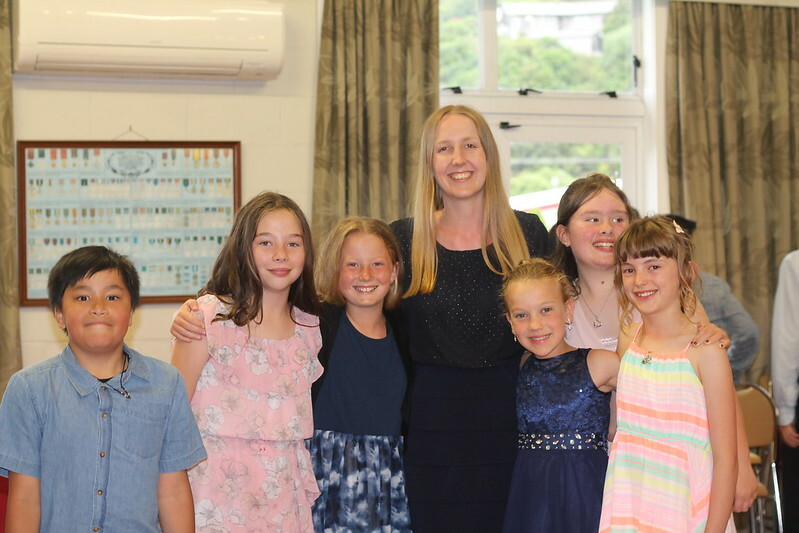 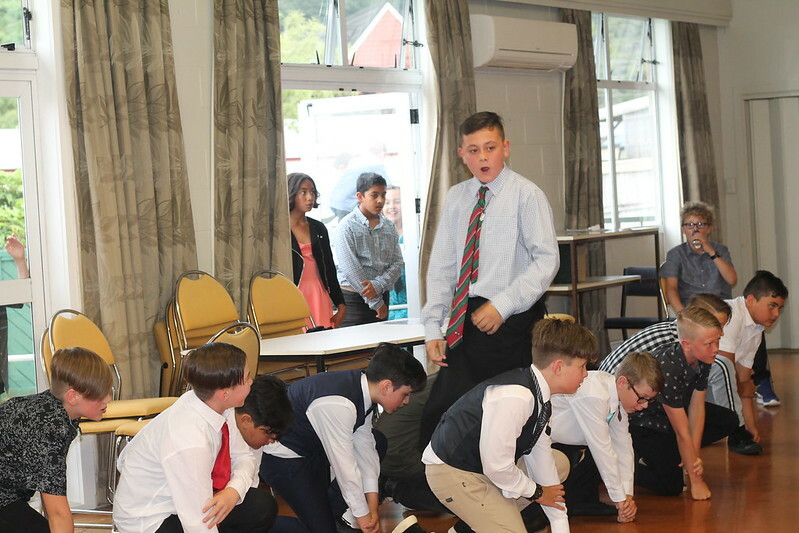 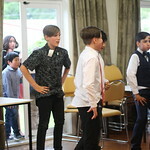 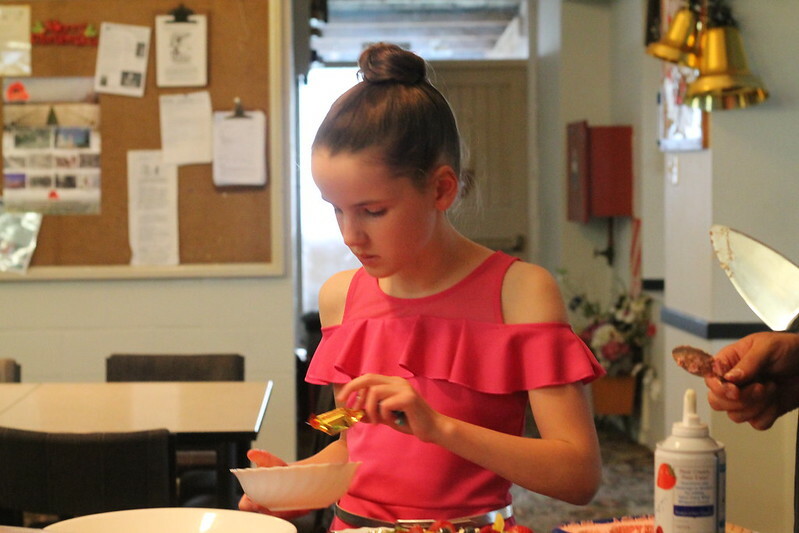 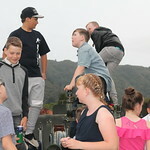 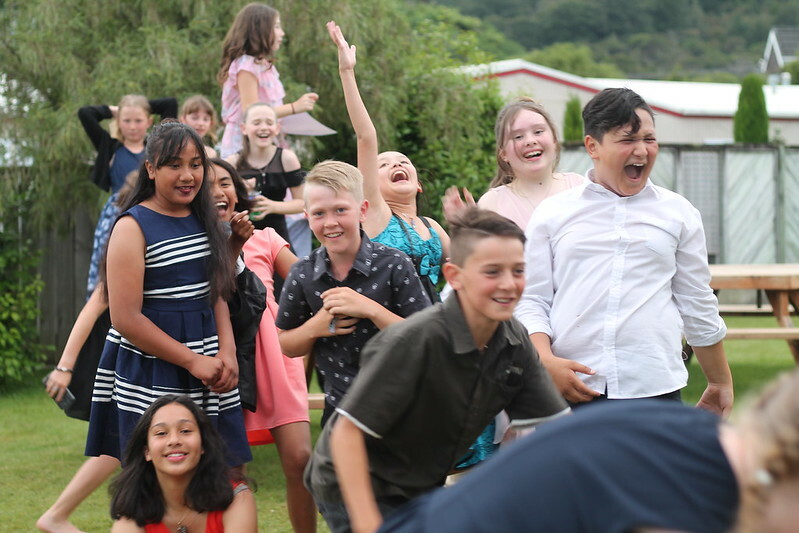 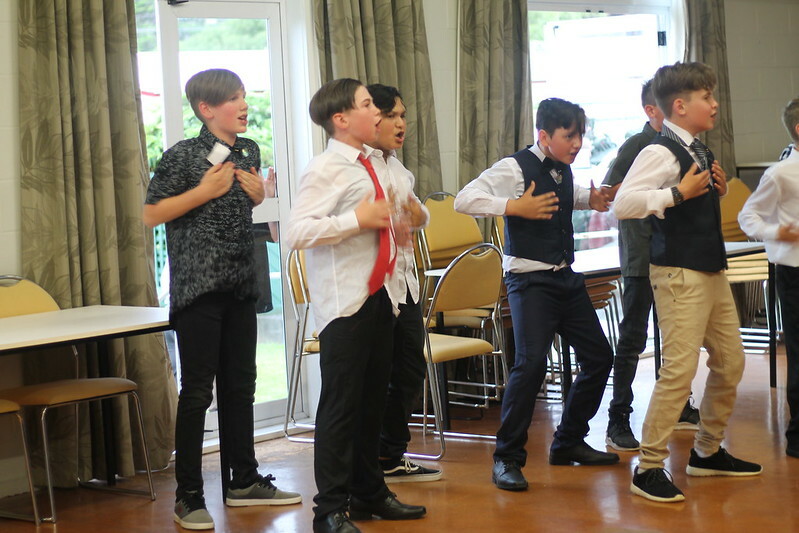 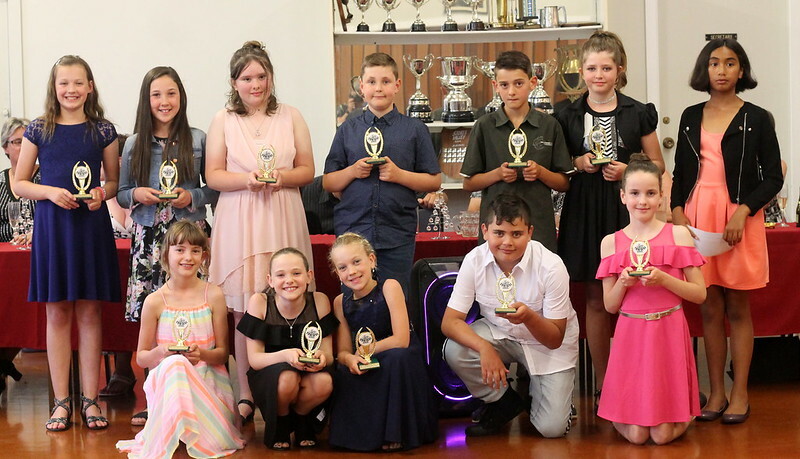 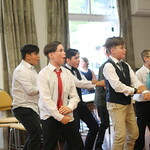 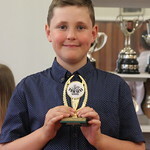 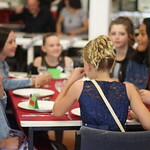 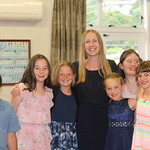 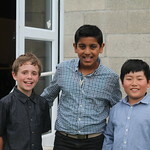 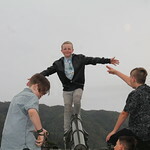 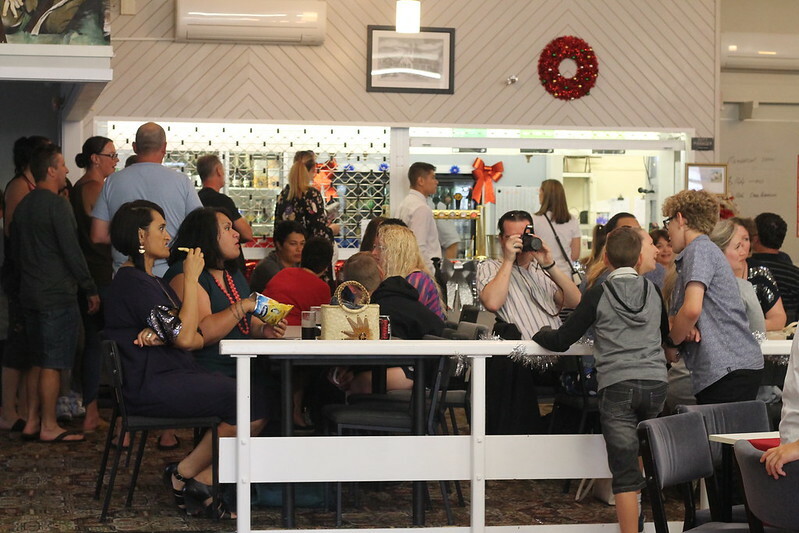 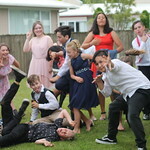 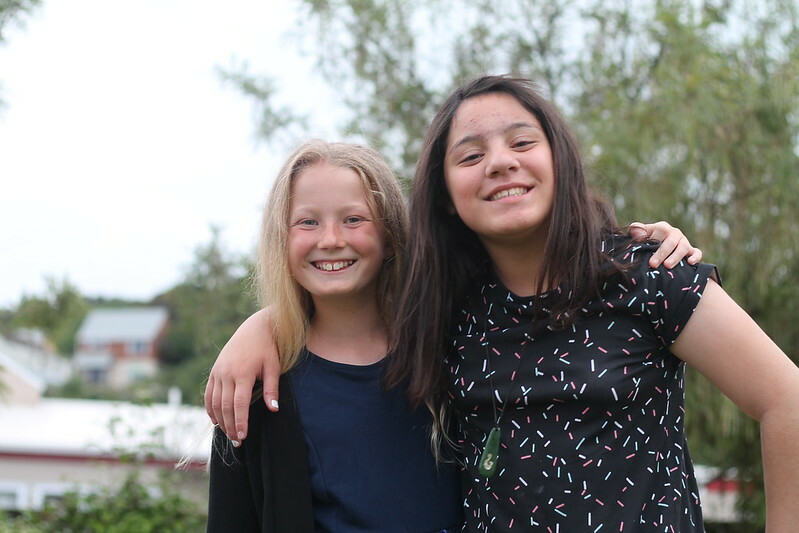 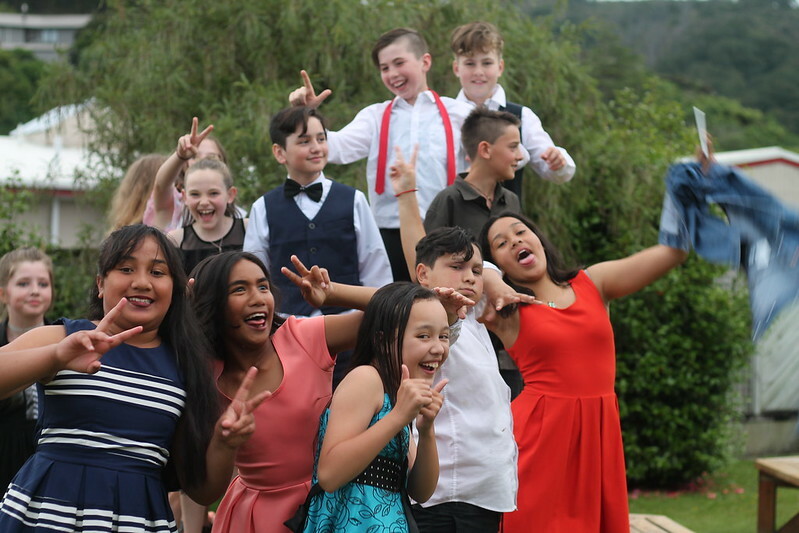 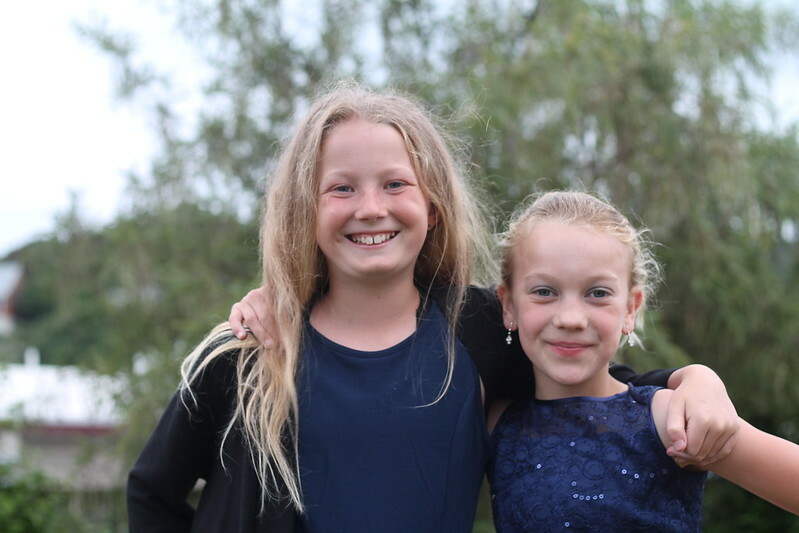 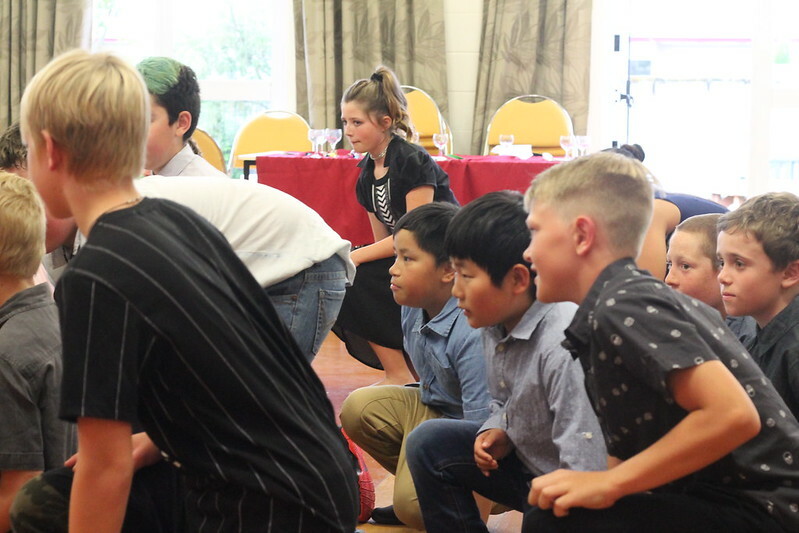 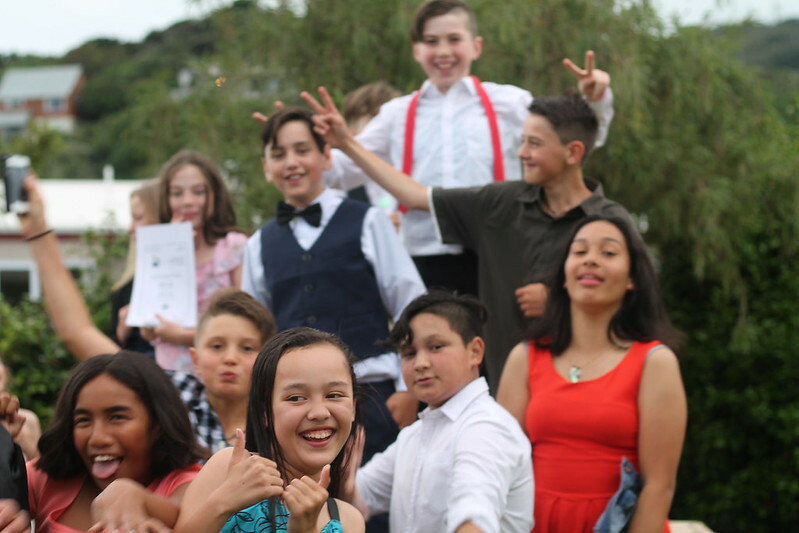 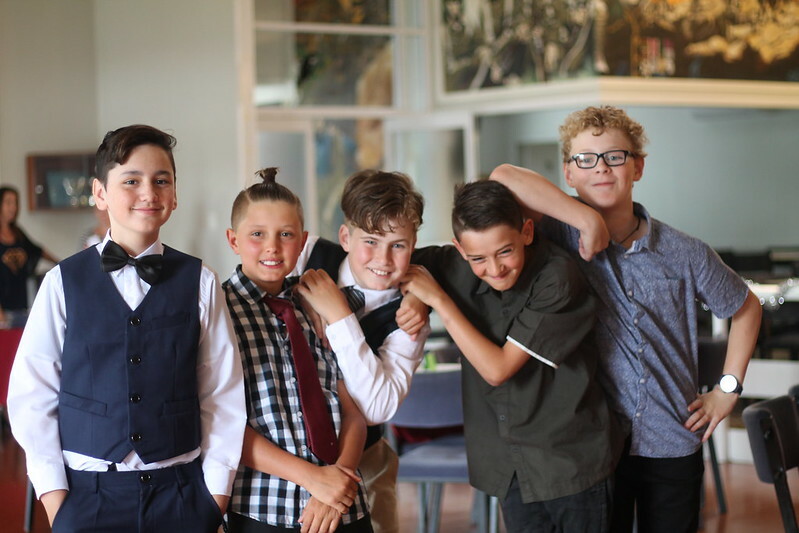 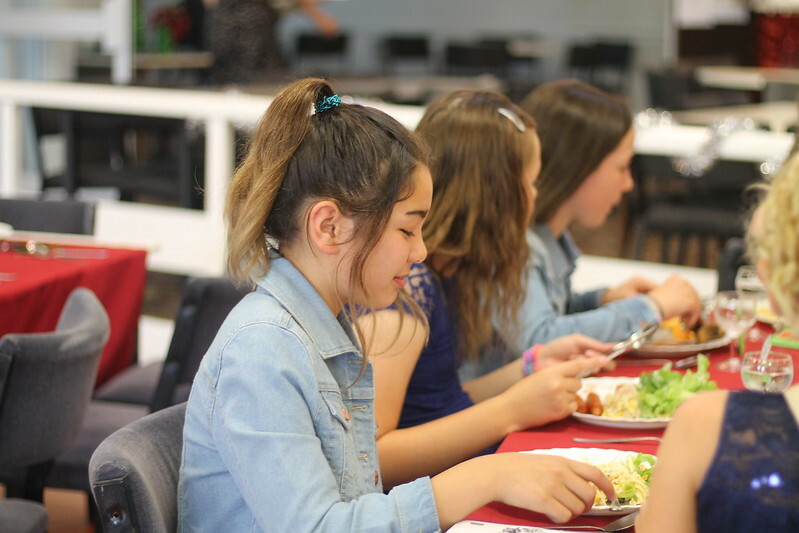 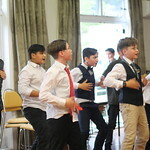 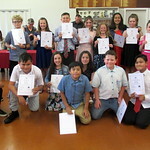 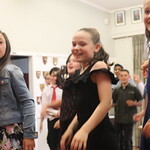 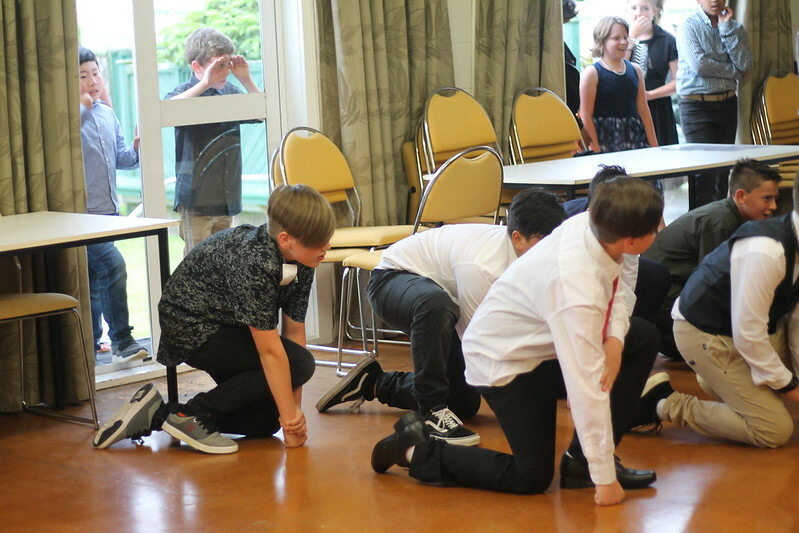 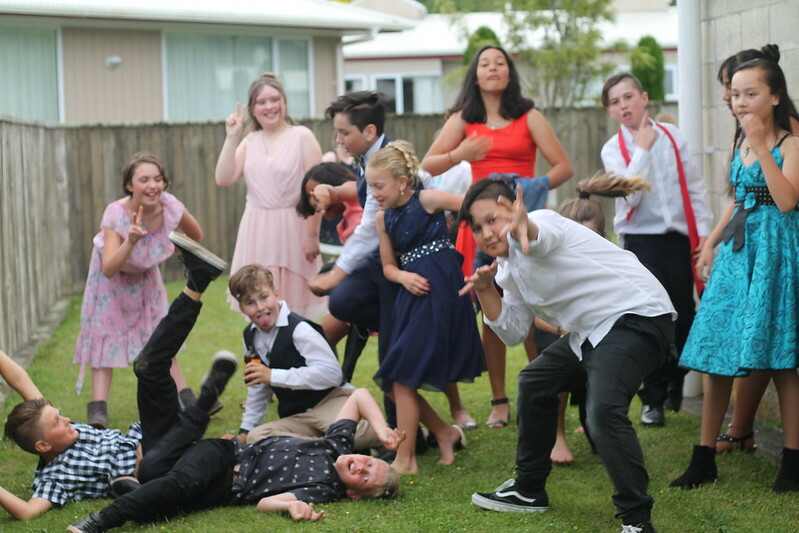 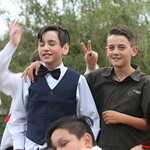 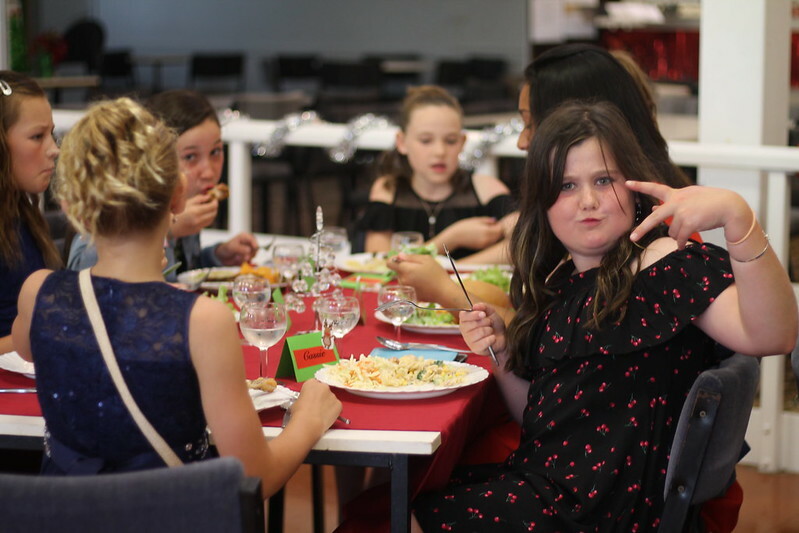 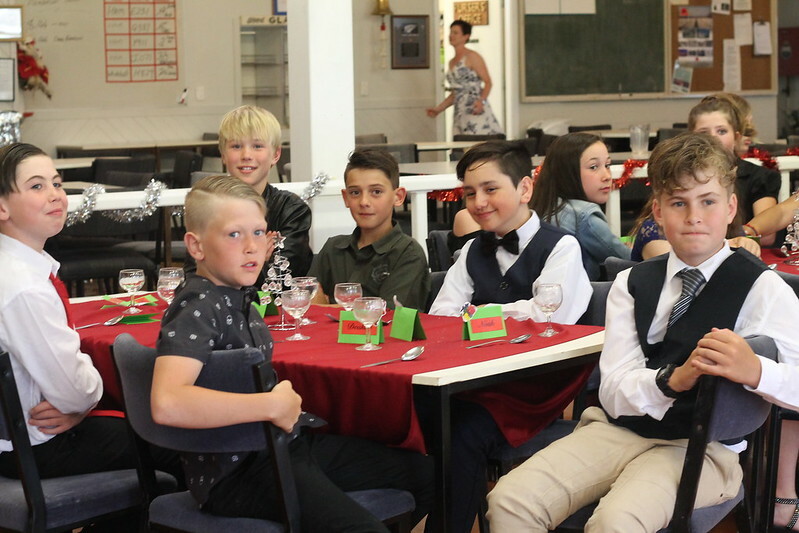 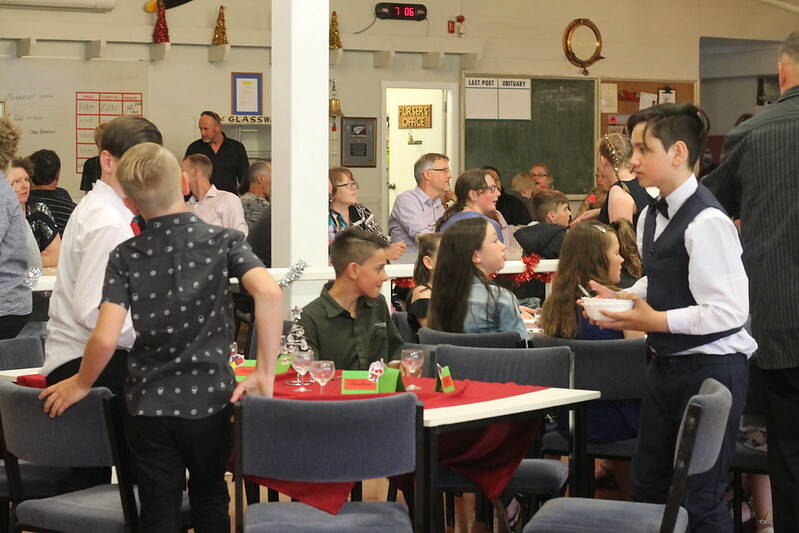 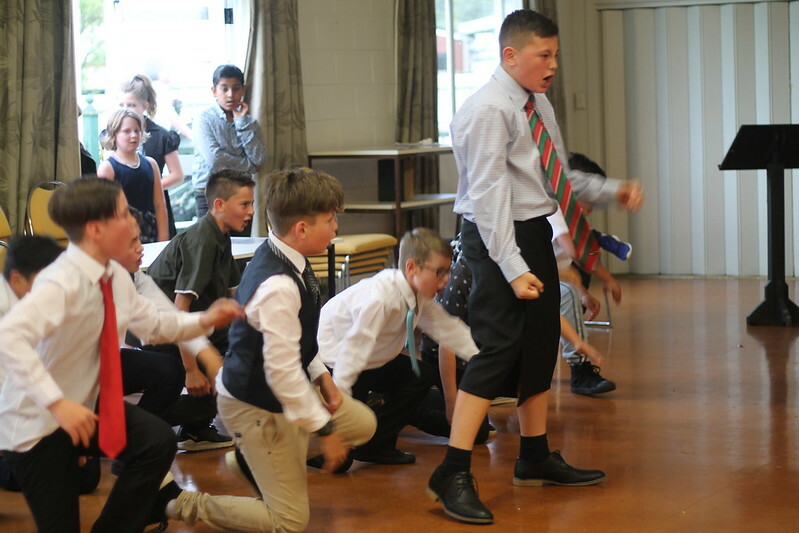 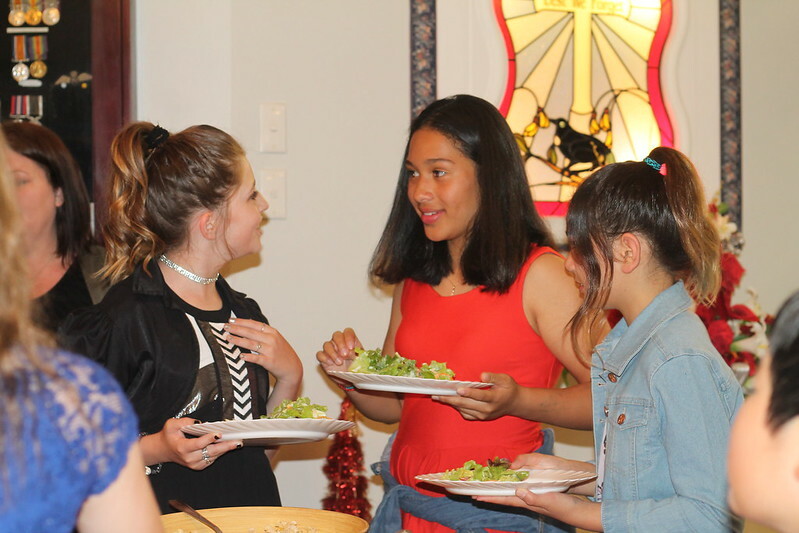 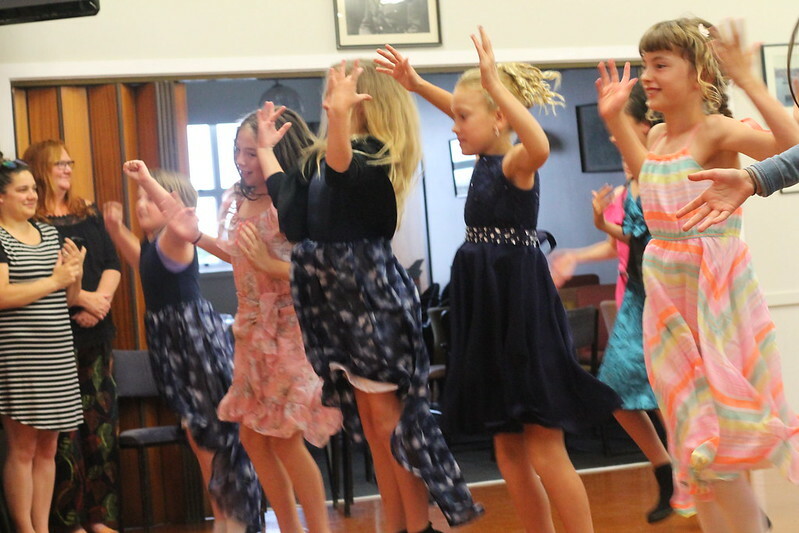 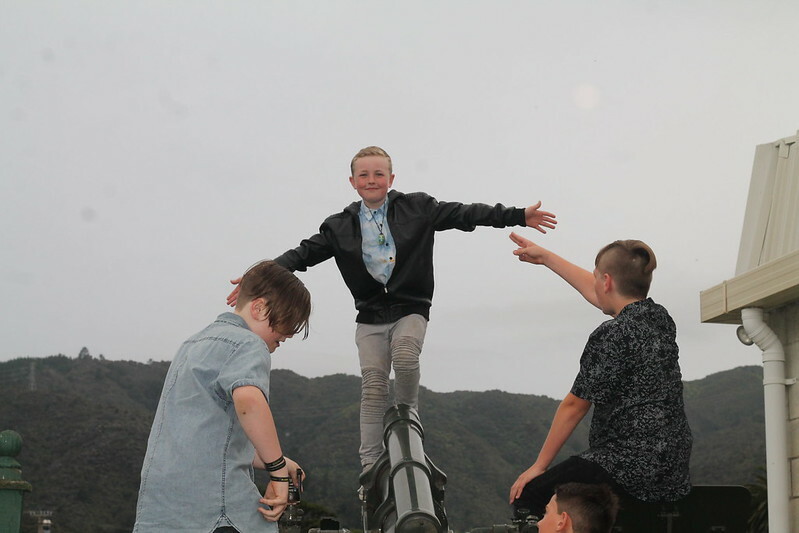 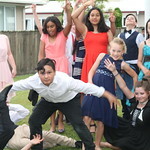 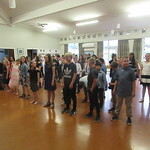 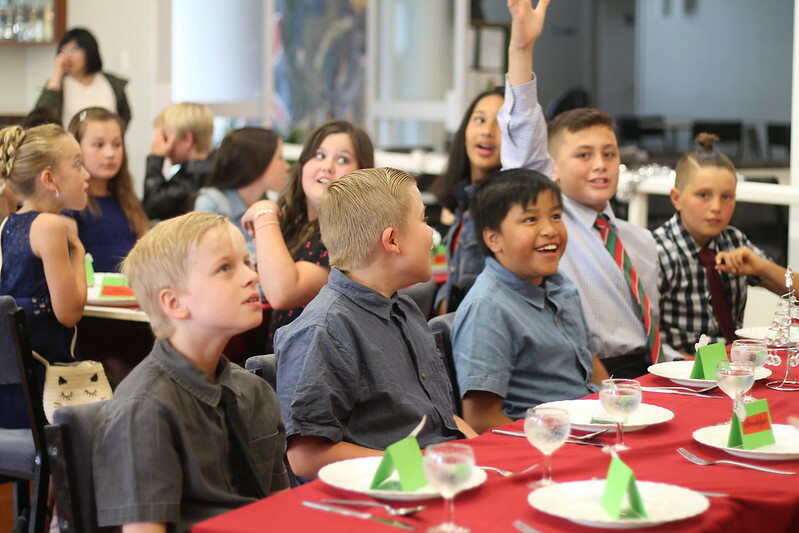 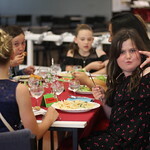 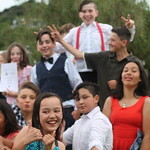 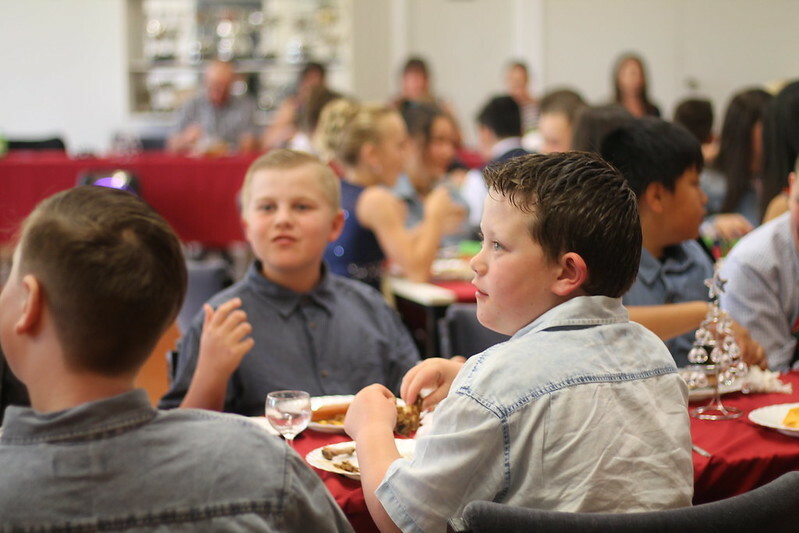 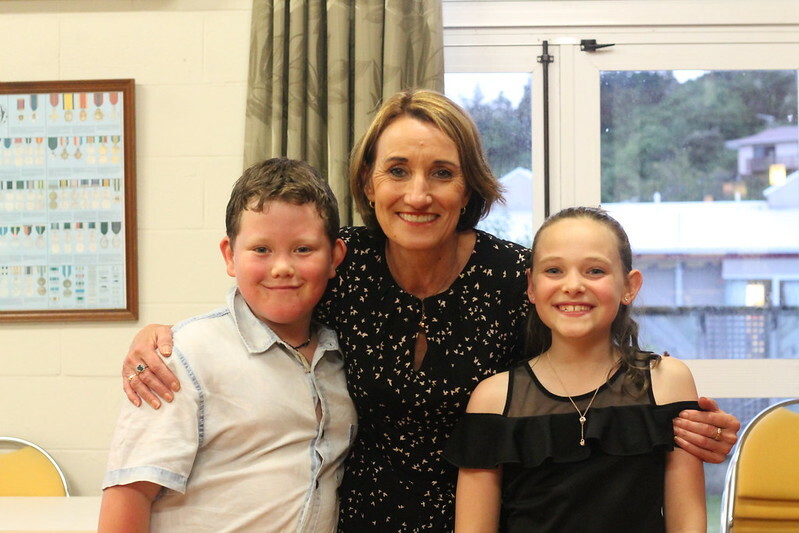 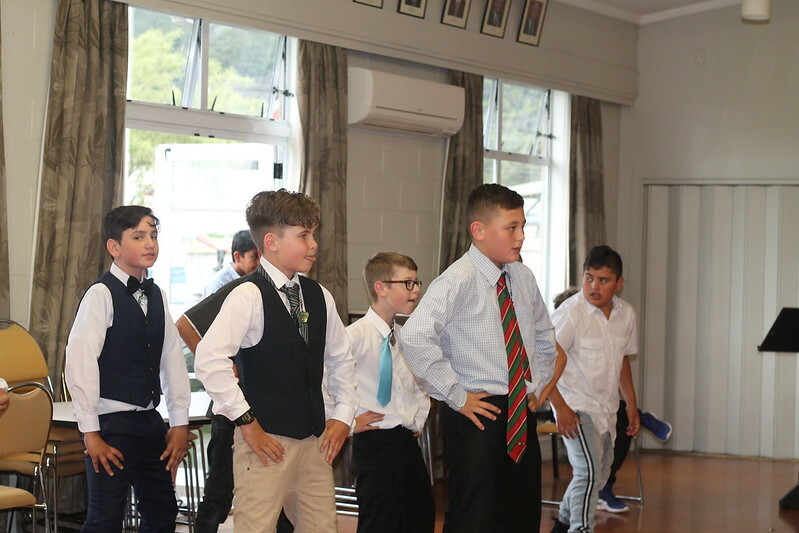 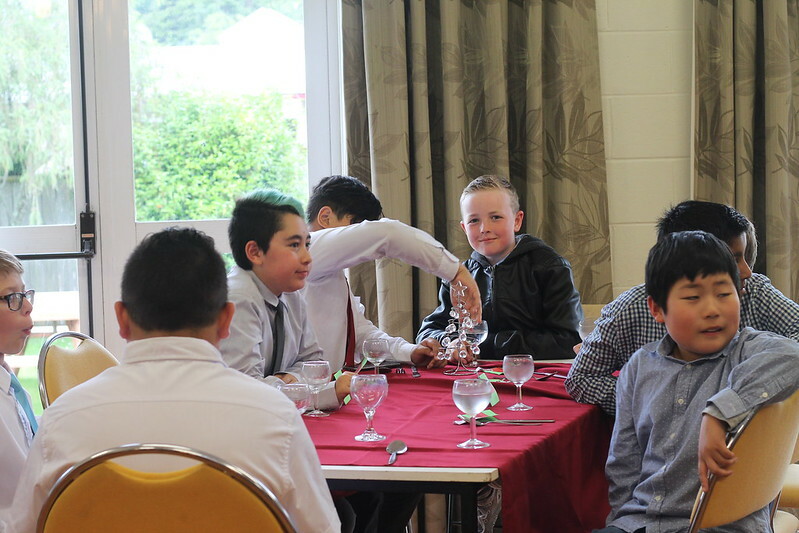 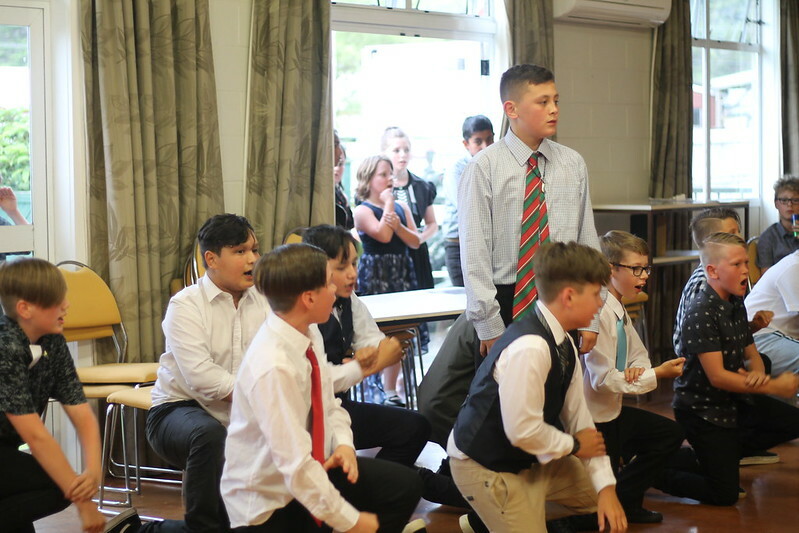 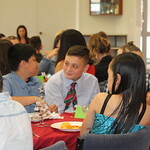 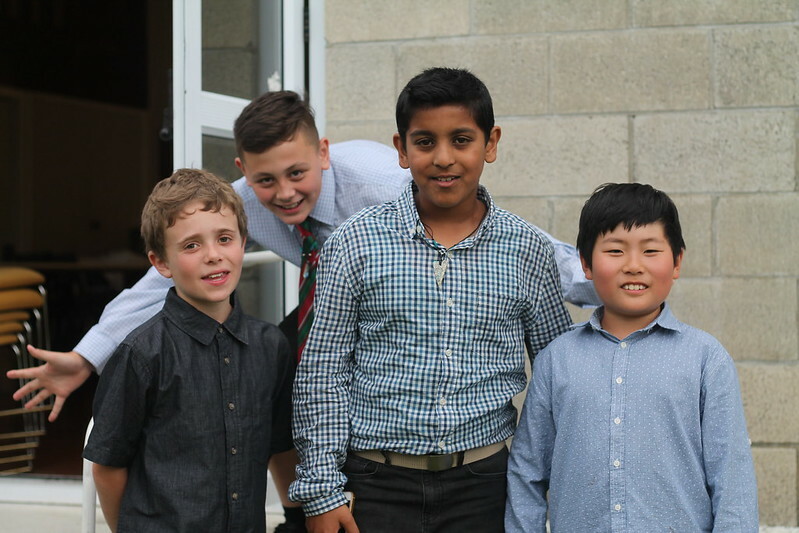 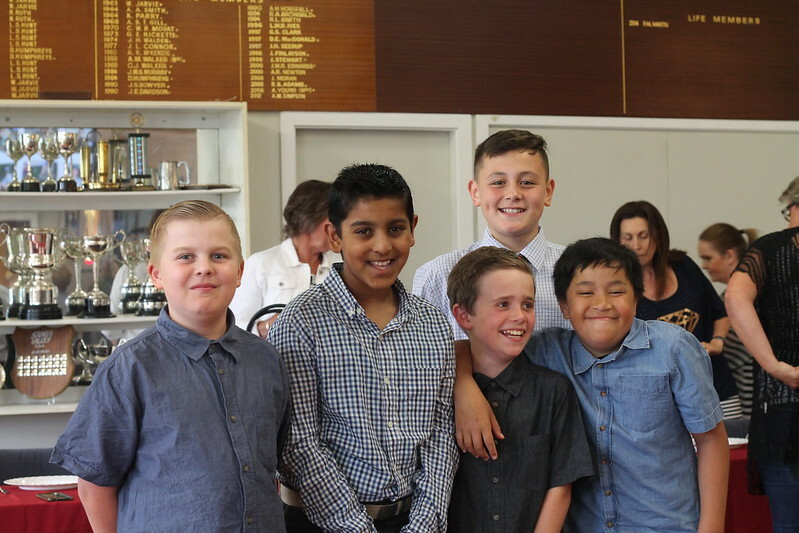 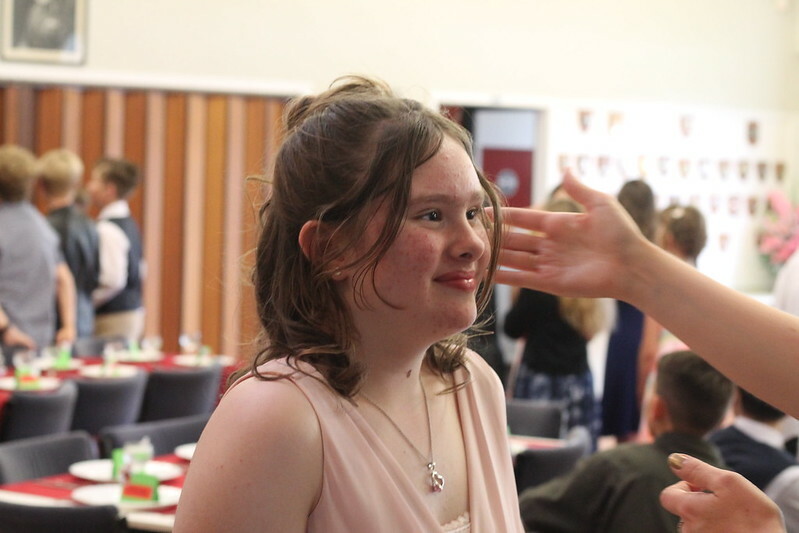 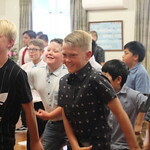 What a way to end their Tawhai journey than to spend some time with their good friends, enjoy some splendid food, and watch some fun photos of themselves and than at the Year 6 leaver’s dinner and prize giving. 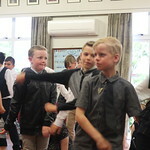 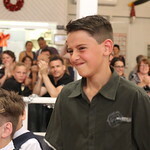 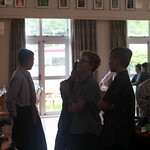 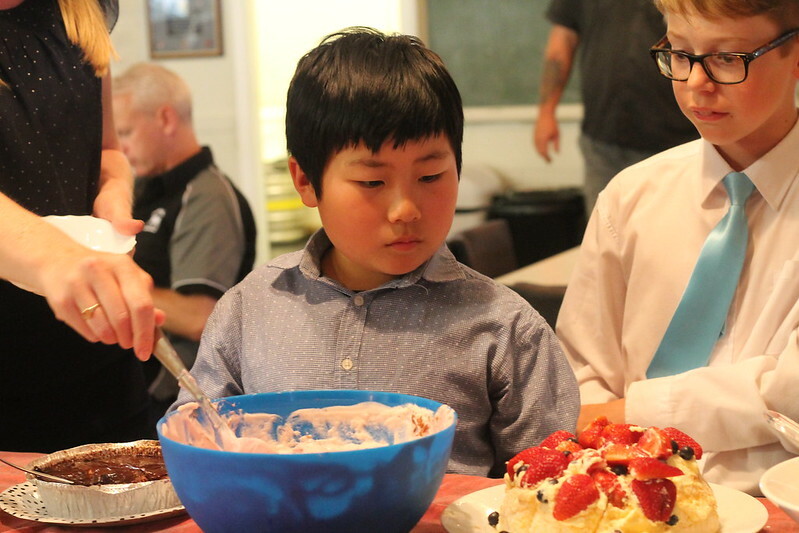 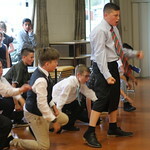 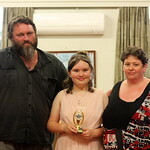 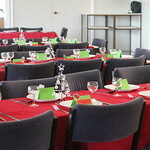 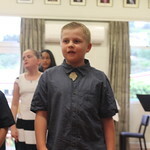 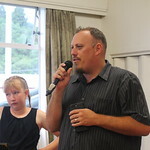 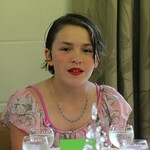 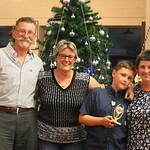 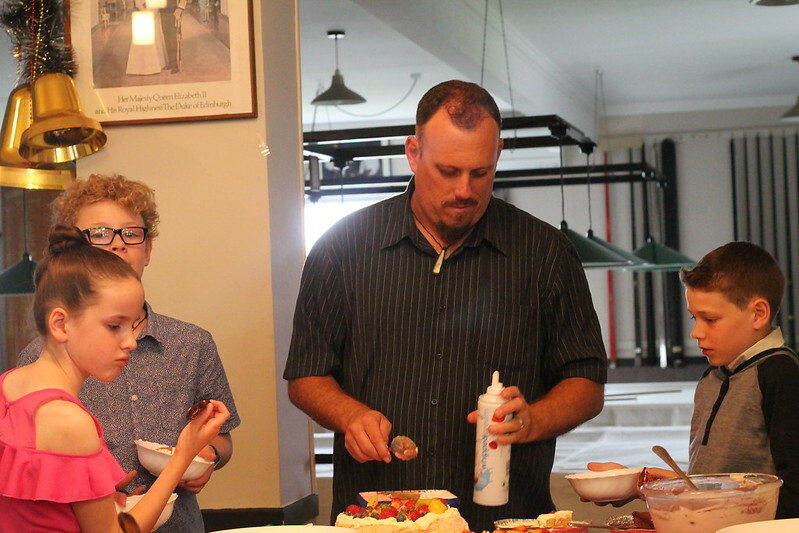 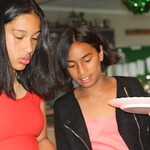 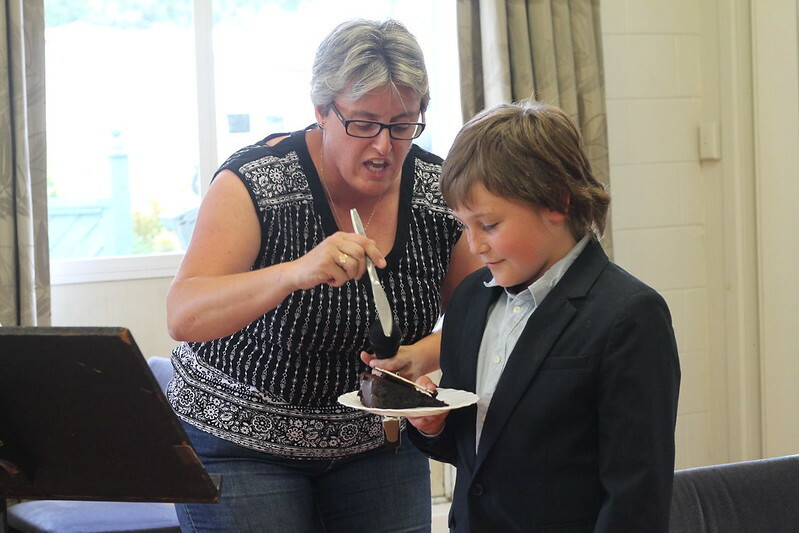 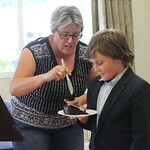 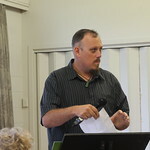 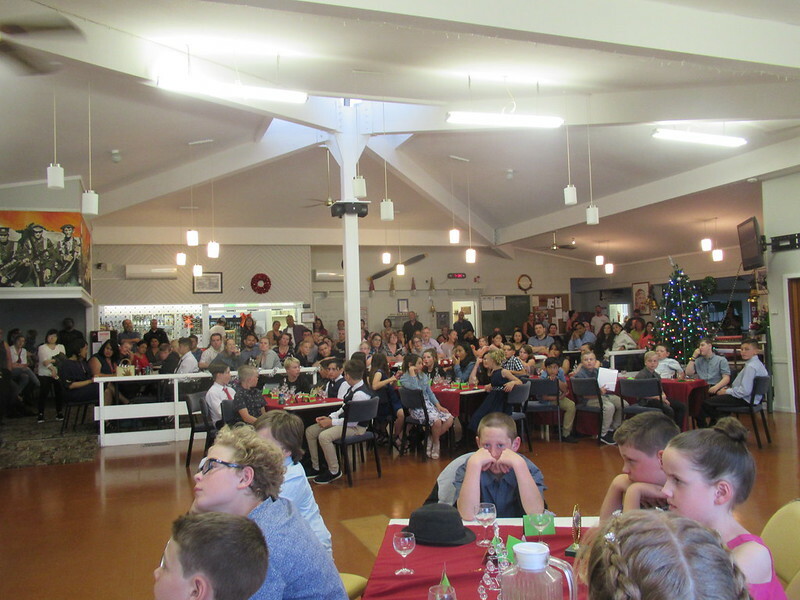 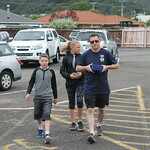 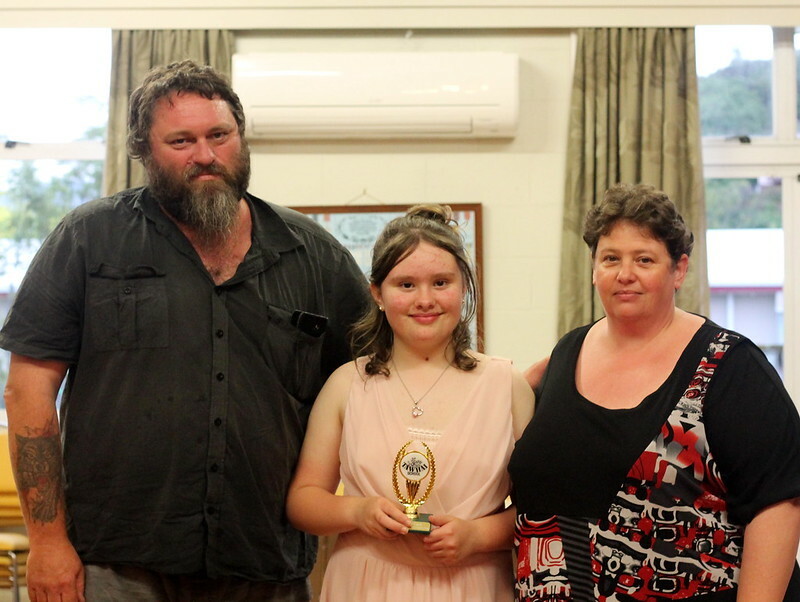 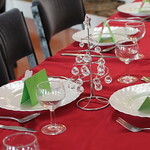 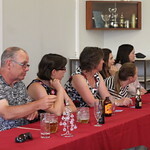 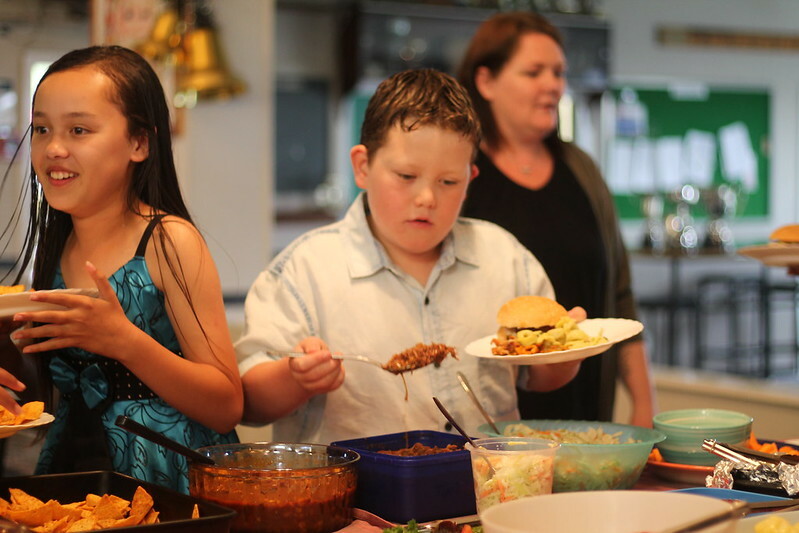 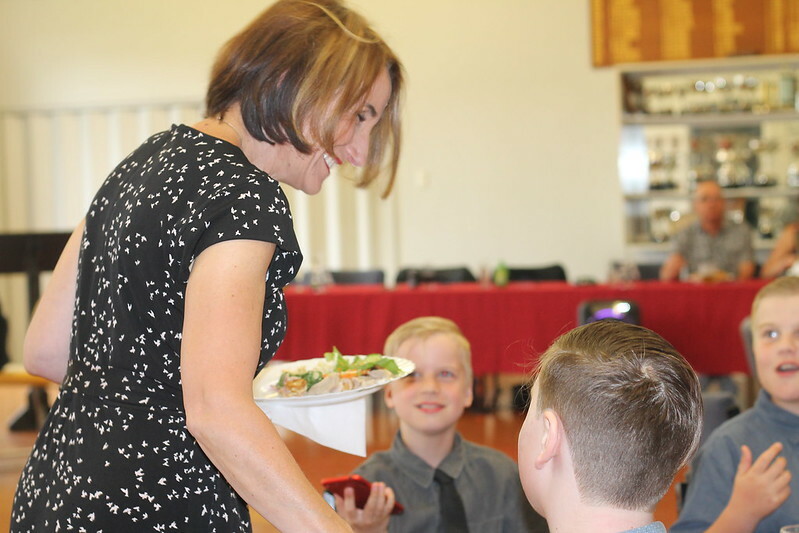 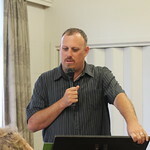 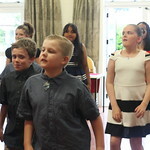 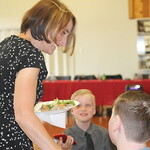 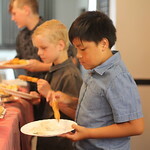 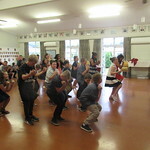 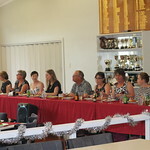 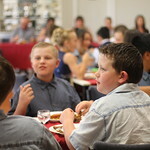 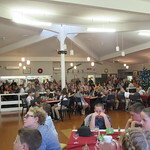 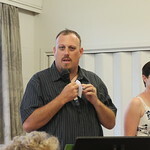 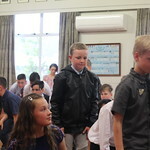 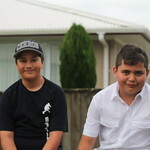 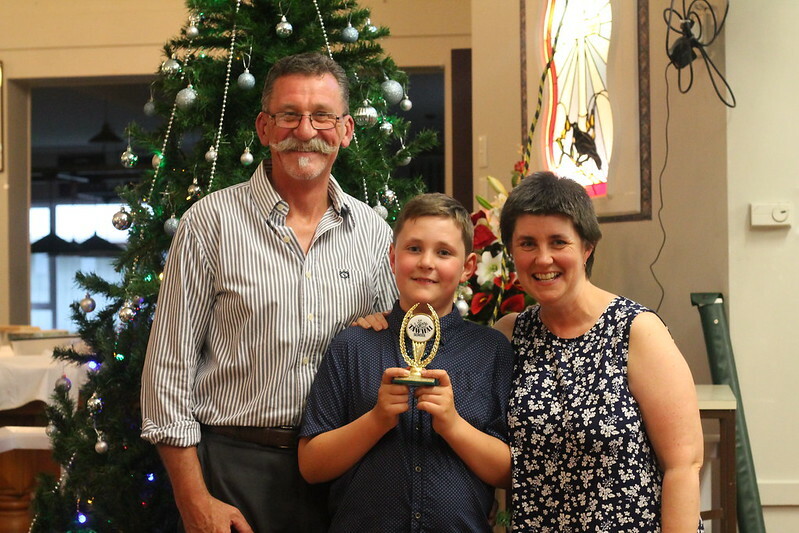 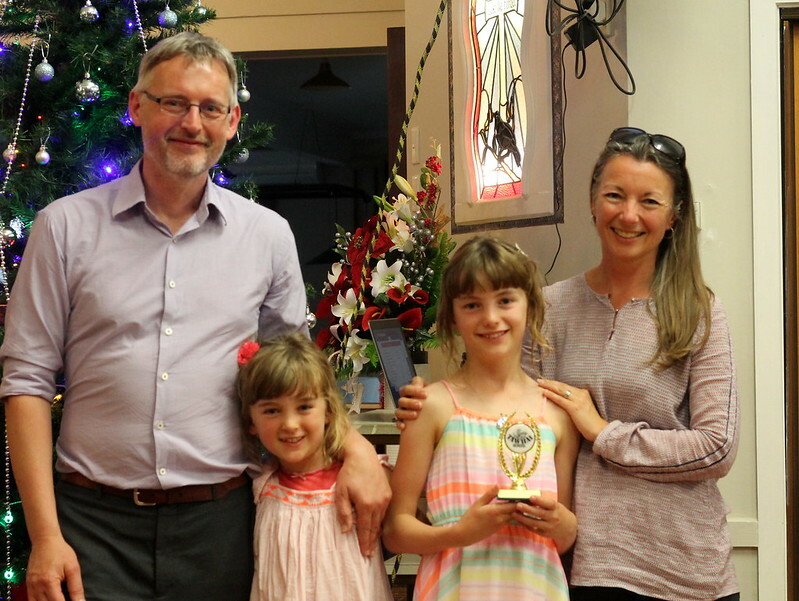 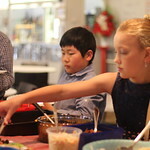 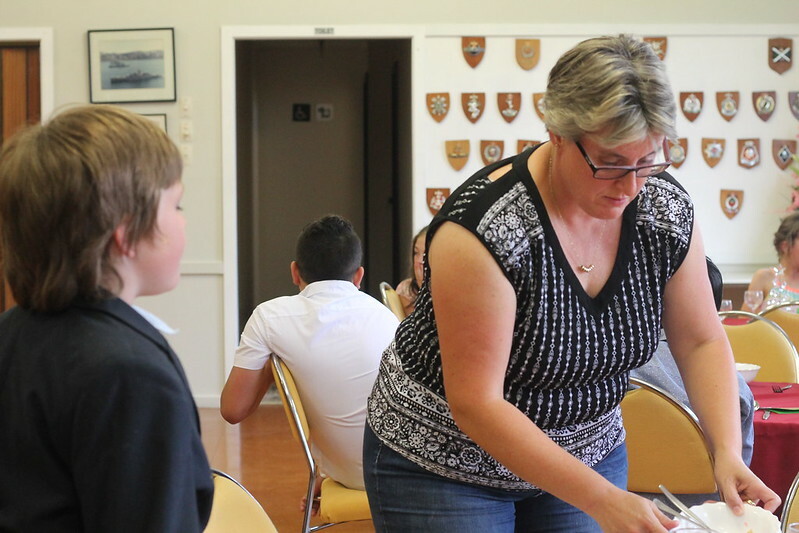 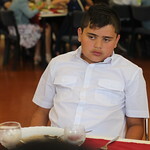 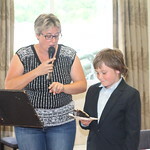 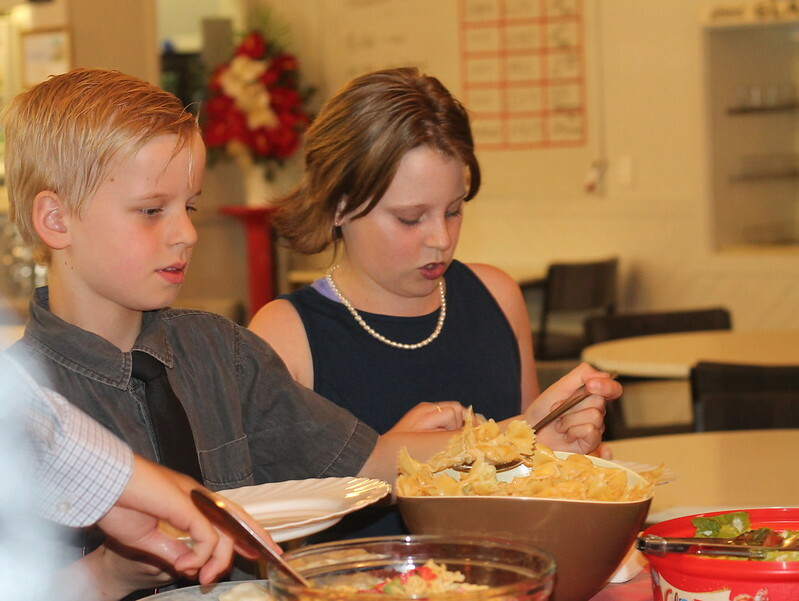 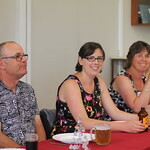 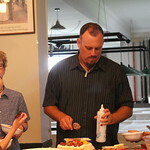 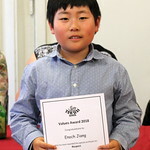 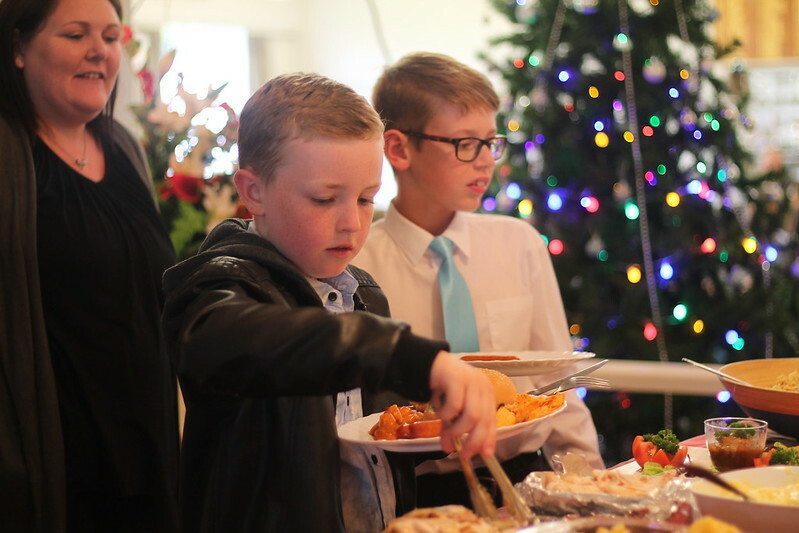 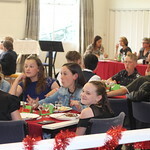 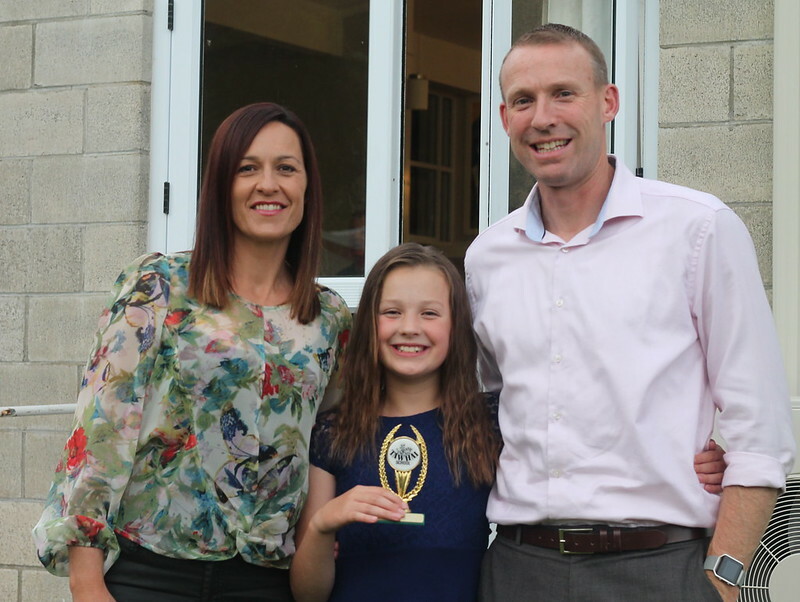 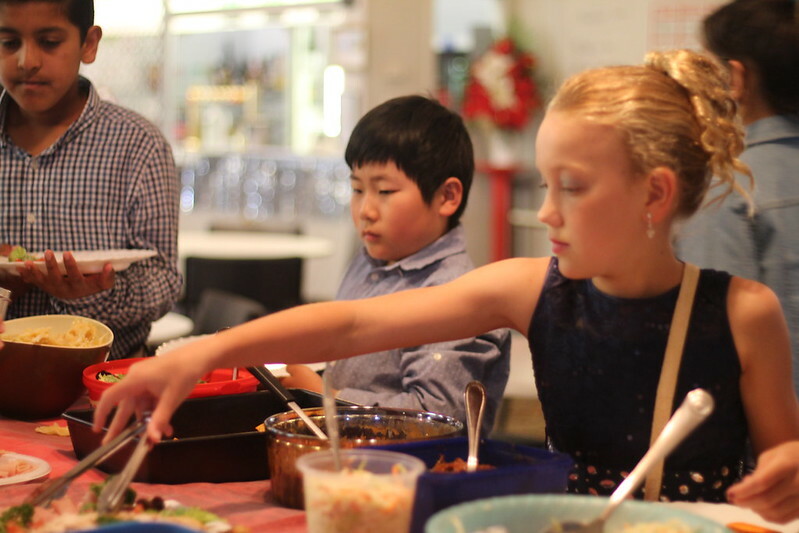 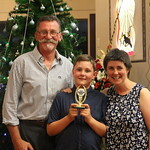 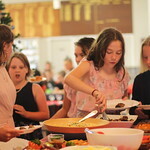 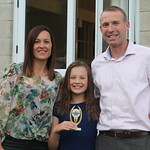 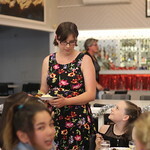 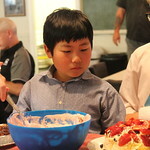 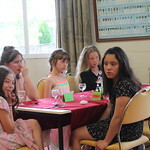 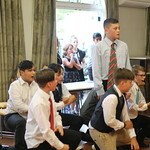 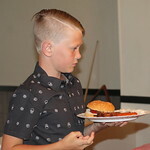 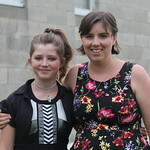 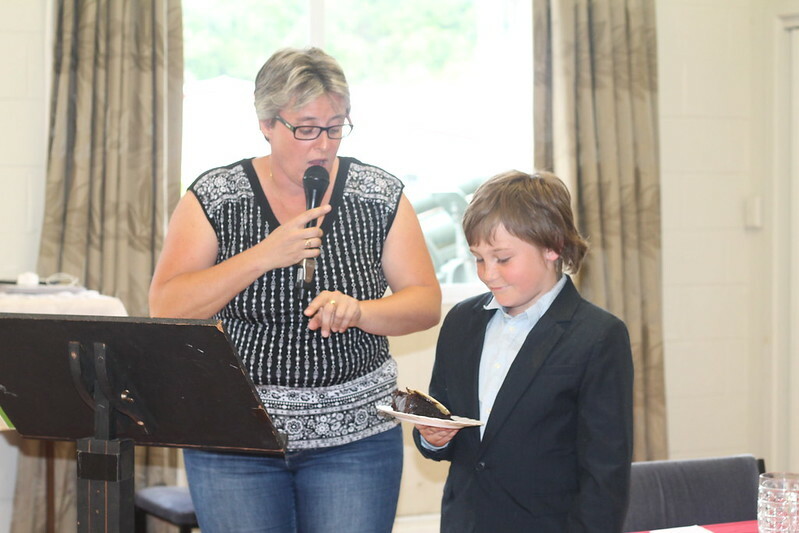 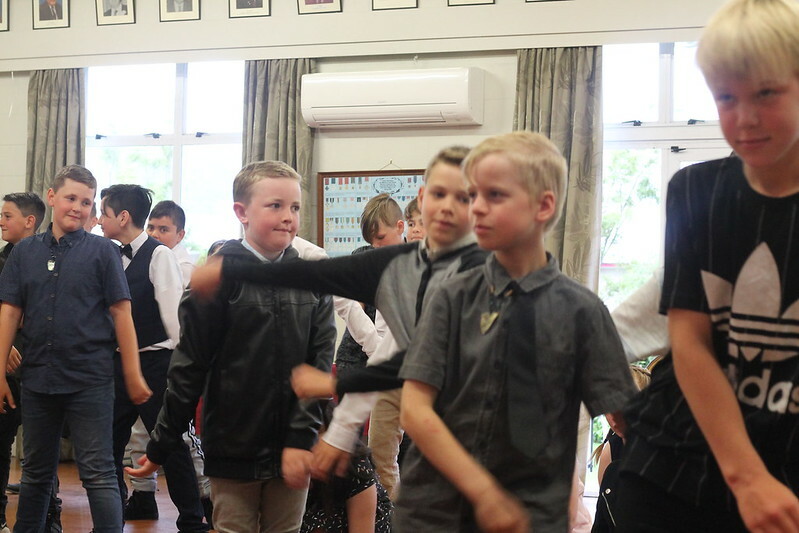 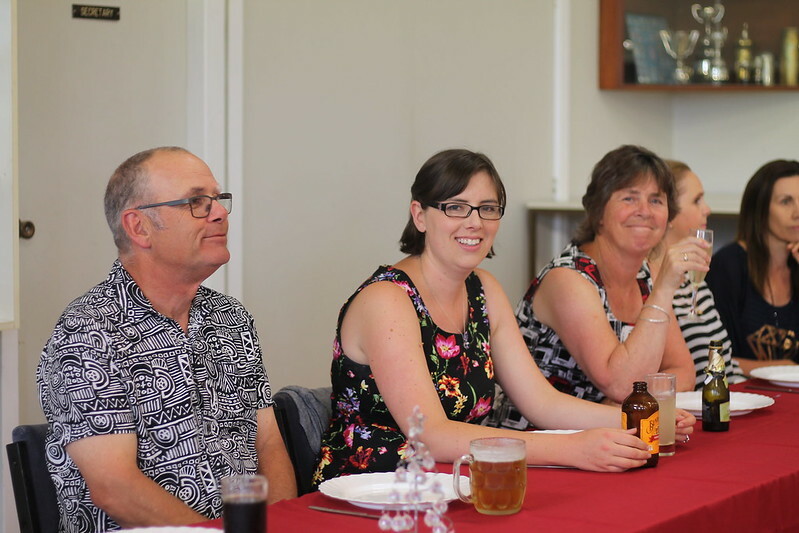 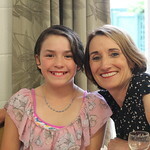 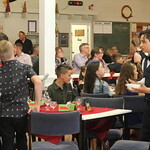 The evening kicked off with a feast provided by the parents of the Year 6 students. 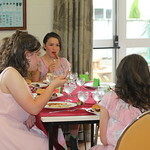 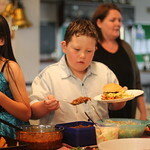 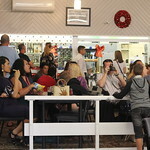 so after a blessing by Lennox, we all tucked into a very sumptuous meal. 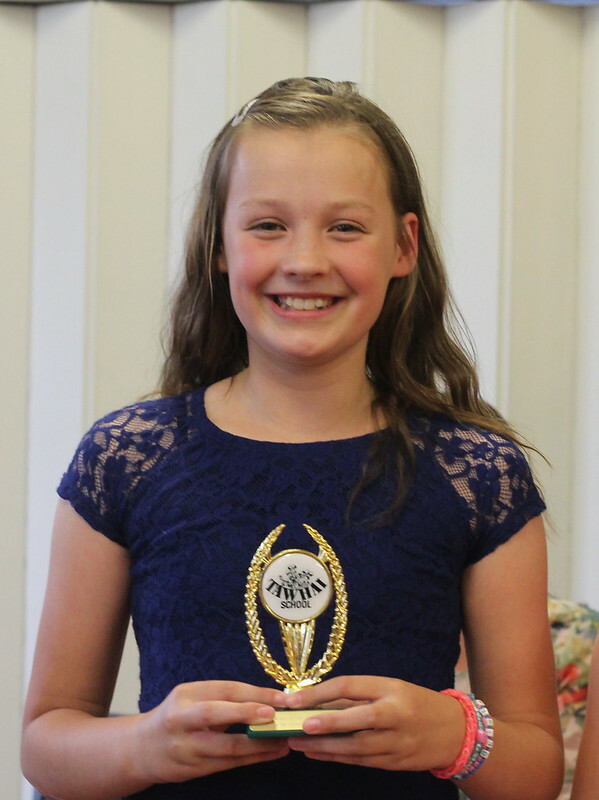 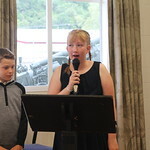 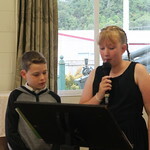 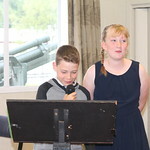 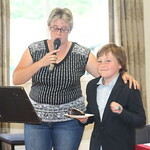 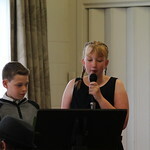 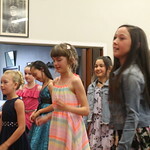 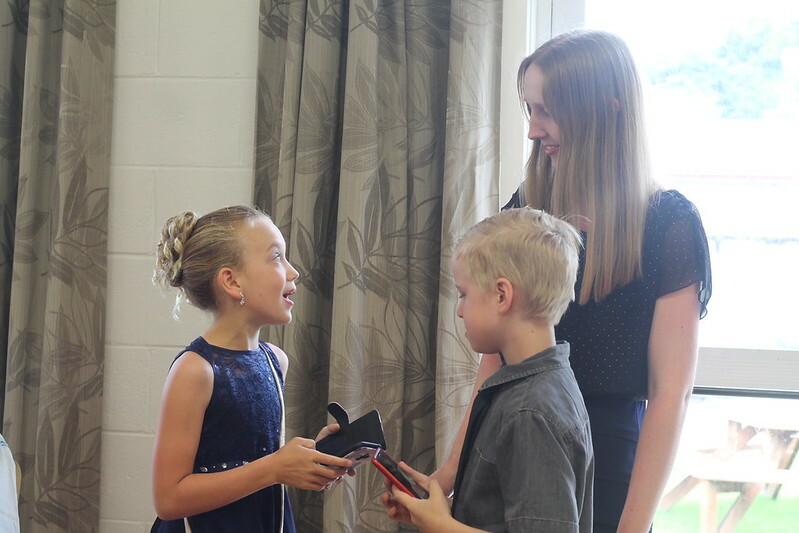 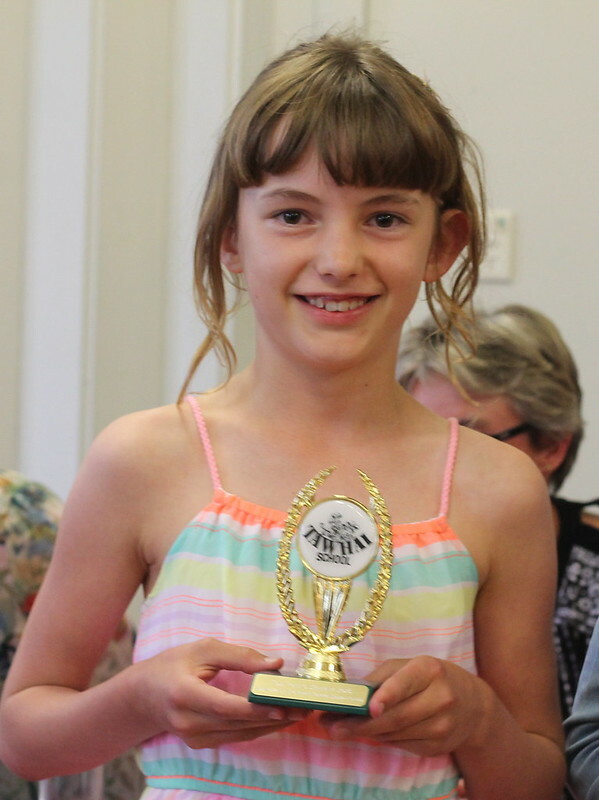 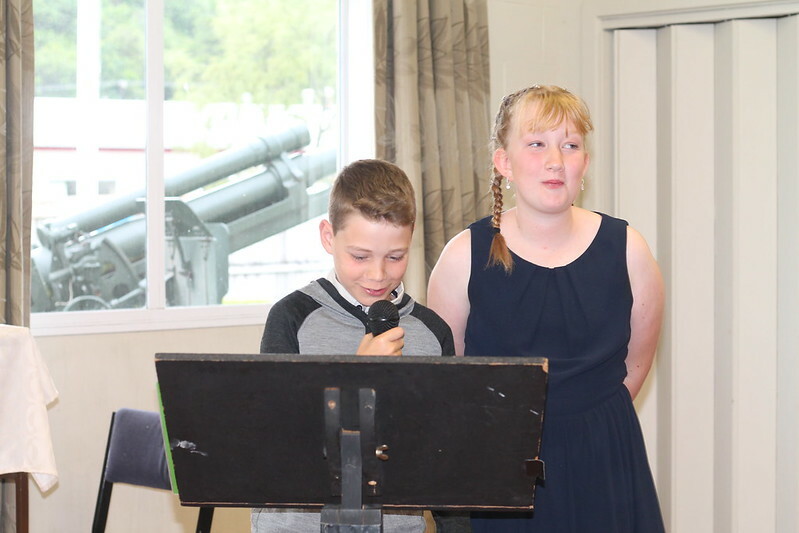 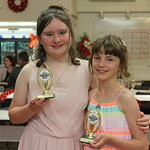 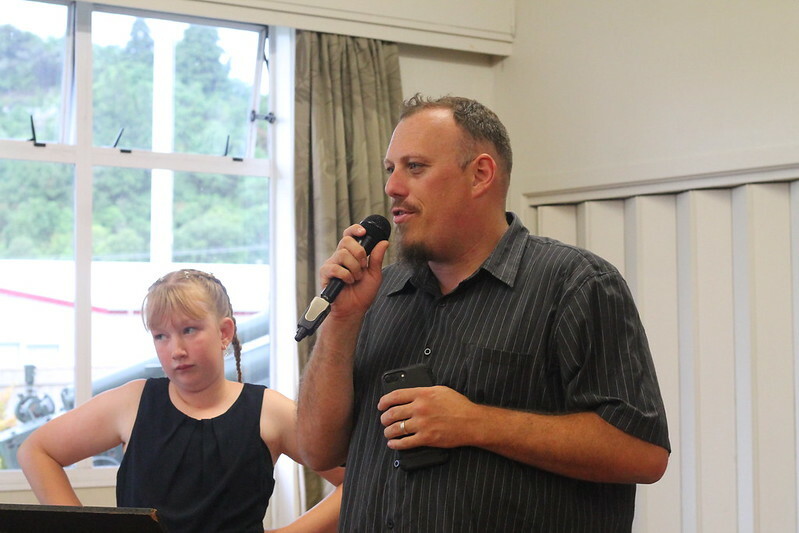 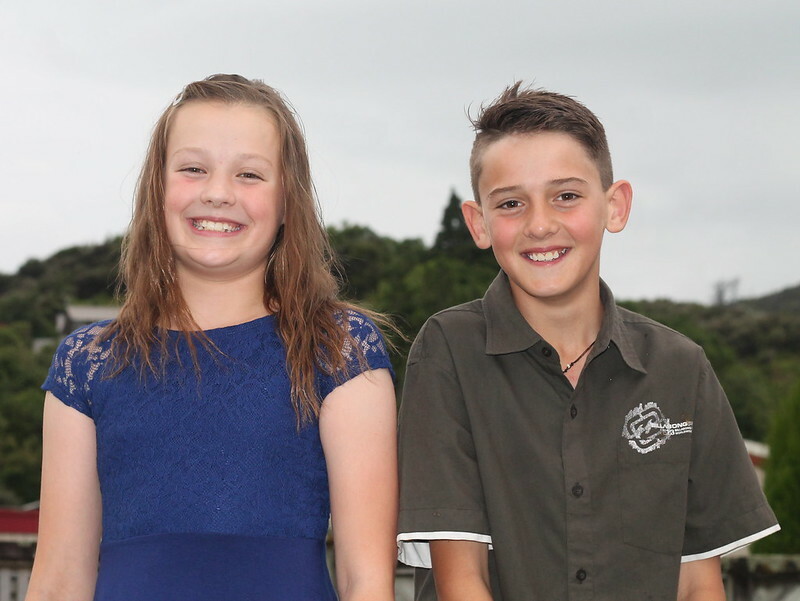 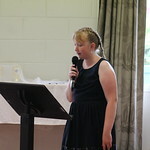 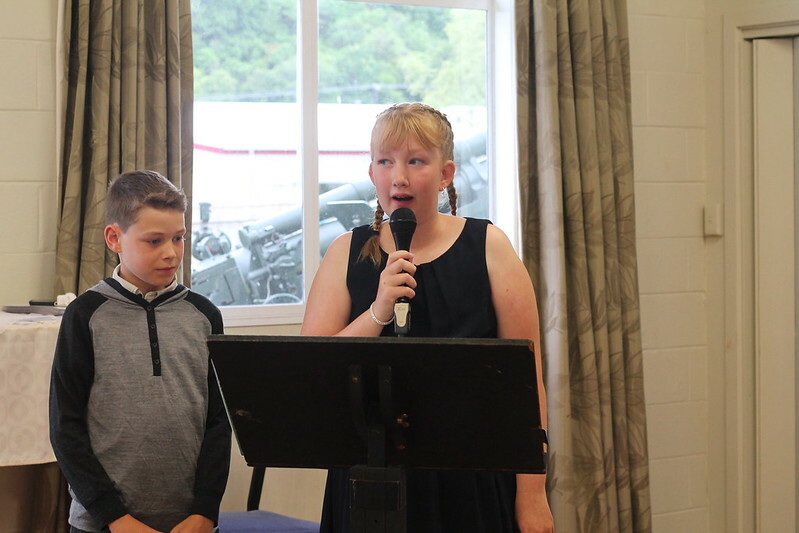 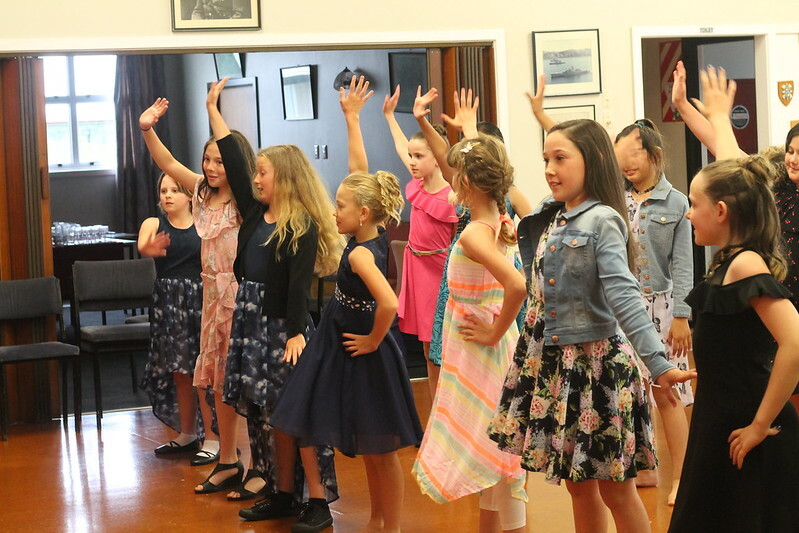 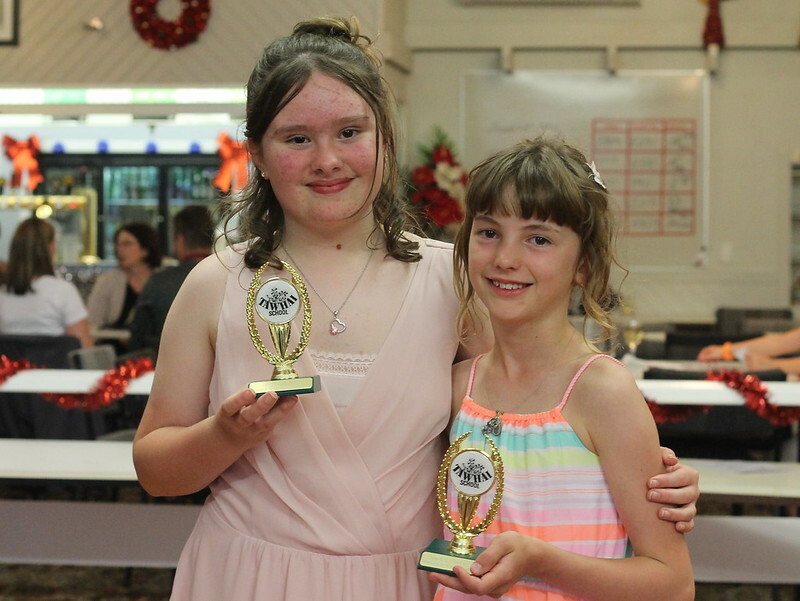 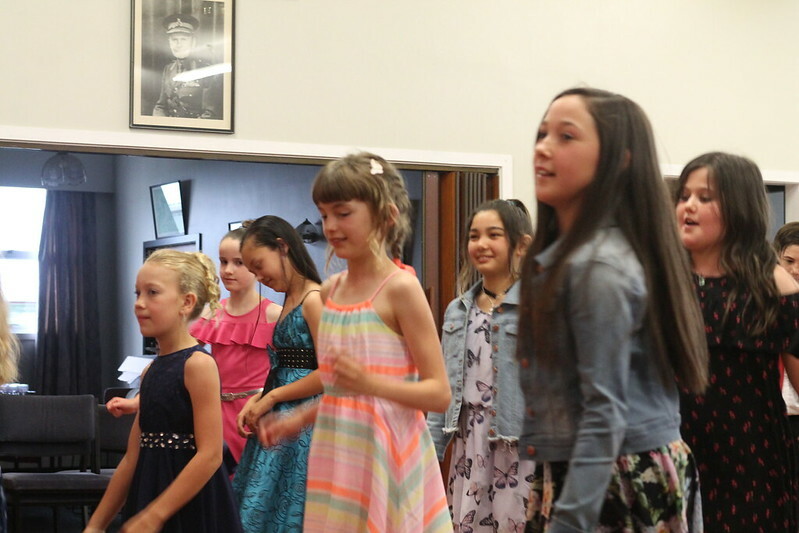 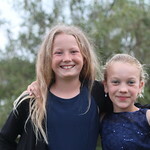 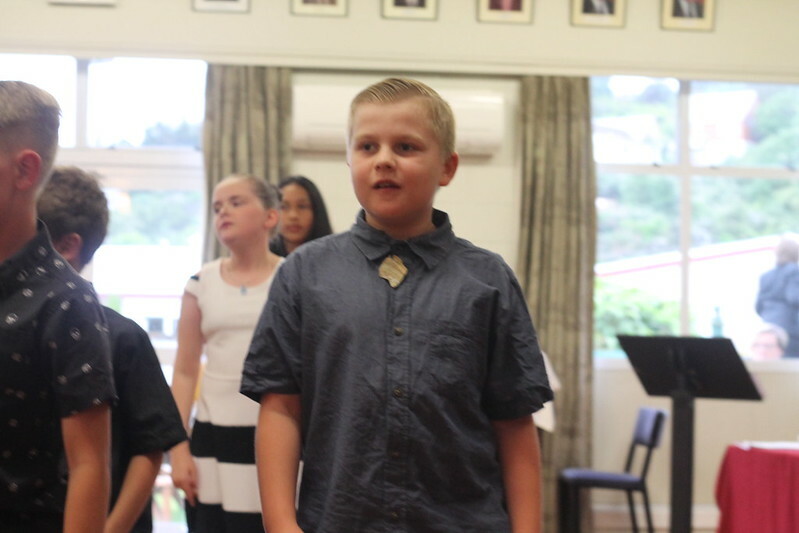 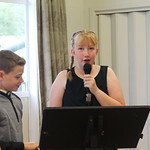 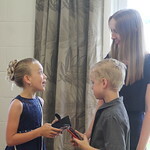 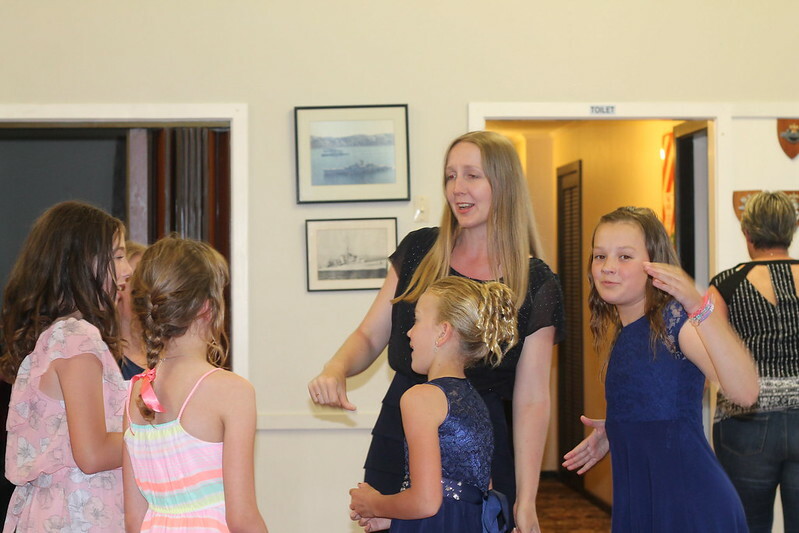 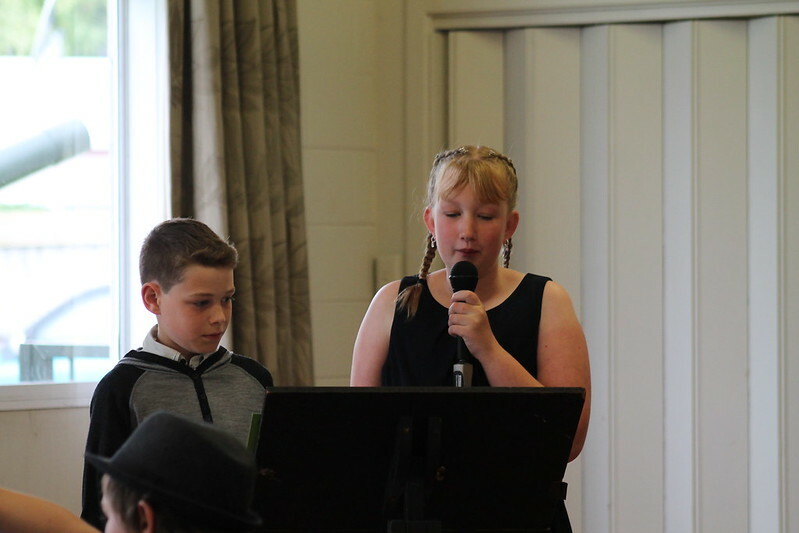 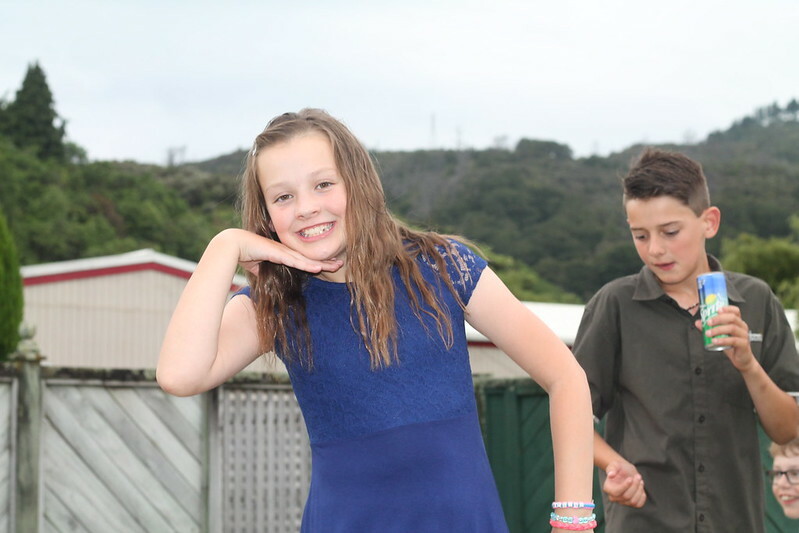 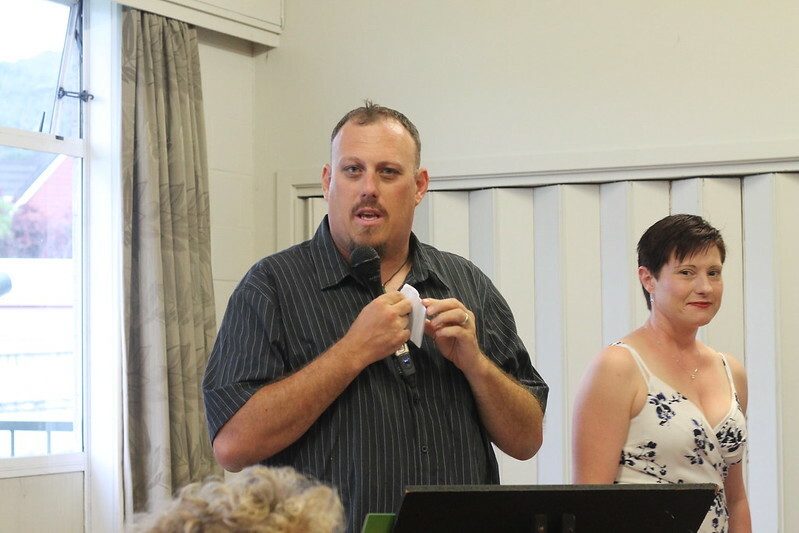 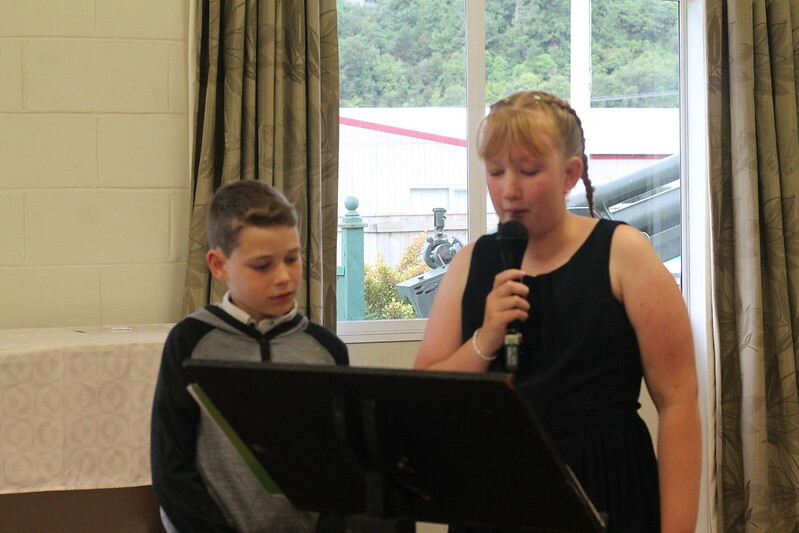 Our M.C’s for the evening were Sienna and Hayden who were both very entertaining. 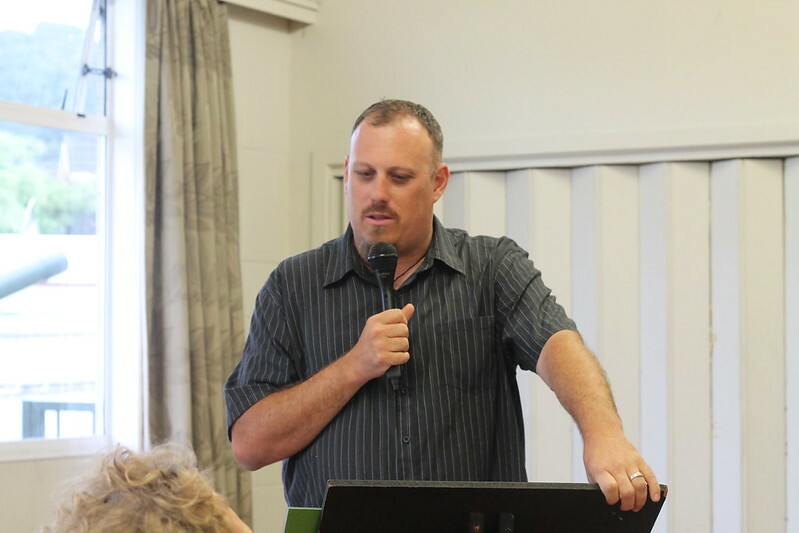 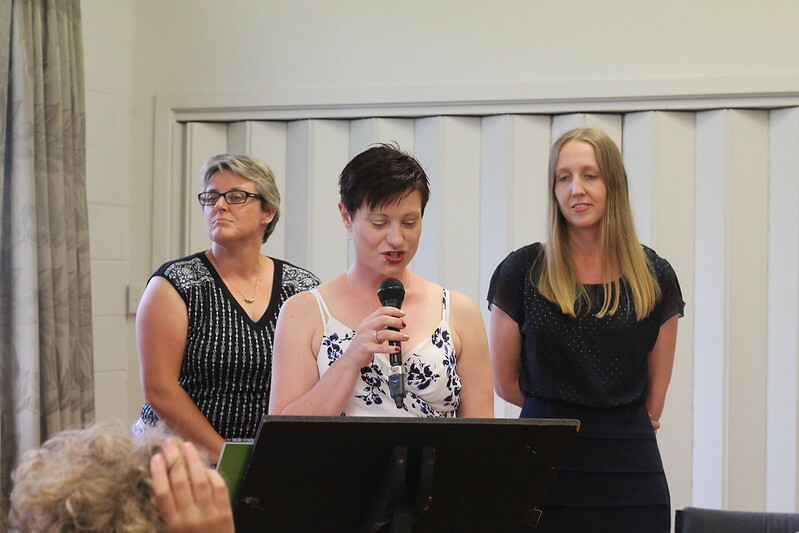 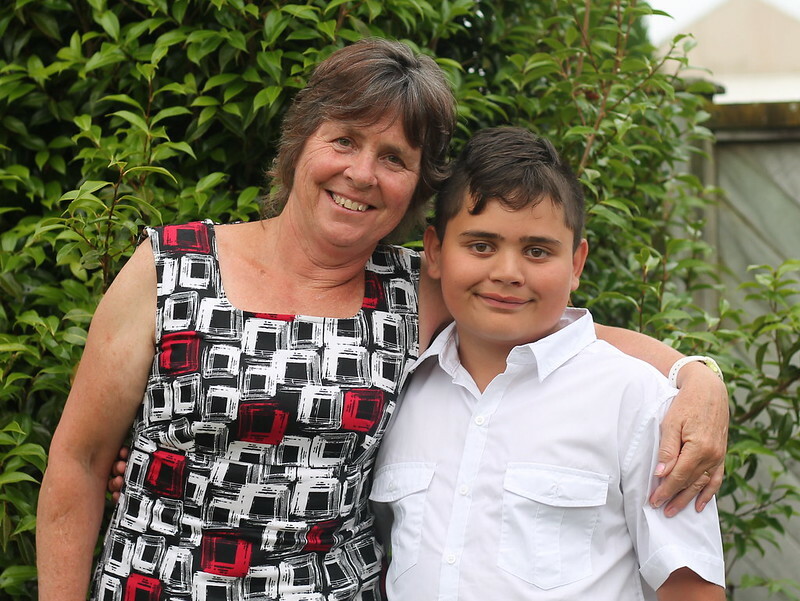 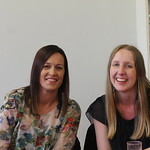 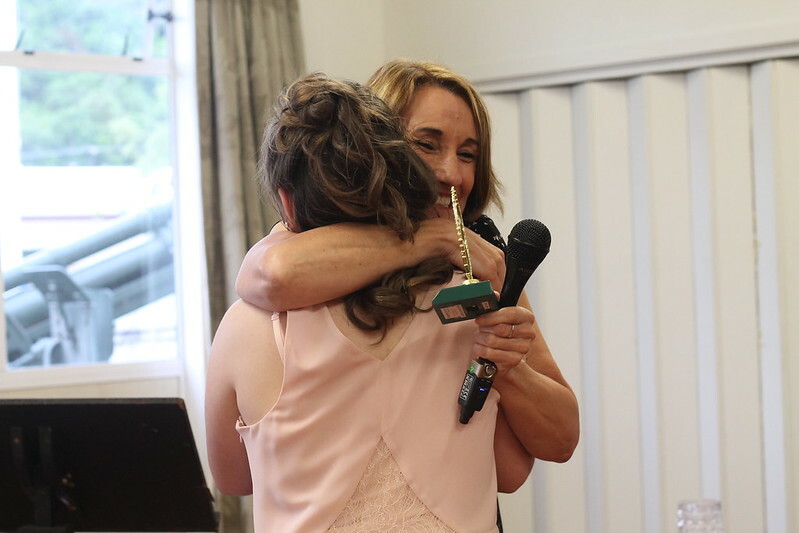 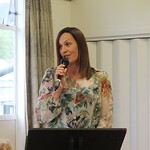 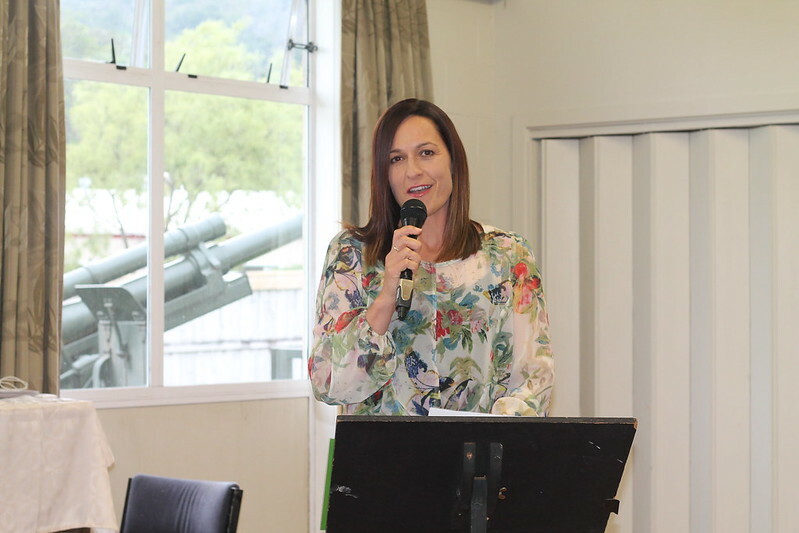 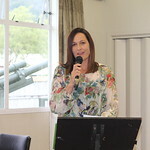 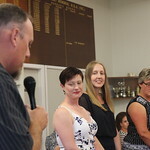 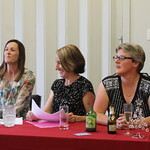 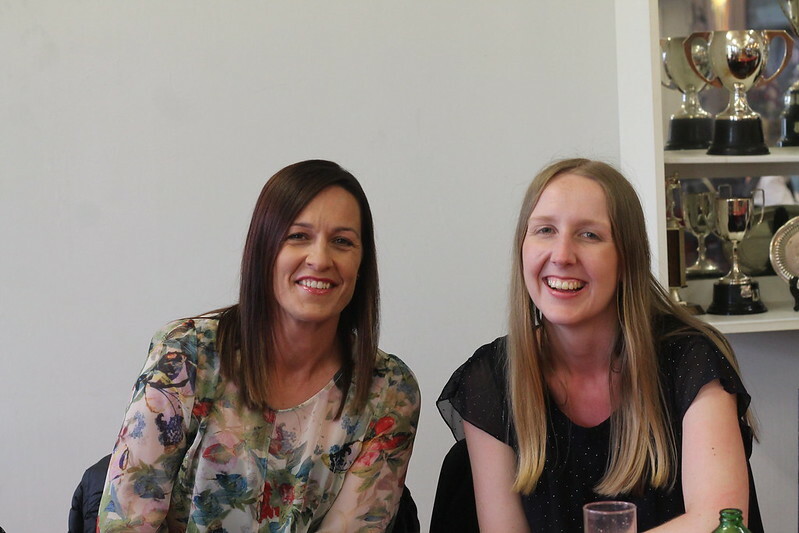 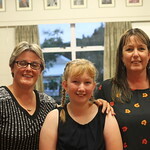 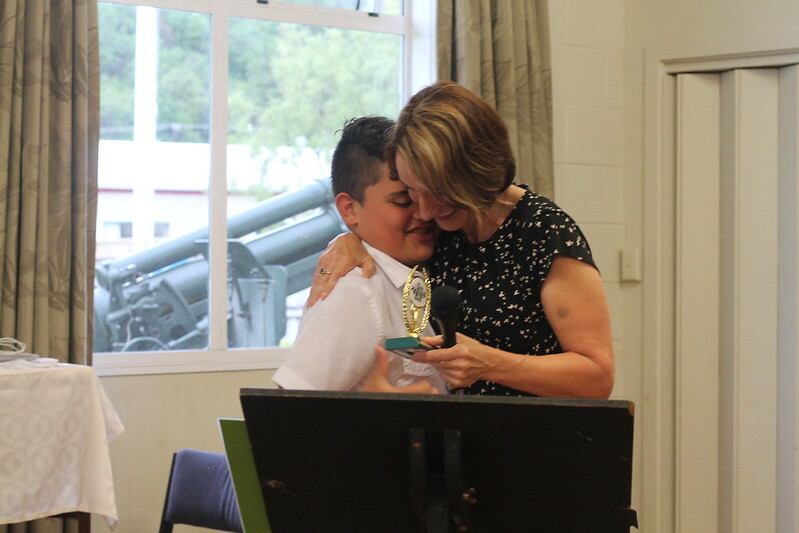 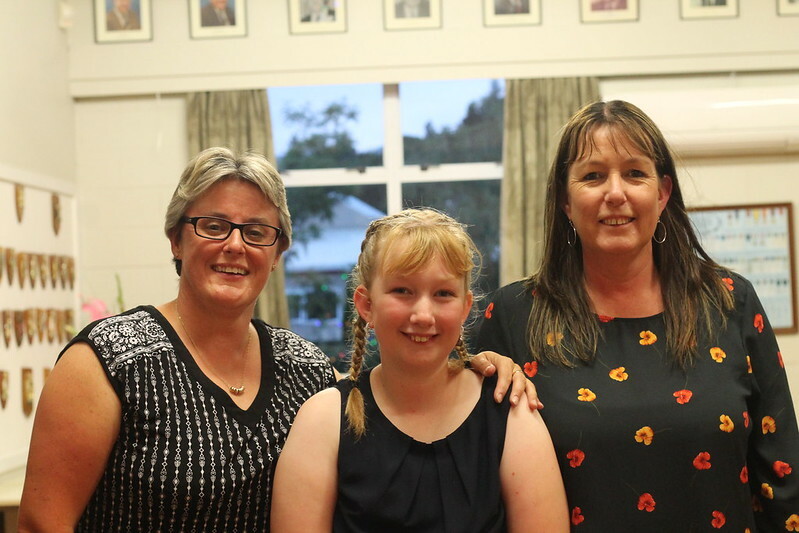 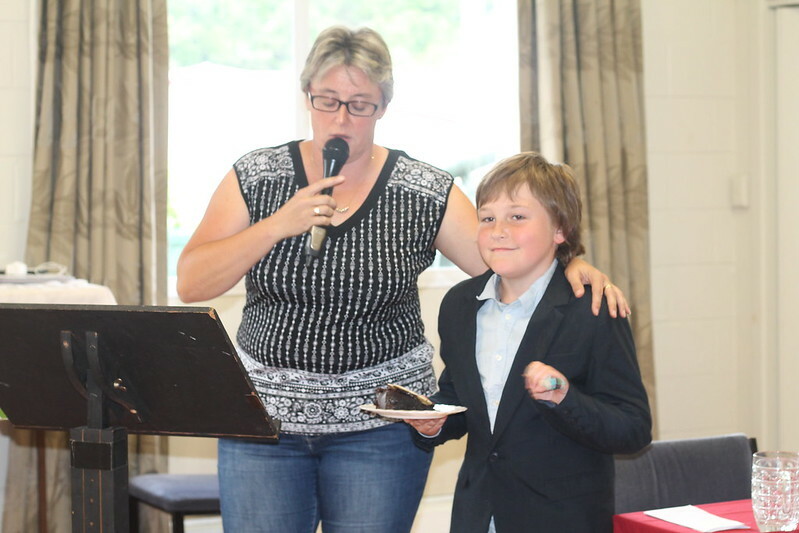 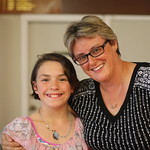 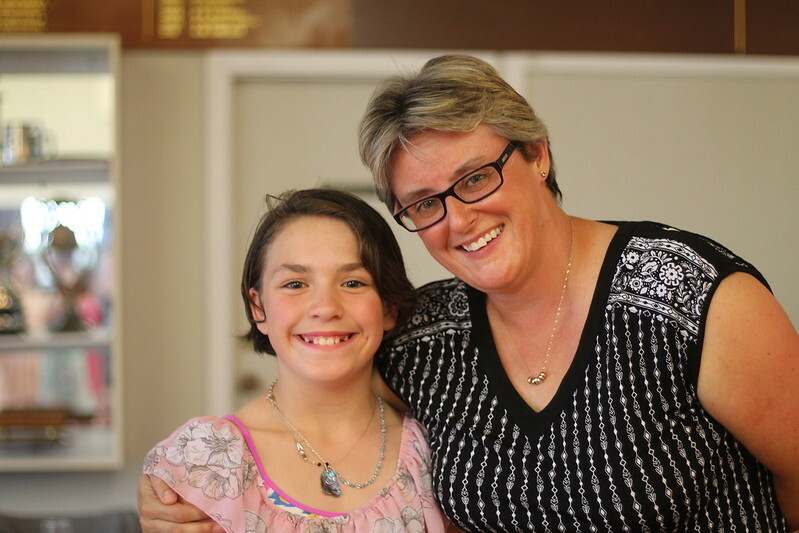 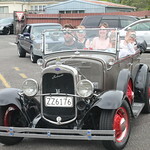 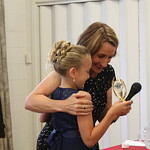 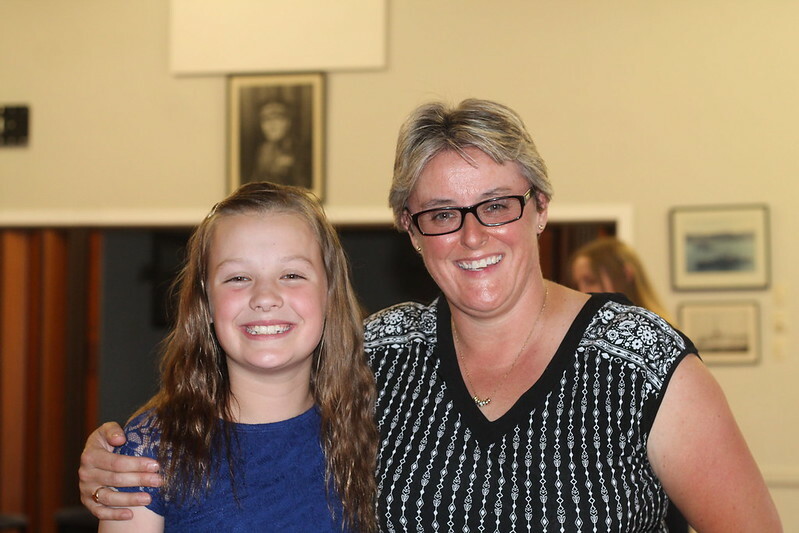 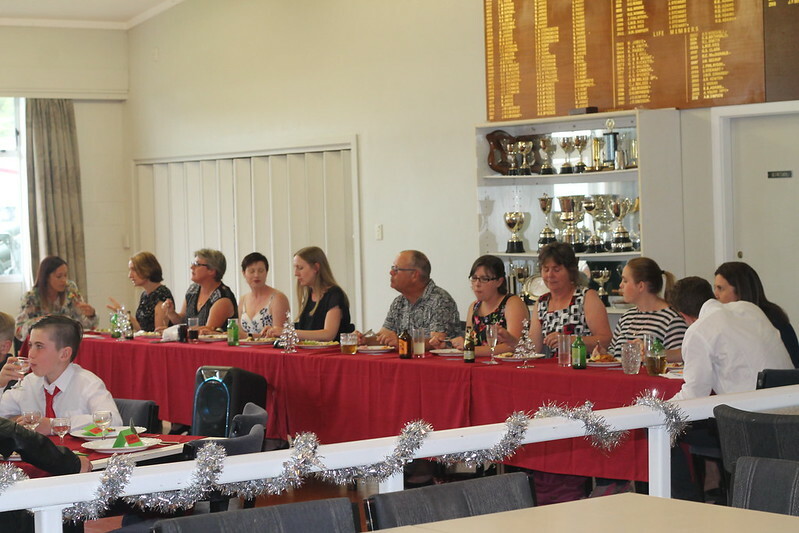 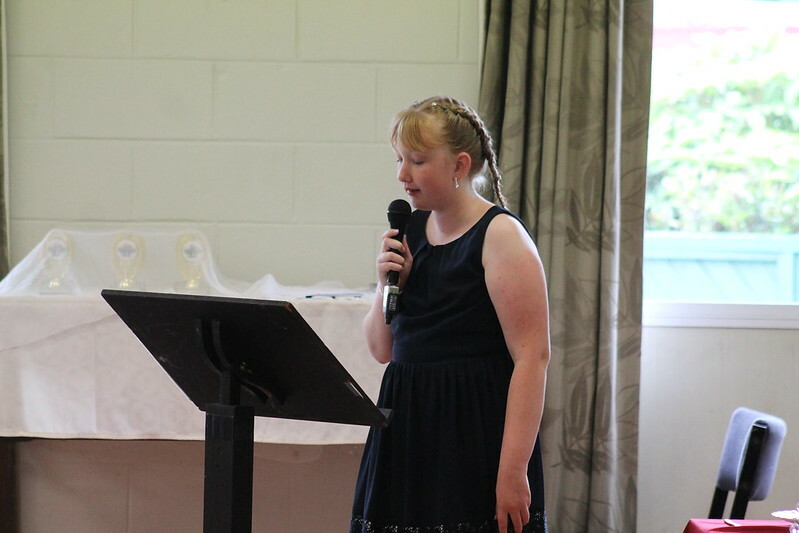 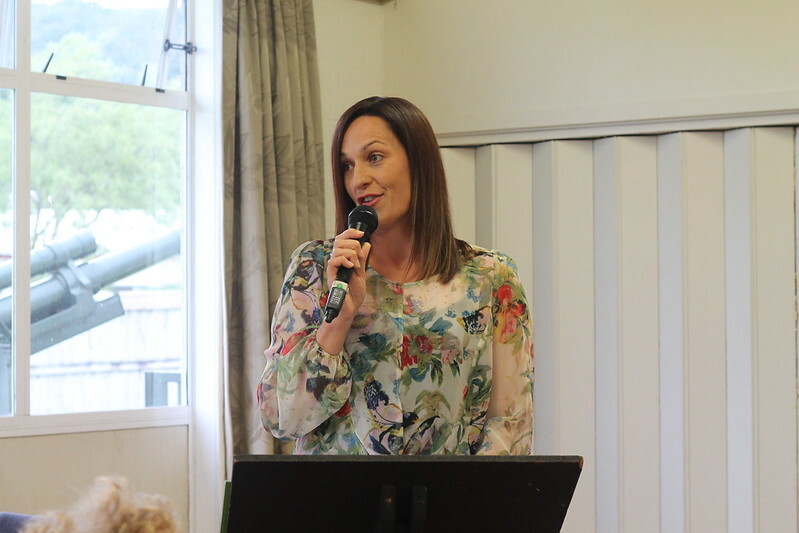 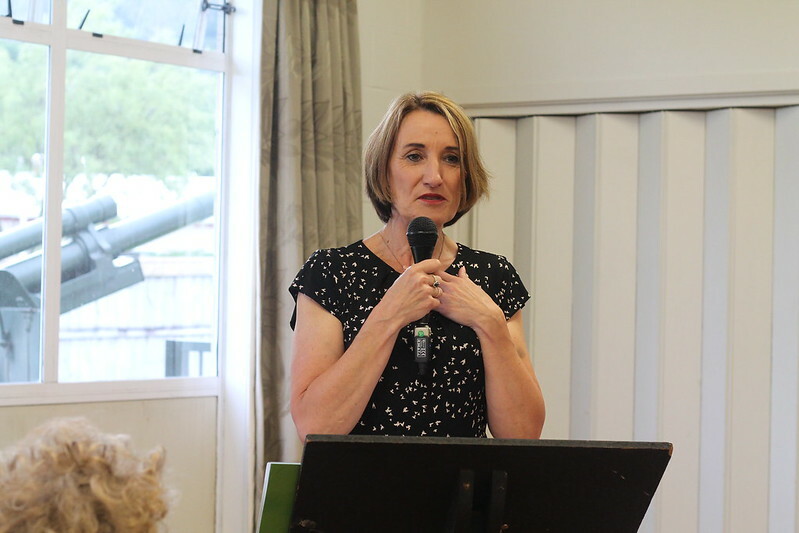 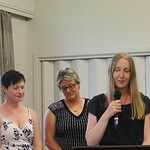 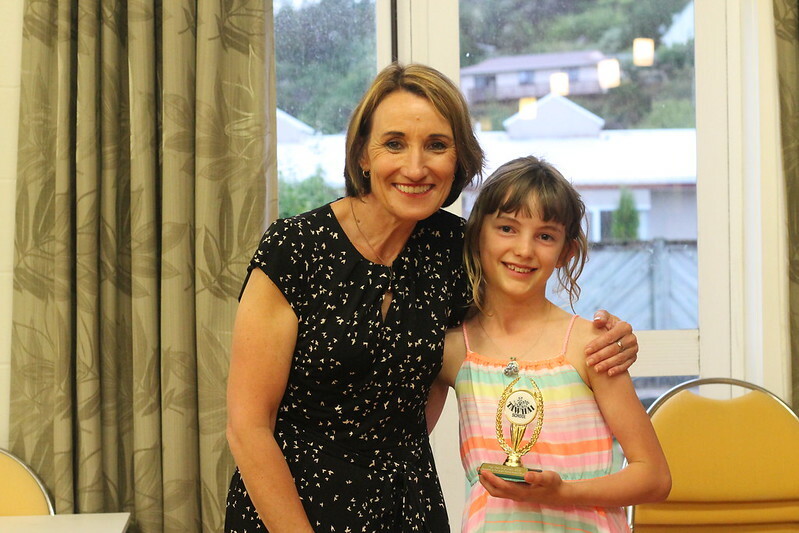 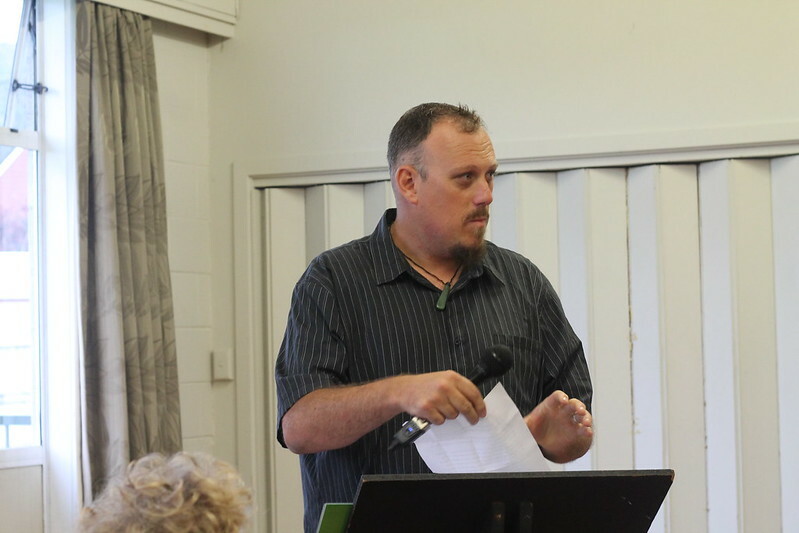 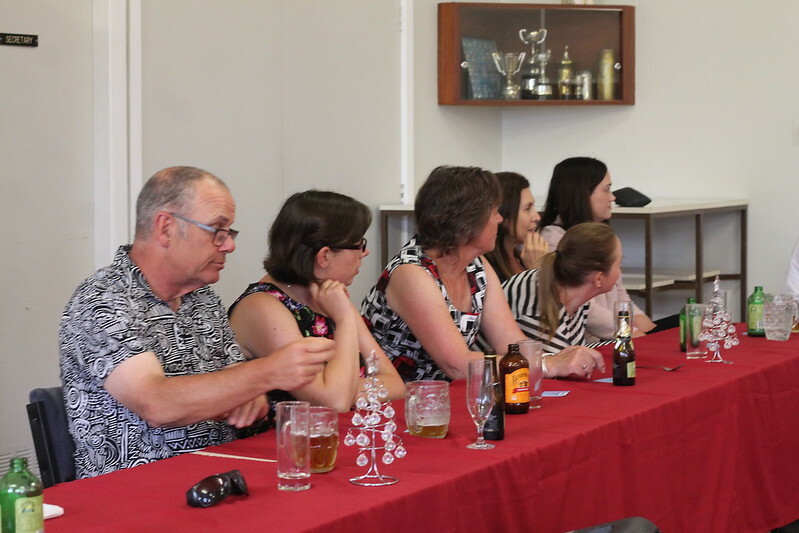 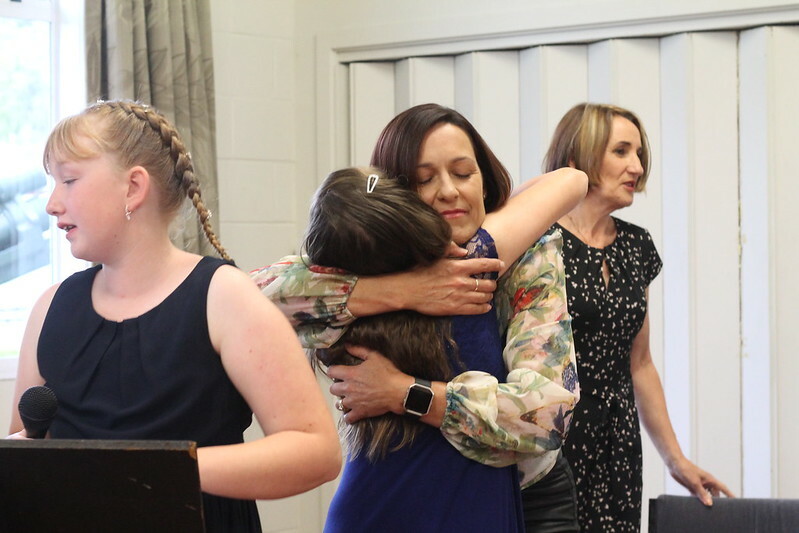 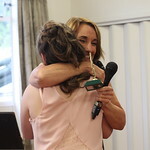 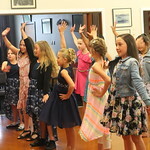 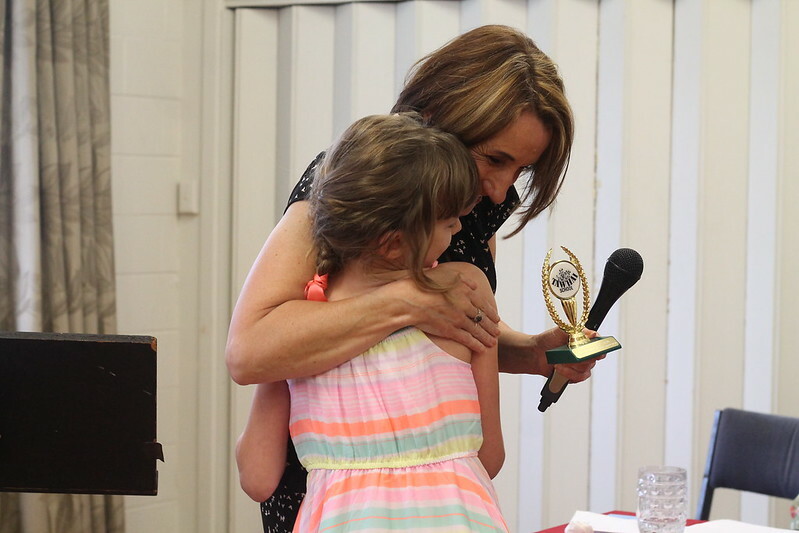 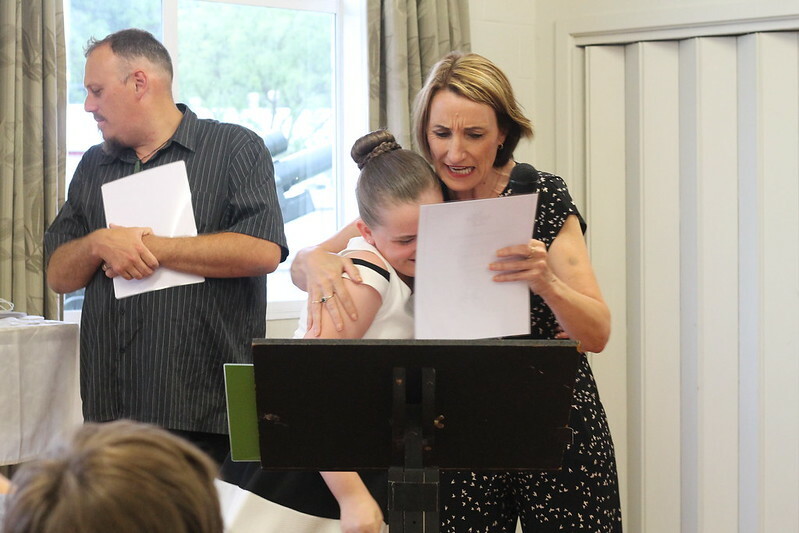 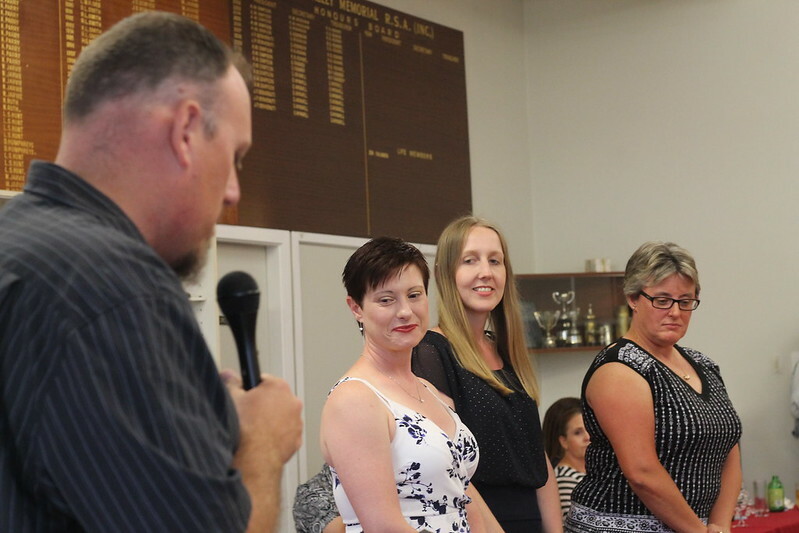 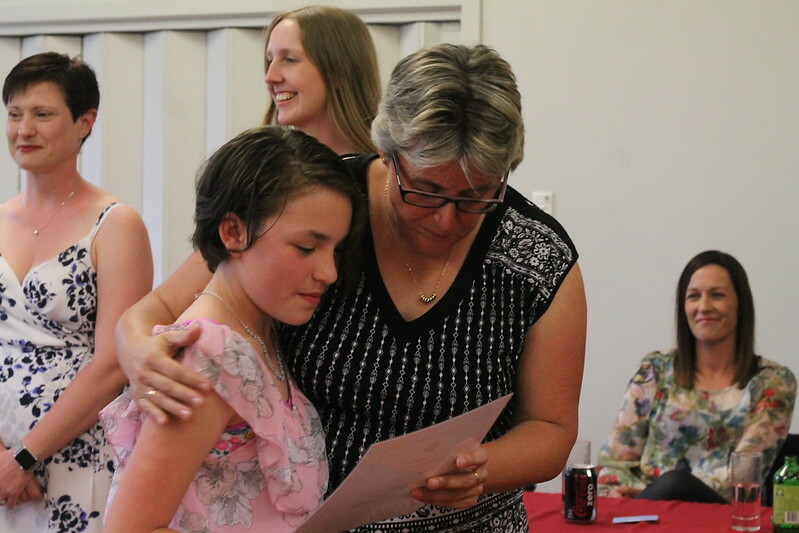 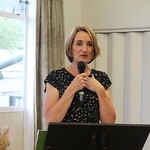 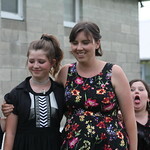 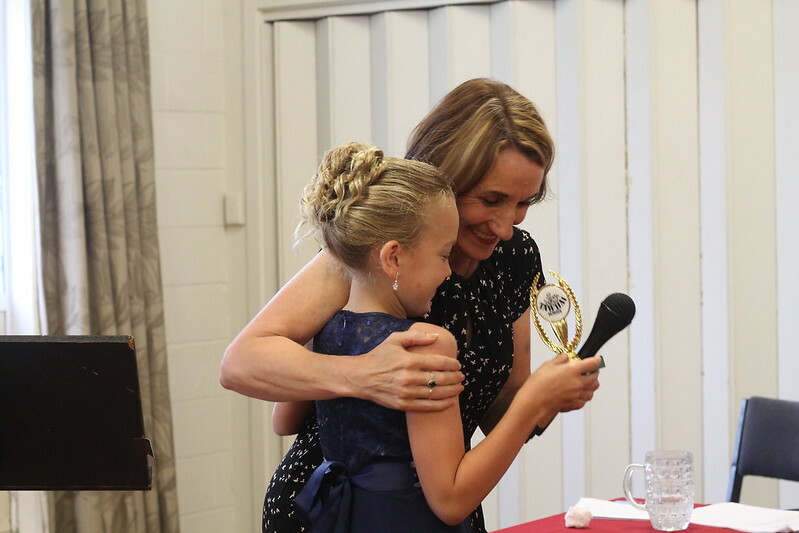 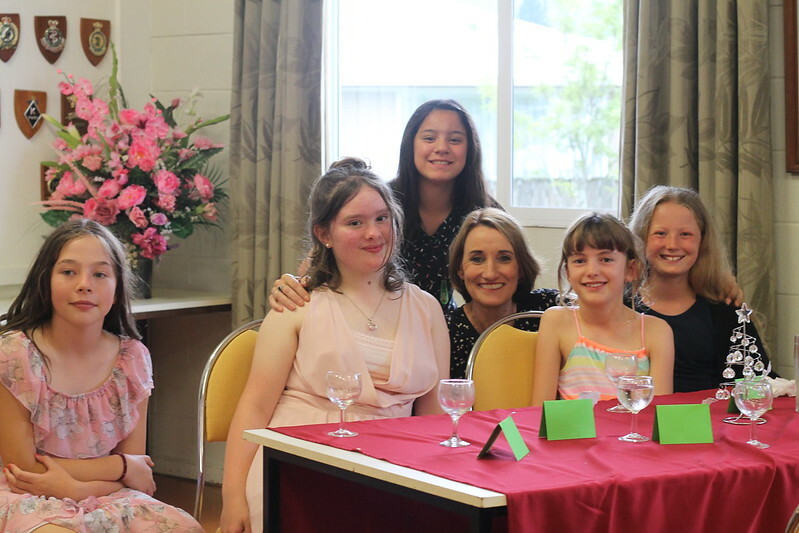 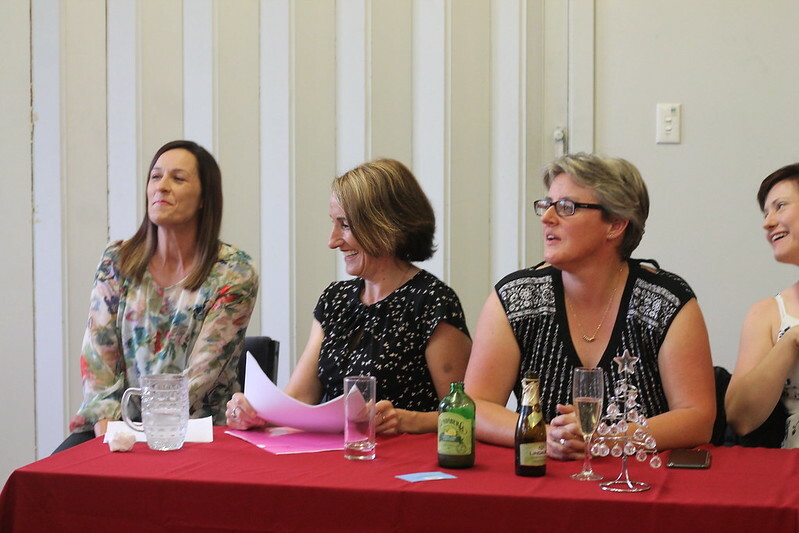 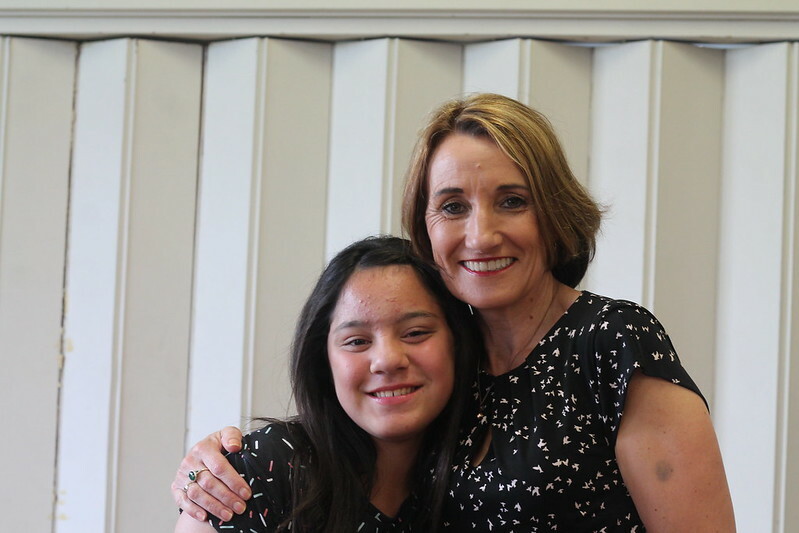 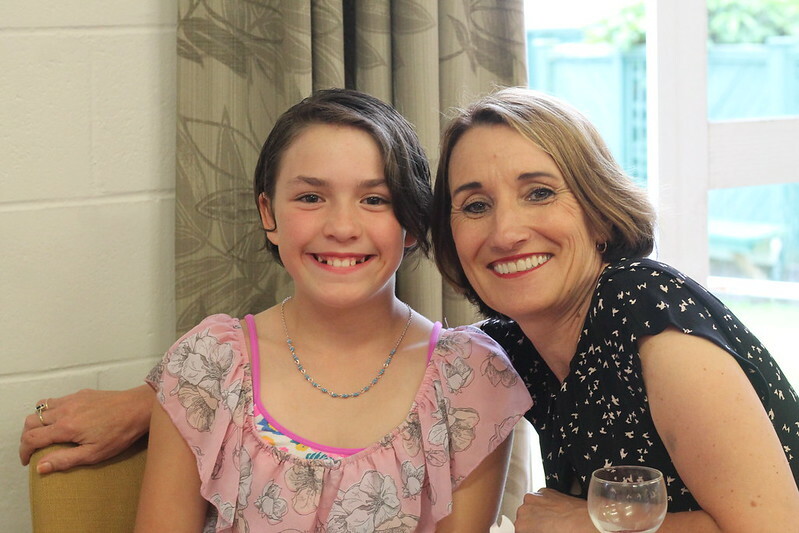 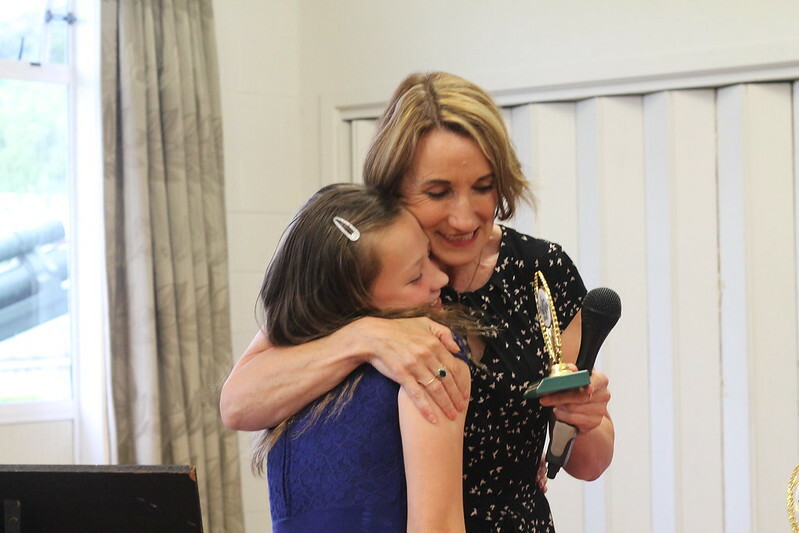 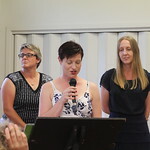 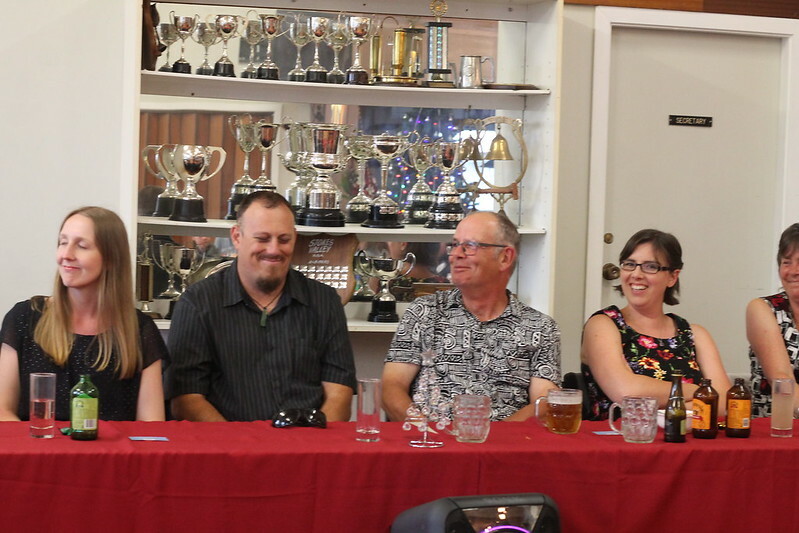 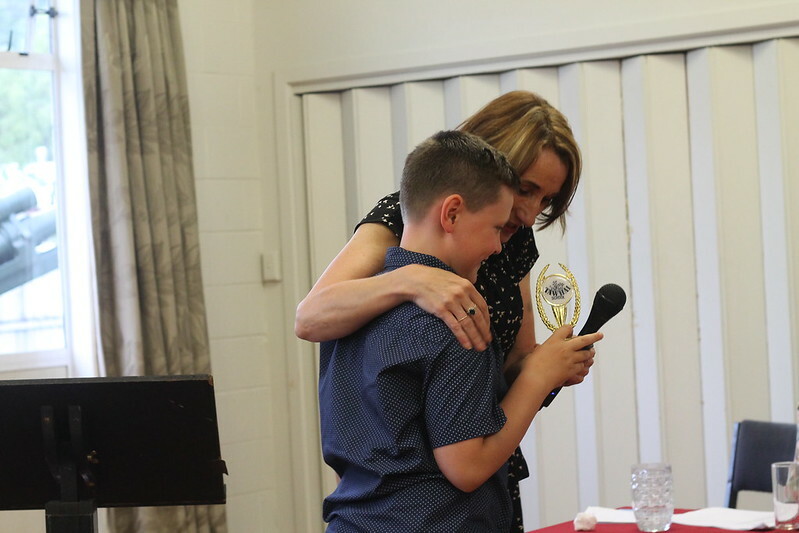 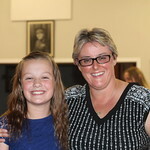 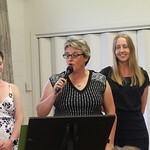 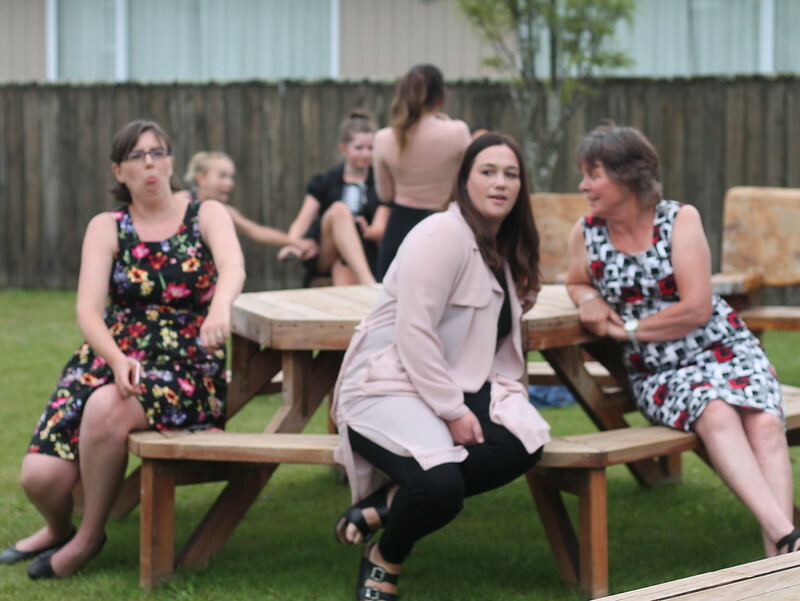 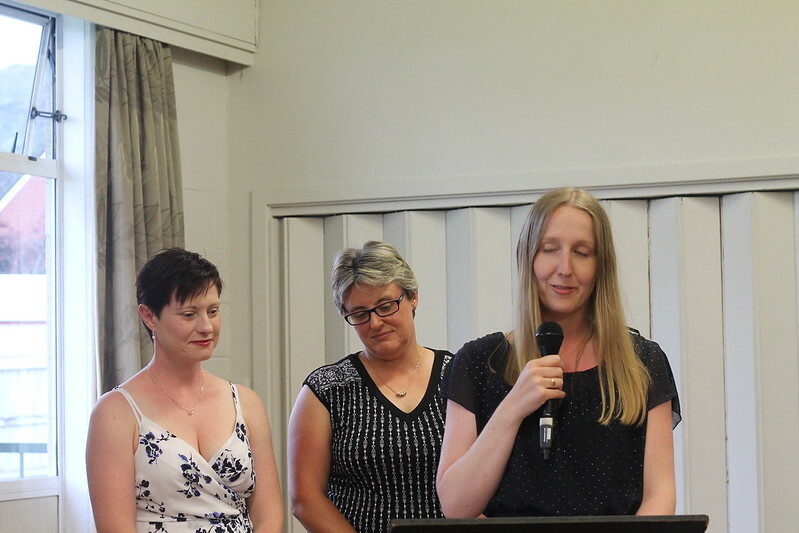 We had great speeches from Principal Karen Poole and our Board Chairperson, Angela Whitmarsh. 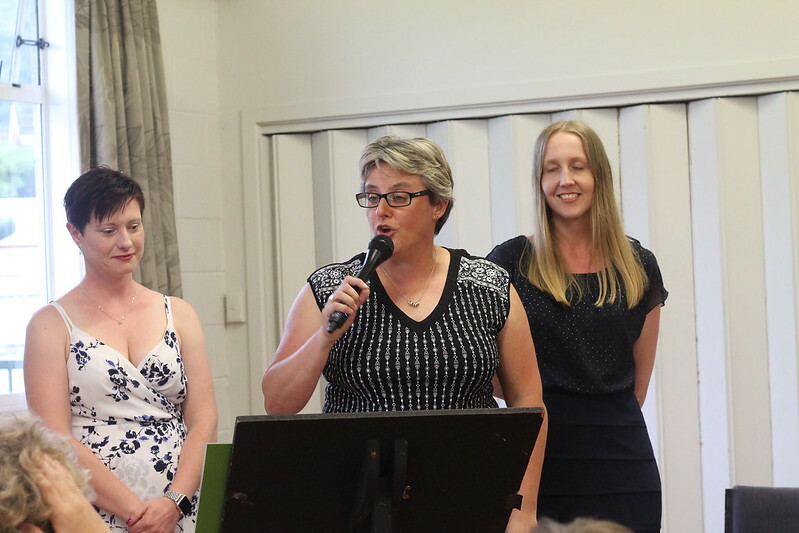 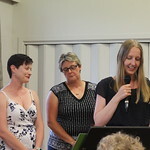 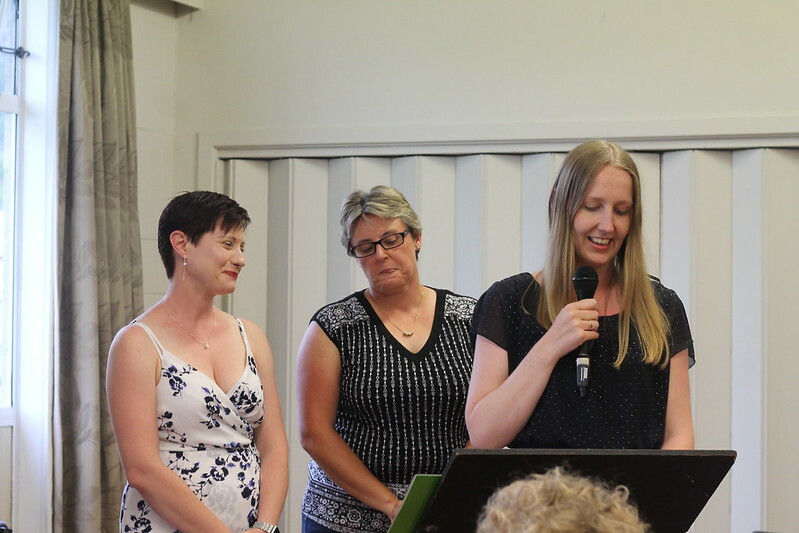 Senior teachers, Janette Page, Jeanine Huynh and Natalie Harbott recited a wonderful poem to the students. 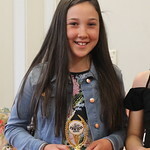 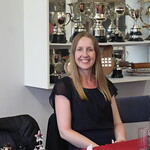 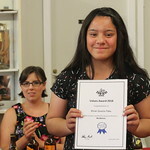 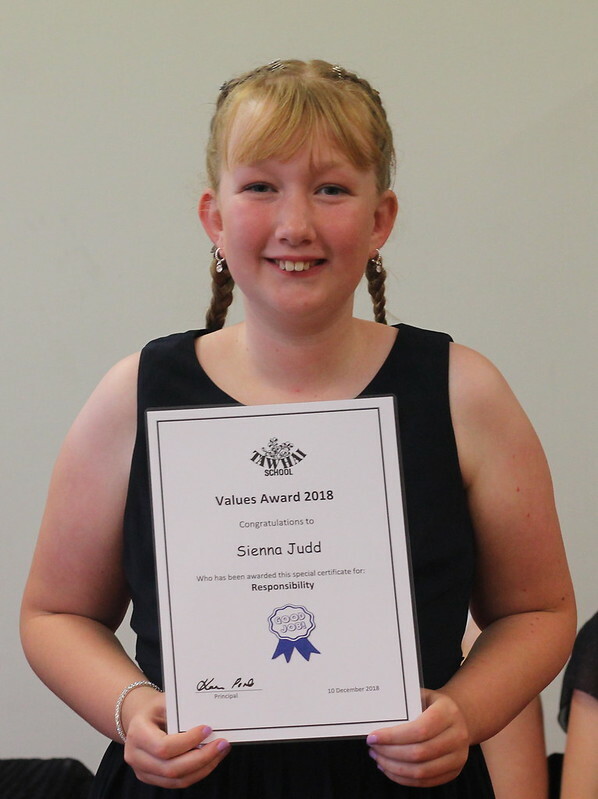 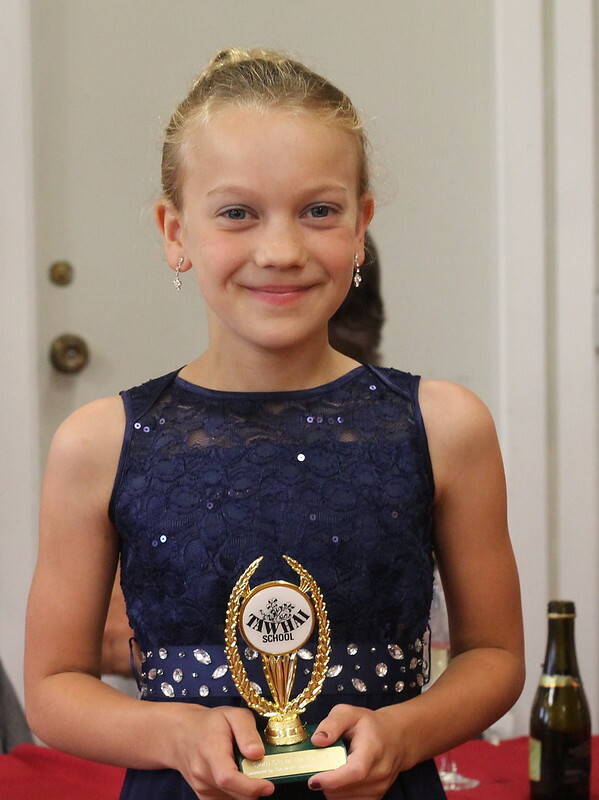 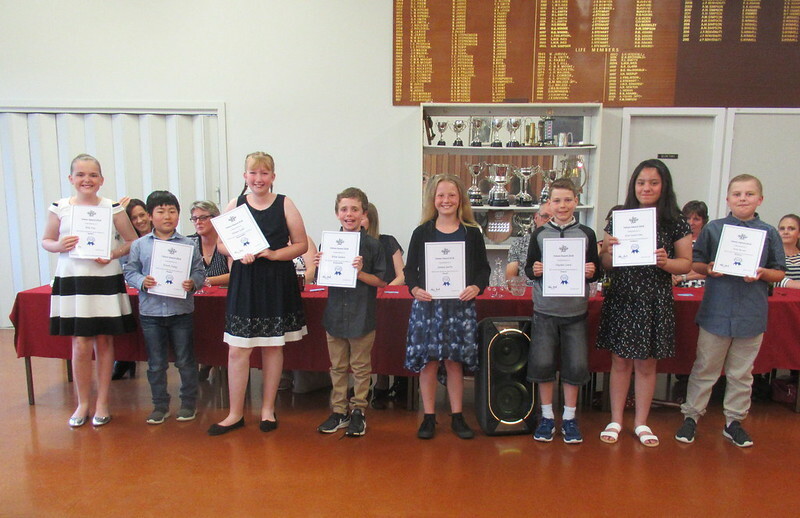 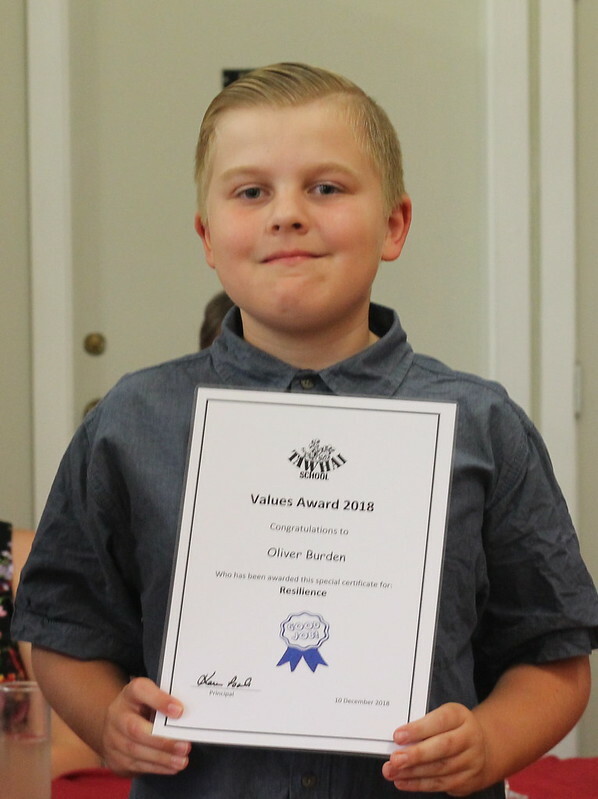 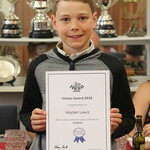 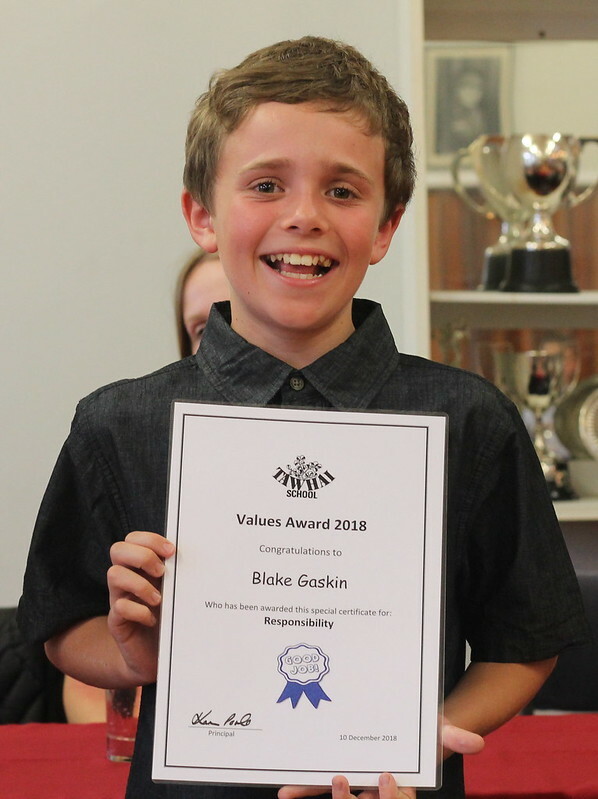 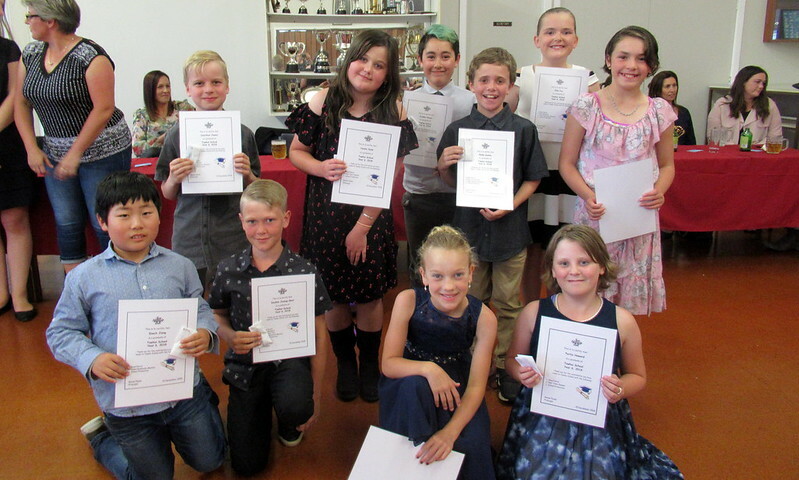 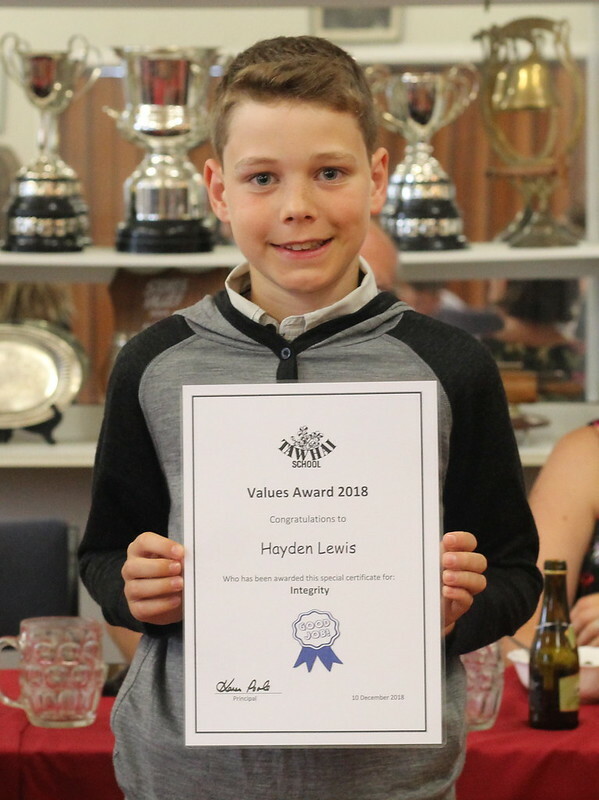 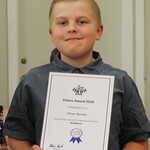 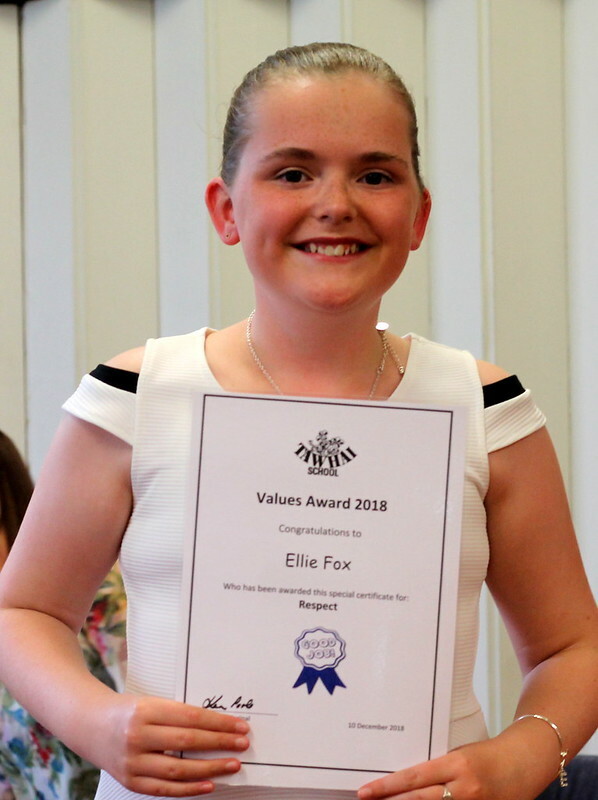 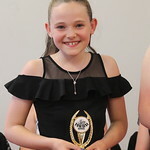 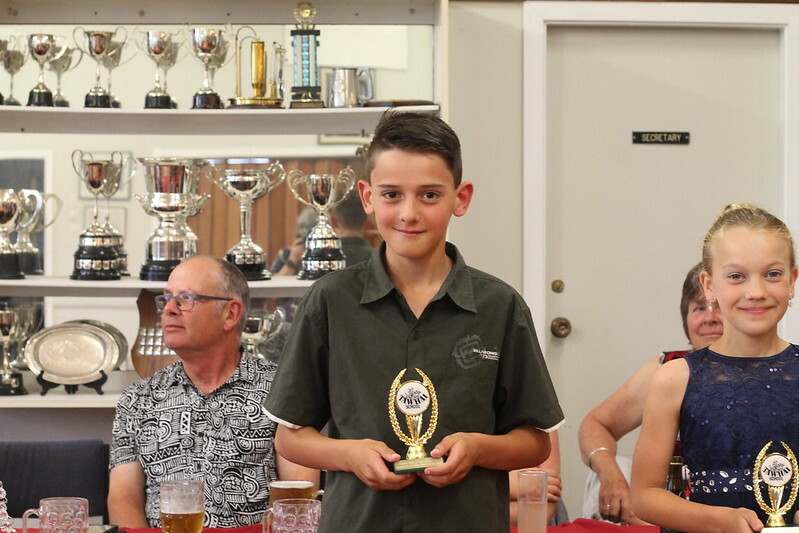 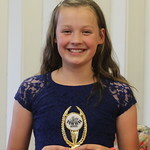 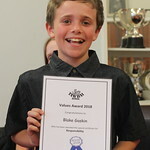 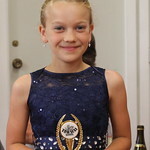 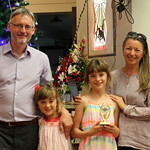 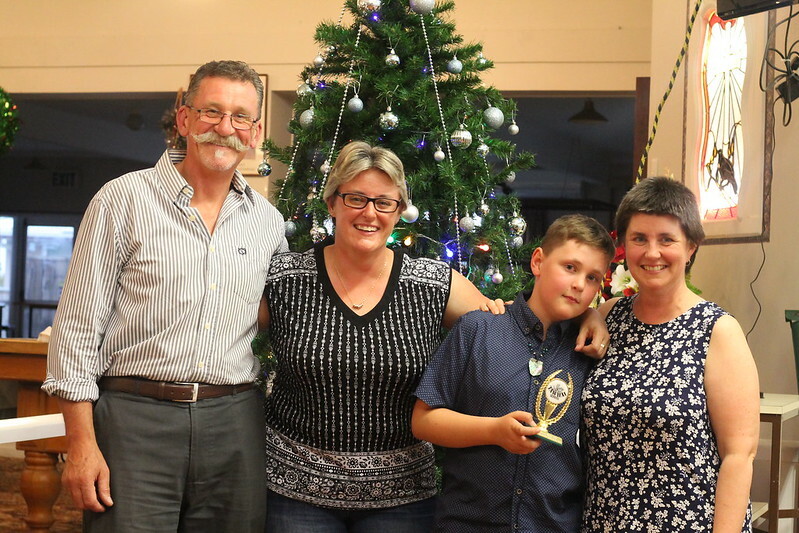 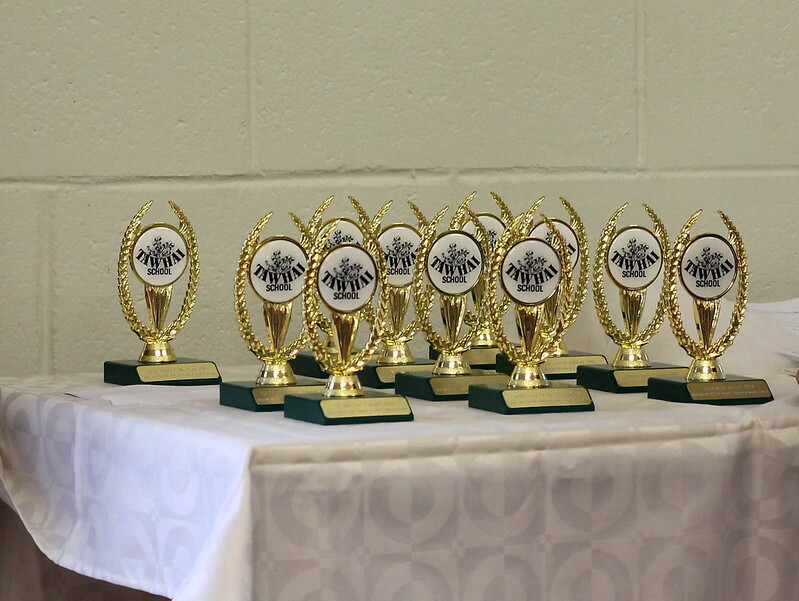 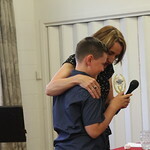 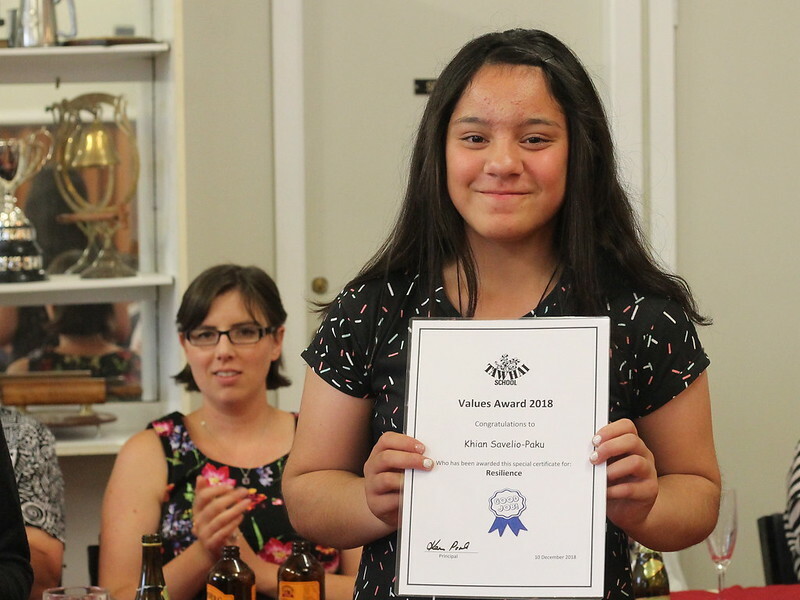 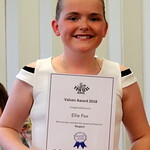 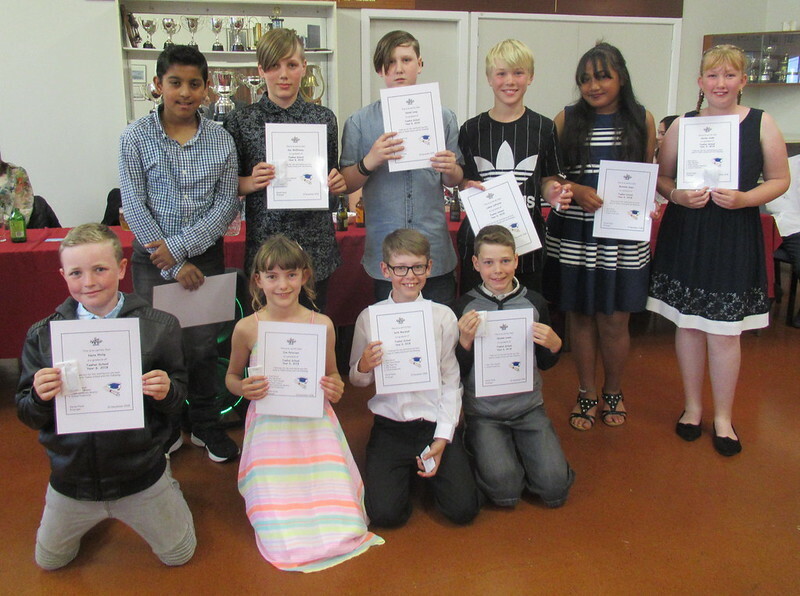 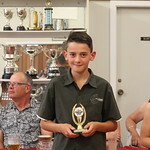 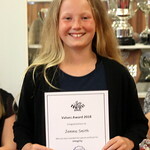 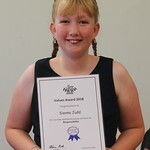 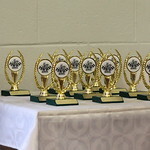 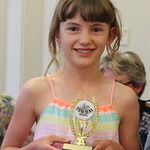 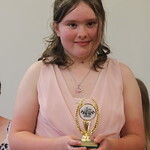 We then had the formal part of the evening, the trophies and the certificates. 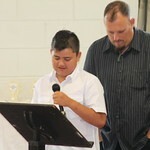 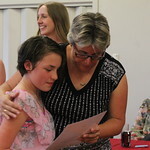 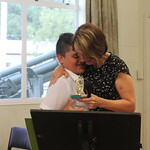 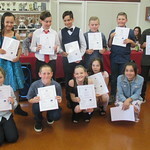 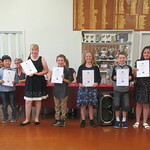 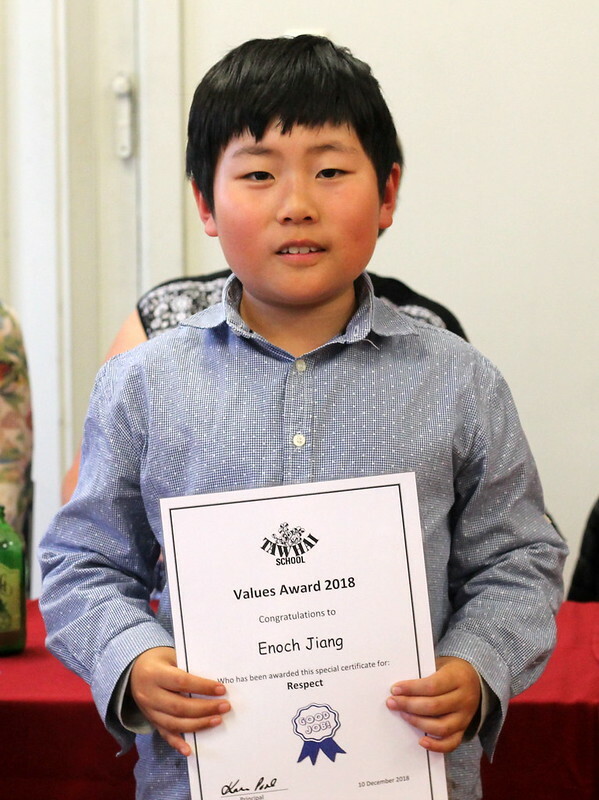 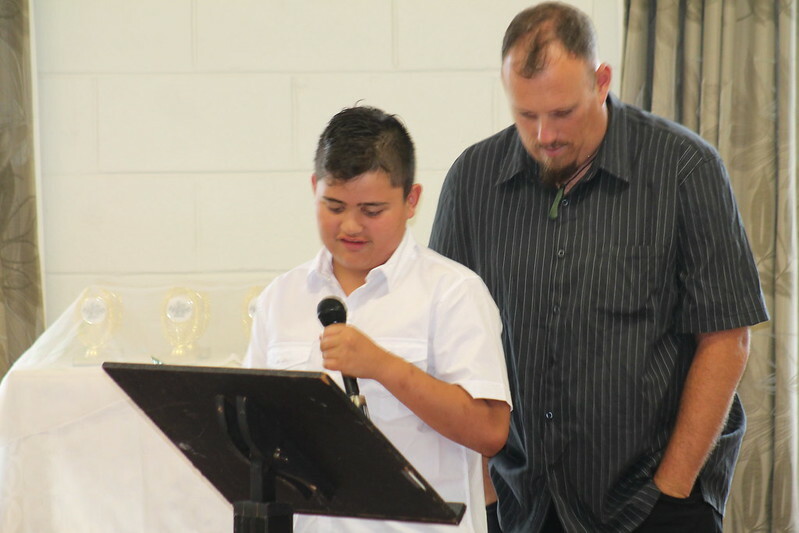 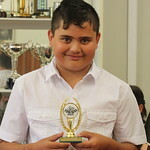 Congratulations to all student who were given awards. 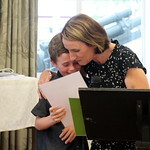 We also gave out the graduation certificates and a special gift to each student. 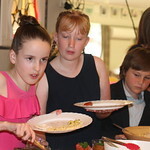 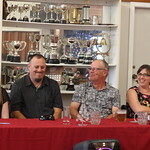 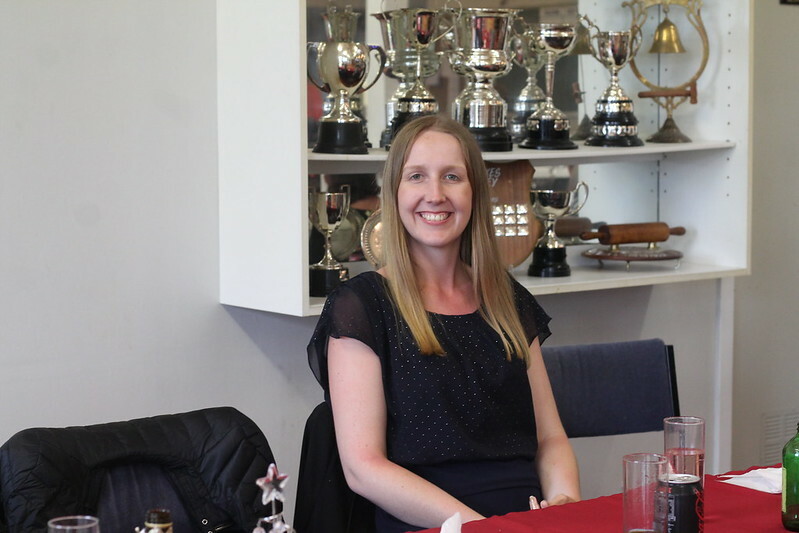 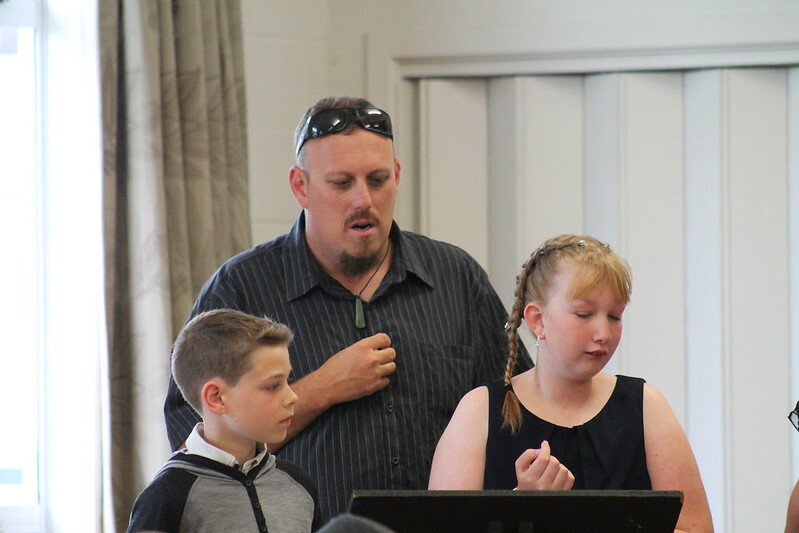 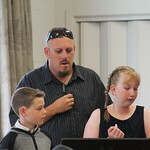 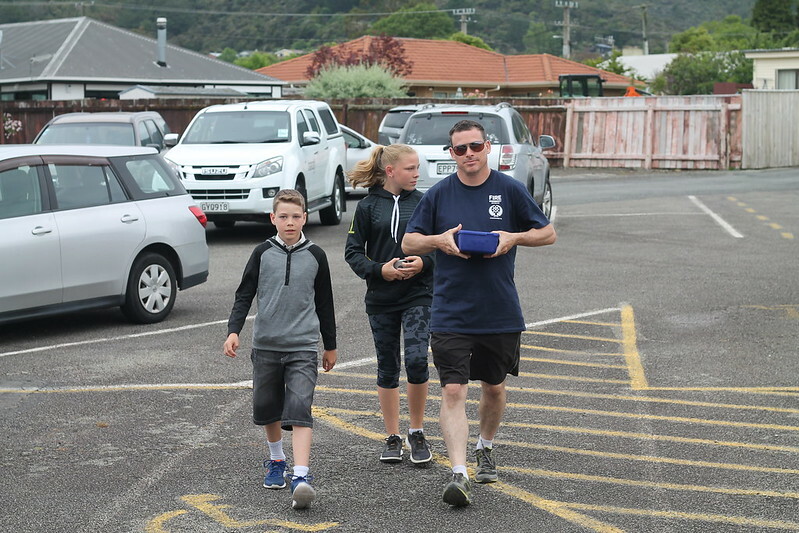 A big THANK YOU to Mr Whiteman for organising the evening with help from Mrs Boese, the student Council, the PTSG for sterling work in the kitchen, getting all the food ready, and having to deal with the massive clear up afterwards..